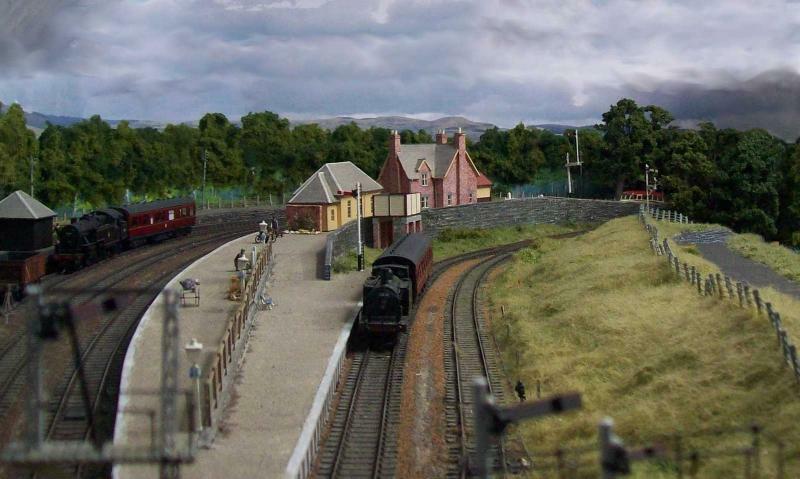 I am in the process of rebuilding my layout, based on two stations on the Far North Section of the old Highland Railway- Inverness- Wick- set in a slightly alternative 1950's decade. 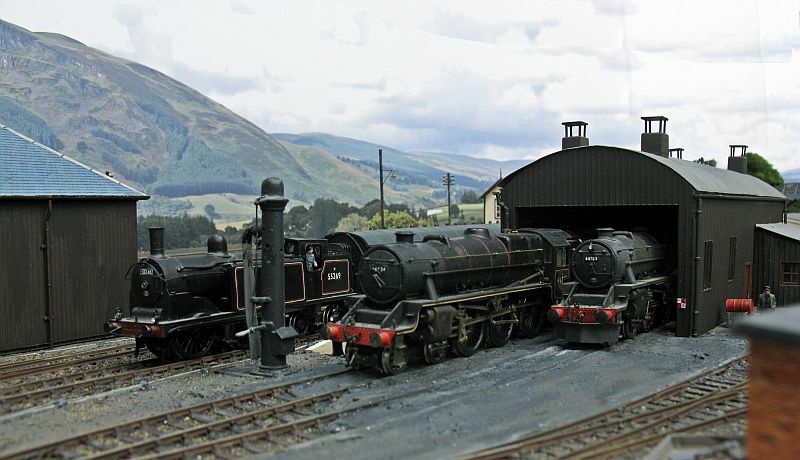 The stations to be modelled are Helmsdale and a terminus copied from Thurso, but with a beefed-up engine shed, to add a bit more play value . 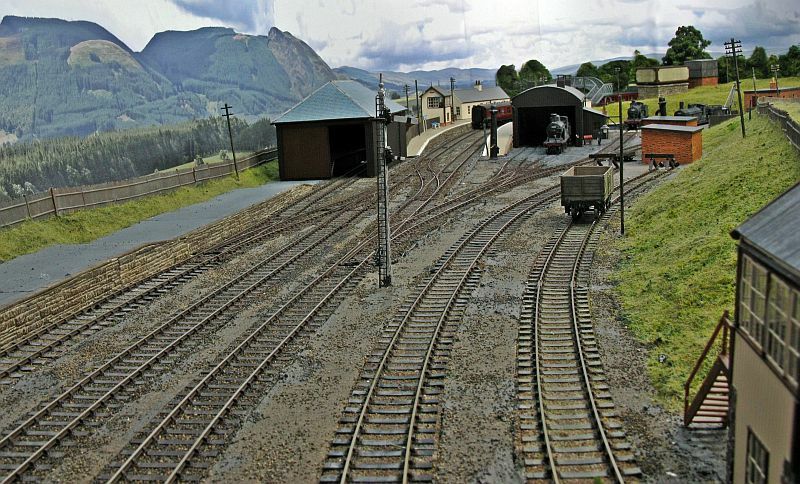 Construction started at the end of last year, and replaced a similar style set-up I had worked on for twenty years off and on, with The Mound junction and a terminus based on Kylesku. For various reasons this had run its course, so the decision was taken to start afresh. The last build has a layout thread on RmWeb under Kylesku and The Mound if anyone's interested, and I can post some pics of it here if wanted. At the moment the new build has its track work completed- a hidden continious run with some loops ant the two stations in a raw state waiting buildings, which are being worked on now,Once they are in place I am going to do the scenic side, but am trying to keep to one task at a time- far too easily sidetracked for my own good, and one of the reasons the last layout took so long. Anyway, here are some shots of things as they stand- the pictures should show the general scheme of things- two each of the terminus and through station. 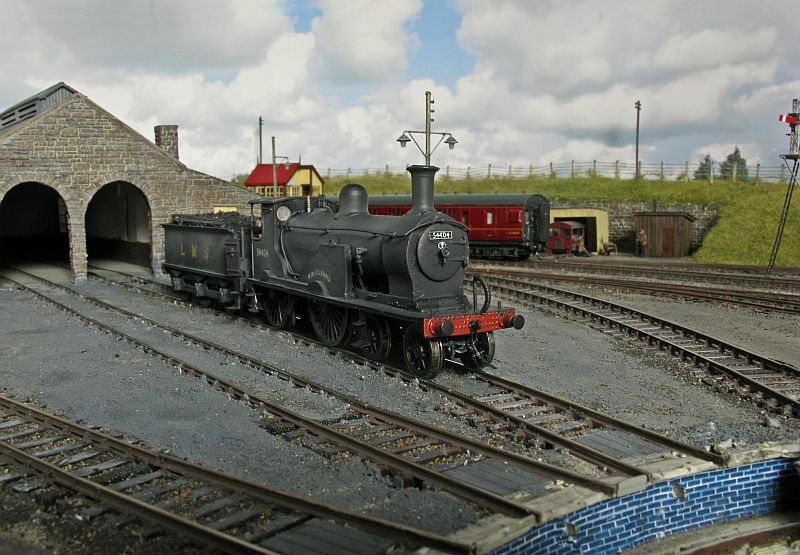 Helmsdale had a small loco depot and turntable till the end of steam, and had more operational interest than might be expected for a small rural backwater. Some very impressive trackwork there Ben. Plenty of scope for operation. Some very impressive backscenes too. Very nice Ben. Look forward to watching your progress. Impressive, Richard. I like the way the back scene seems to fall away. If this is as good as Kylesku I will be watching with interest. Lovely stuff and I too must comment on the very appropriate and stunning backscenes. What are they ? Thanks for the kind replies, and I hope that I manage to make future work as well received as the last layout was. I was overwhelmed by the general response to Kylesku and The Mound, and in fact hesitated for over a year before I first posted pictures of it, and thought that it would be of a small interest for a week or so and then vanish from the public eye. As it was, it featured off and on on RmWeb for the best part of three years, and the exposure did more to improve both my output and quality of work in that time than the previous fifteen years of solo modelling, and proved to me ,as a natural lone-wolf modeller, the benefits of web sites such as these for improving ones game. 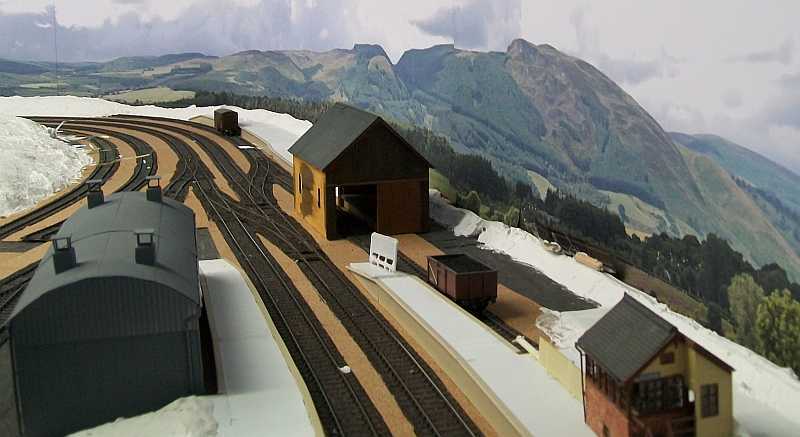 When I started this current layout one of the aims was to correct various things that I had failed to do on the earlier one, and also to incorporate some of the advances of recent years, and the backscene was an important part of this work. Kylesku had none at all for years- my artistic ability being basically nil, and photostitch programmes a thing of the future- but eventually a smaller version of the Helmsdale scene was added. This threw up several ptoblems due to it being fitted to landscaping that was in place, and never worked as well as it could. So, this time the backscene has gone in first and the scenery will follow. They come from a range done by Art Printers and International Models also sell them. I used the 15" version, with the too verdant bottom 3" cut off, to give enough sky to help with photography- this was another drawback of the last set-up- digital photography changed the way images could be taken and processed, and this is another aspect that is being incorporated into the build. The last one had a smaller one, which wasn't enough to get a good shot, and eventually an extra layer of sky was added which meant some electronic "painting" was needed to blend the two layers. Photoshopped backgrounds were not an option- beyond my techie abilities for one thing and the railway room gets some nice natural light which gives a far more authentic "feel" than some called-up skyscene. 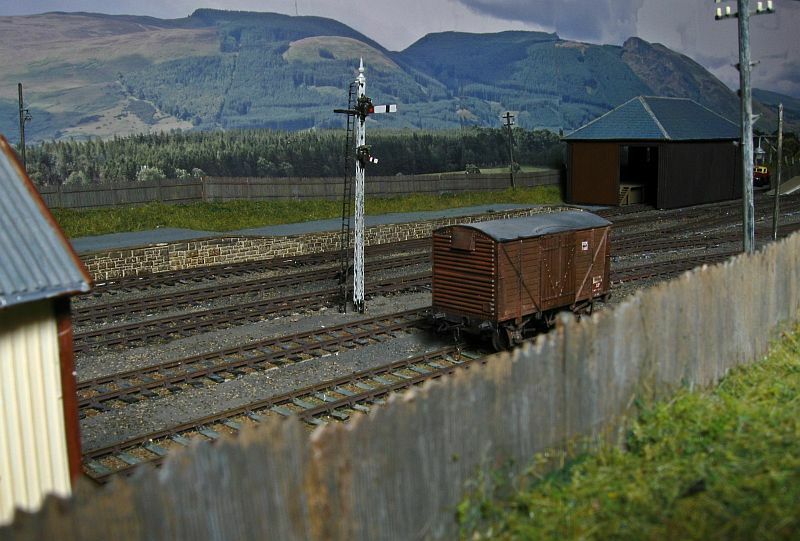 There is not much point going overboard with pictures until some more scenic work is done, but here are a couple of the station end of Helmsdale. I have only modelled a small part of the platforms, to allow for some plain track to give some idea of space, and feel that platforms can overwhelm a small layout, esp. if a more rural scene is being created. 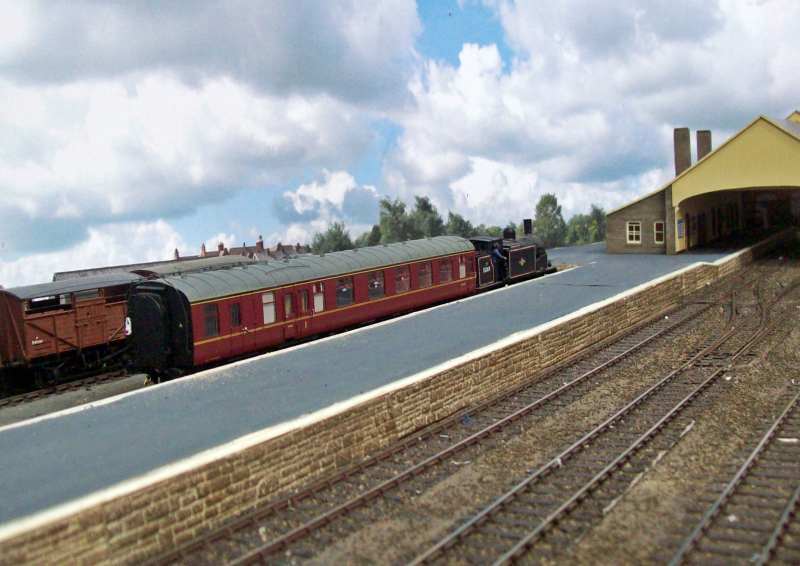 Of course, I have gone the opposite extreme with the terminus station, but is needed here to satisfy my shunting wagons around desire, and it is more of the nature of the terminus to have the platform modelled, certainly with this station. The run-ins of the two stations are on a loop behind the backscenes and adjoin each other, so only one can be worked at a time which is not really a drawback as this is a solo operation, and it is this track arrangement that has enabled me to get the two stations tucked into the space available-c 11' x9'- and manage to avoid too many tight curves. A photo here shows the arrangement. Hope this sets things out a bit to explain something of what I'm aiming towards. What you've done so far looks very good, Richard. I see you are also suffering the perennial challenge of lumpy back scenes. I love that sweeping curve through the station Ben. MaxSouthOz wrote: What you've done so far looks very good, Richard. Yes, the only bit that wrinkled, at the most important viewpoint - it won't be too much of a problem in finished shots though- a dabble with the smudge brush will blur it away. The backscenes were fixed down with Photomount onto mount board, and I think it appeared as a result of me being too impatient to put the curved board in place -should have waited overnight for things to dry properly! Petermac wrote: I love that sweeping curve through the station Ben. The station itself has curves through the platforms though mine start a bit earlier. 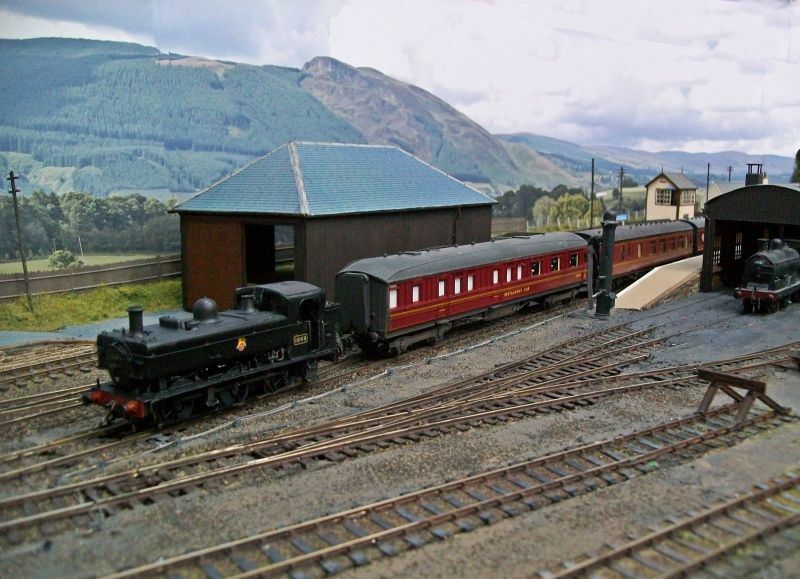 There is a nice small website section showing the station at various times- http://www.helmsdale.org/station.html takes you there, and you can see what I am trying to do. 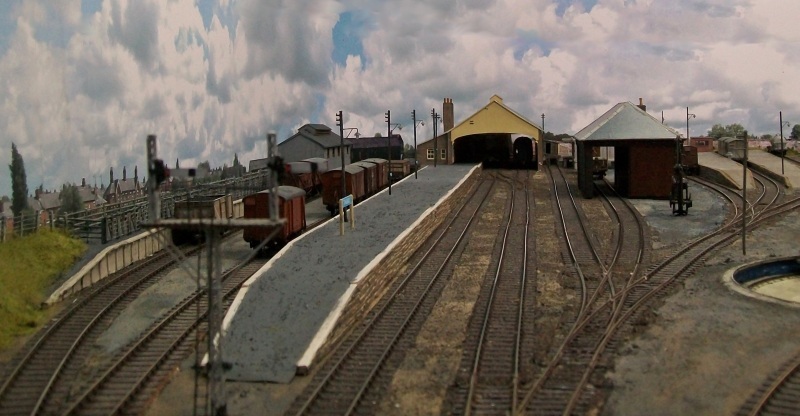 The shed area has been shifted about a bit to suit the space available, but that's normal for model railways, in my case, I'm afraid. Sorry for the disjointed replies- I haven't worked out how to get multiple quotes into one reply, or how to post links for that matter, but I daresay I'll work it out somehow, given time. Oh, the overgrown heather was the results of trying shredded paper as a bulker- a once off, I can assure you- after that it was crunched-up kitchen roll- far tidier! The surface was Sculptamould, and is a easy, clean way to apply a plaster type surface- one coat and its as hard as nails. Unfortunately, the Helmsdale link doesn't work here in France ....................... is there something missing ? Just arrived at this layout. I echo what others have said about that mountain scene backdrop. Looking forward to more pictures and progress. ddolfelin wrote: Just arrived at this layout. Yes OK DD - you've made your point !!! Careful Peter - or you will set him off yodelling too. He's not Frank Ifield in disguise is he ? I'm terribly sorry that your thread has been hijacked, Ben. Unfortunately I have no control over them. 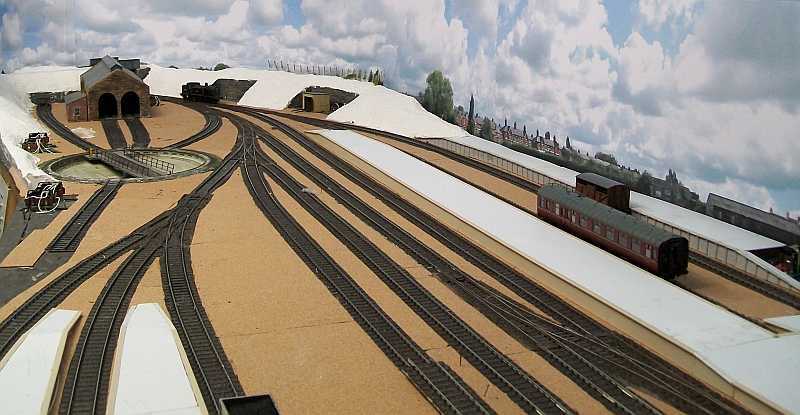 Love the station on that sweeping curve, even before it's completed the depth to the whole thing looks great, can't wait to see it all greened up. I will watch this thread with great interest as Kylesku and The Mound has been one of my favorite layouts. Keep the pictures coming! 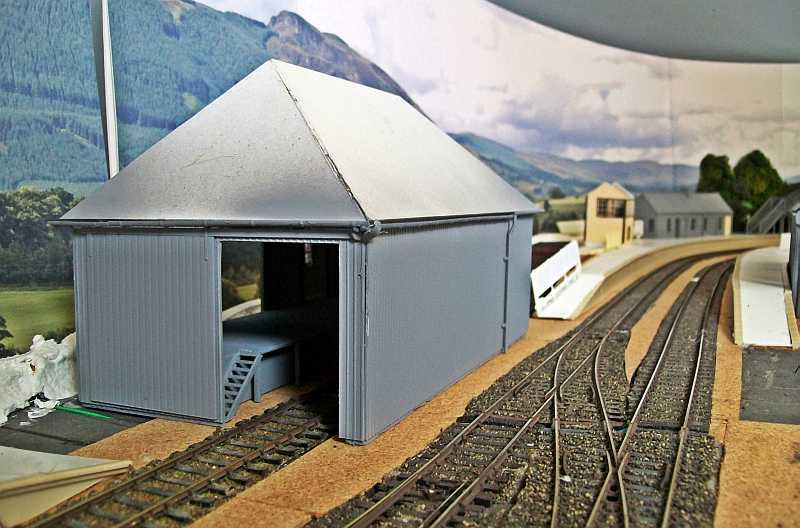 Work has been continuing on the layout with construction of two similar goods sheds for the two stations, and they have reached the stage of getting a coat of primer, with the bulk of the work on them now done. I am still pondering the roof covering- slates- and am thinking of using a new range of pre-coloured paper ones as I cant face the thought of cutting individual strips of paper. I'll keep progress on this posted. 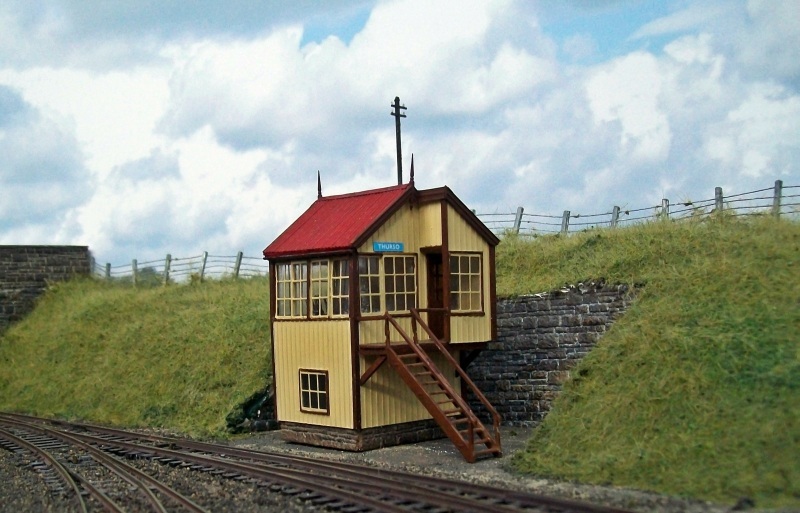 I haven't managed much modelling recently, but some work has been done on the second signal cabin, and here is a trial fitting in its eventual home- still needs a lot done on it, but its getting there. Is it going to be a snow scene? Don't worry- summer will come- I want to get all the buildings done in a batch before I move onto scenics as I can get sidetracked all too easily, and I have more or less laid out a plan of action for this build, aware of the fact that I don't have the luxury of decades to fritter away anymore. It's looking very good Ben. That backscene improves every time I see it. I do like the backscene, and I went for the 15" version to get maximum impact. I used the smaller one on the last layout, which worked as far as the eye went but photography showed up its limitations and I had to resort to using the cloning and smudge brushes to extend skyscapes to an effective level. Hopefully this will not be needed so much this time round. Here are the two cabins. It looks like an intriguing snowplough - plus the topping on the tender ..............is it your own design or did they actually exist ? 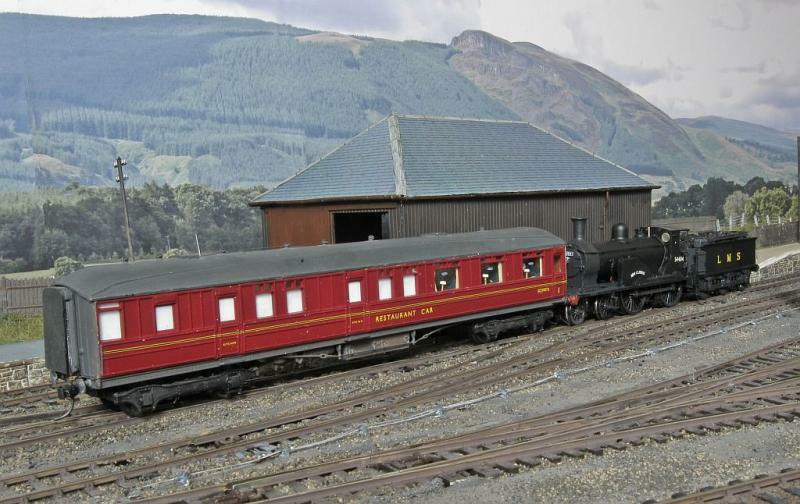 It did indeed exist, and is based on the LMS 4F that was the Fort William snowplough latterly, although they also ran on the Highland line as well. 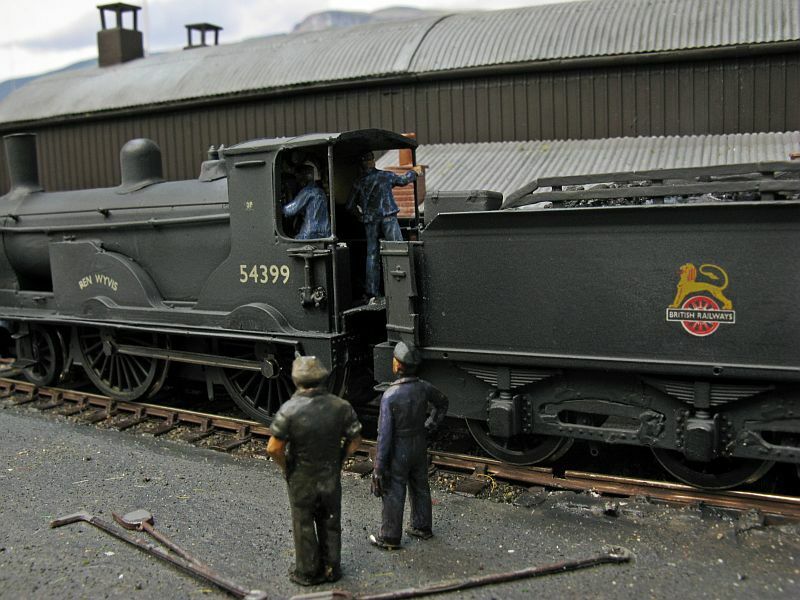 The tender covering was to protect the coal and crew, from snow and is a white metal kit from Genesis Kits, I think. 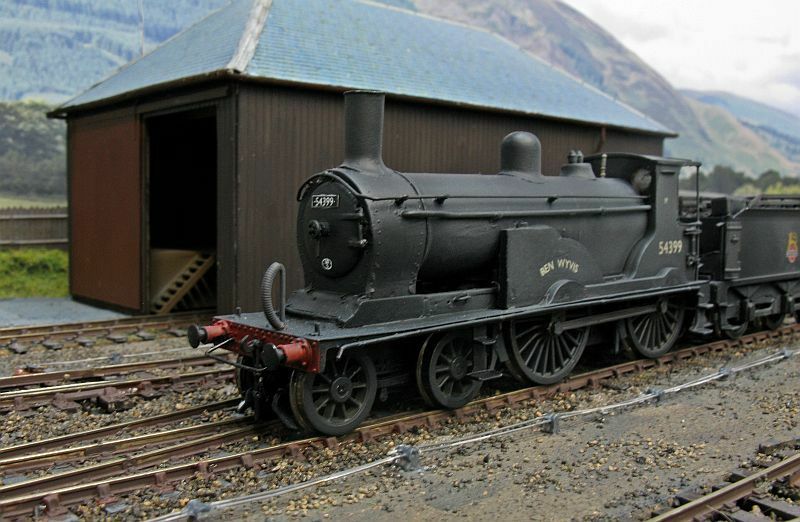 It is a non-powered dummy at the moment, and usually just sits doing nothing at the back of the shed, as did the prototype in fact, but I plan sometime to motorise it- just waiting for the loser in the 4F wars to drop enough in price! Looks to be an interesting layout. Looking foward to see the landscape evolve from here on. I do like the back scenes. Are they the ones available from ID ? 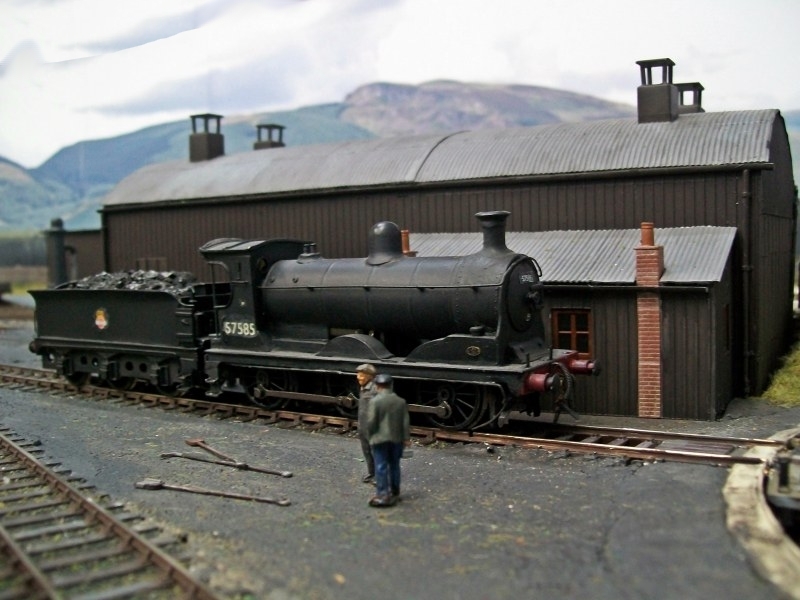 What did you end up using for the good shed slate roofs? I have just taken a read through you thread and like very much what I see. 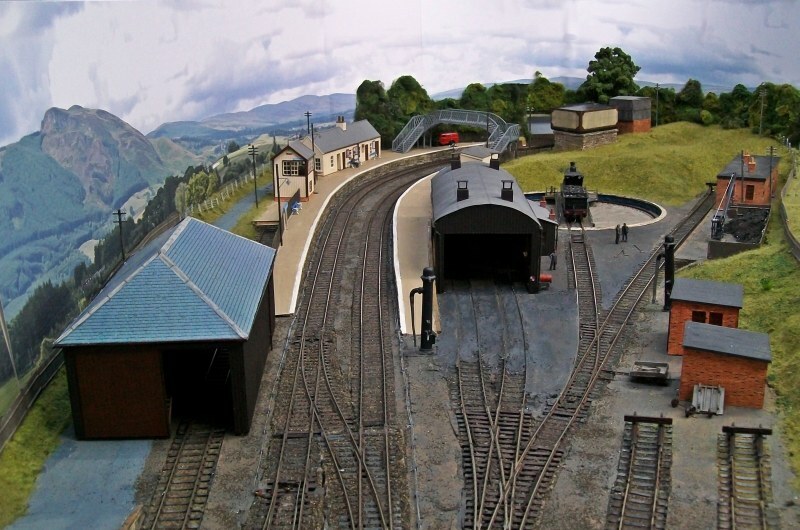 The two things that stand out for me is the spacious nature of the layout. You have got a lot in it but it does not look crammed. I also like the curves, particularly in the station. All to often they are dead straight (like on my layout) and yours have that extra touch. I am glad you decided bring your layout to the forum as I am having great pleasure watching it grow. 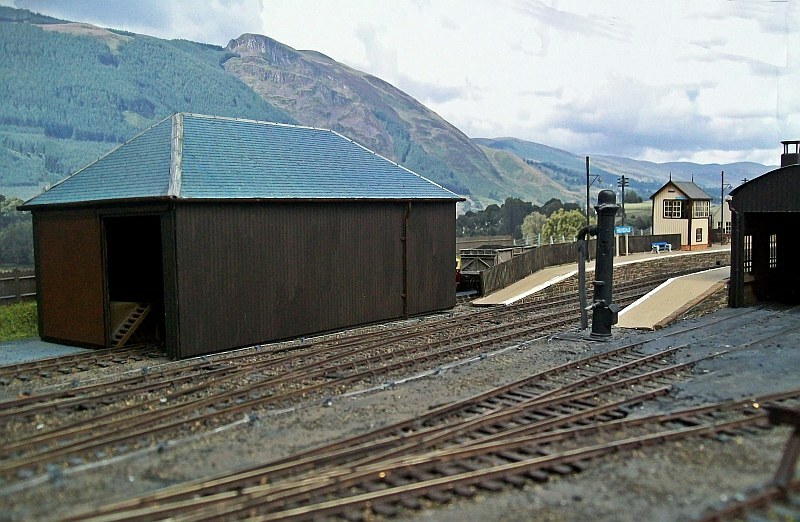 Sorry for not replying sooner- I have been busy finishing off the station buildings and getting ready for the landscaping phase, so have not visited here lately. My reply alert seems to have gone so was not aware of your kind words- thank you. The backscene is indeed the ID one-the 15" version, with a bit of the greenery cut off the bottom- and is a very useful piece of kit. 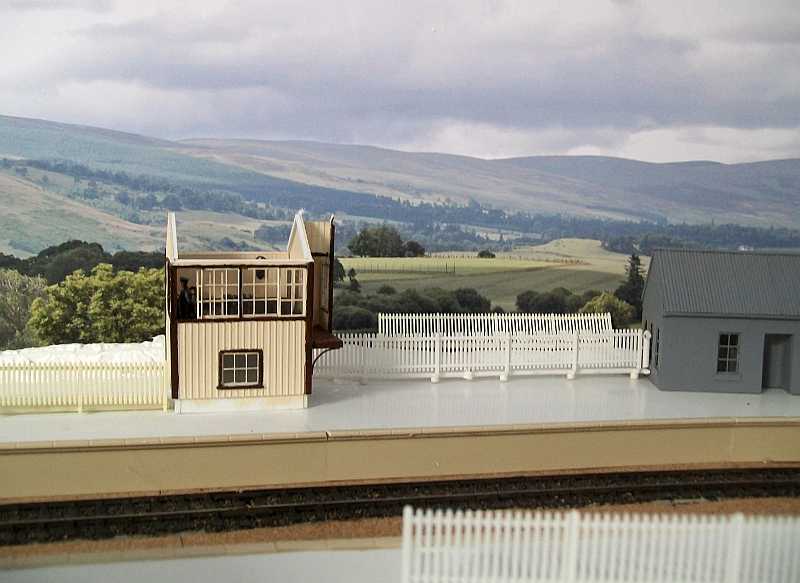 I have seen it used on many layouts based throughout the UK, and it always seems to fit into the area being modelled- I used a smaller version on my last layout but went for this larger one to get the maximum potential for photos without extra fiddling to an image. I have taken some liberties with the curvature at Helmsdale compared to the prototype in order to fit it in, but am pleased with the way it is starting to photograph up, and there should be more progress reports from now on as most of the buildings are now finished- the last one is the train shed at the terminus, and this should be sorted out in a few days. 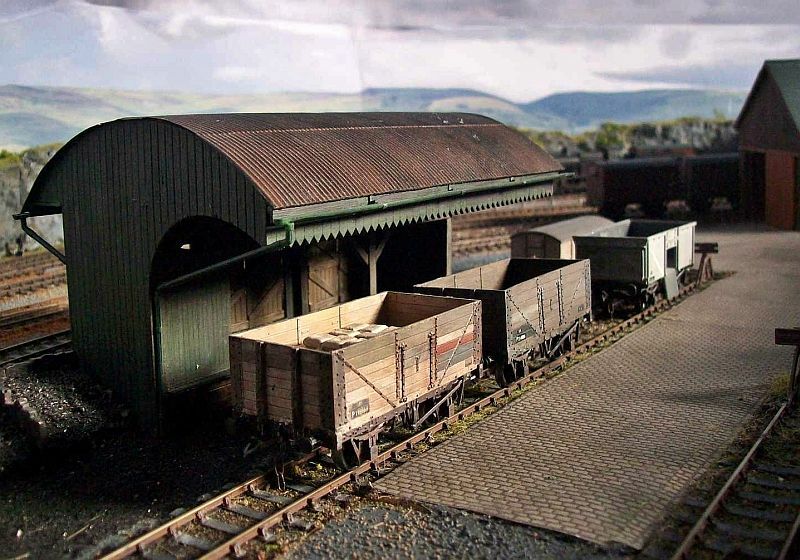 The goods shed eventually got paper slate sheet covering from a new set-up called True Texture- they're on the web- that have a nice range of surfaces available- and has saved a lot of painting , as I was going to use Wills plastic sheets, but decided that these were a good substitute. A photo is attached, and I hope to have some more to post up soon. Thanks again for the interest- it's a great spur to me for making progress. Excellent shots Ben. The lone deserted wagon is a sight frequently seen at isolated "country" stations where, unless there's a train due, everything goes to sleep. It looks great. I've commented on the backscene before but will say again, how good it looks. 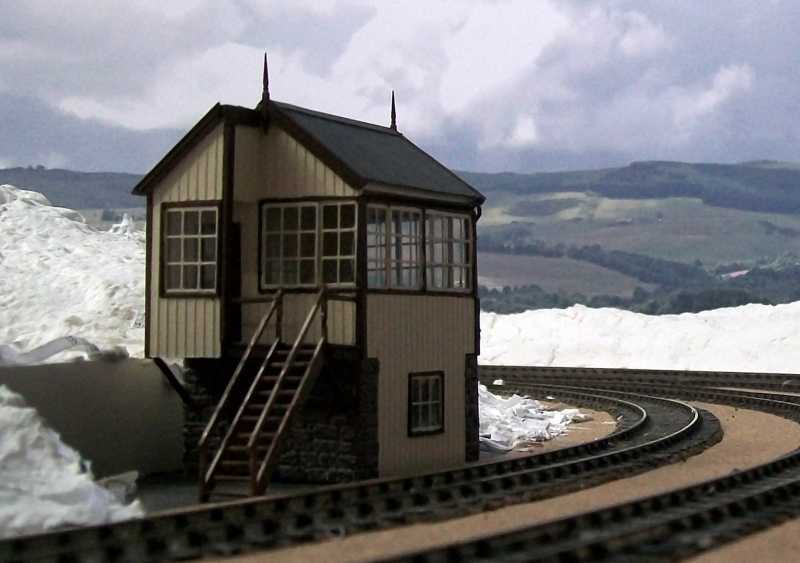 The shot of the signal box could be early spring with the last remnants of winter snow lingering in the shadows. I can imagine the somewhat remote and windswept location perfectly. Please don't cover the white areas nor the bit of snow resting on the wall top. A very atmospheric picture - well done. Glad you like them- considering they were just trial shots of the painting they have come out quite well, and make my future work look promising. It does prove that working from the backscene forward has been a good decision. 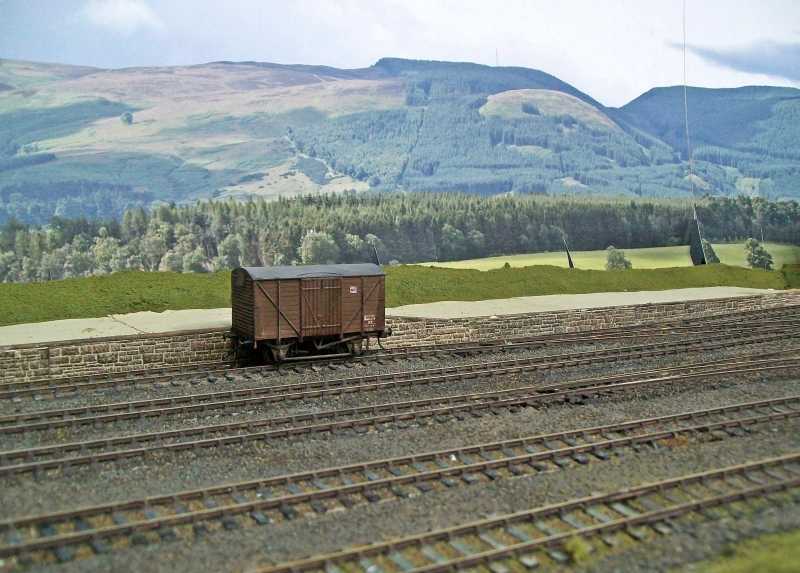 Thurso box looks at home in its sparse setting, but in reality it nestled in a overgrown cutting full of bushes and tree growth, and was one oe the most rustic of the Highland boxes, most of which were in exposed or plain situations- we'll have to think about this one. Attached is the companion shot of the solitary van- looking the other way- I have had to do a bit of cloning on this one to hide a point motor- there is as little happening here as in the other one! - thank you. I think the months, years, decades of deciding to model these two stations are perhaps going to be worthwhile. Once I get beyond the creative stage, I'll bore you all to death with the thinking behind my work, but tonight I gave the first coat to the terminus platform- please ignore all the plastic swarf lying around, plus all the other unpainted bits- it'll be tidied up soon. Background works very well. 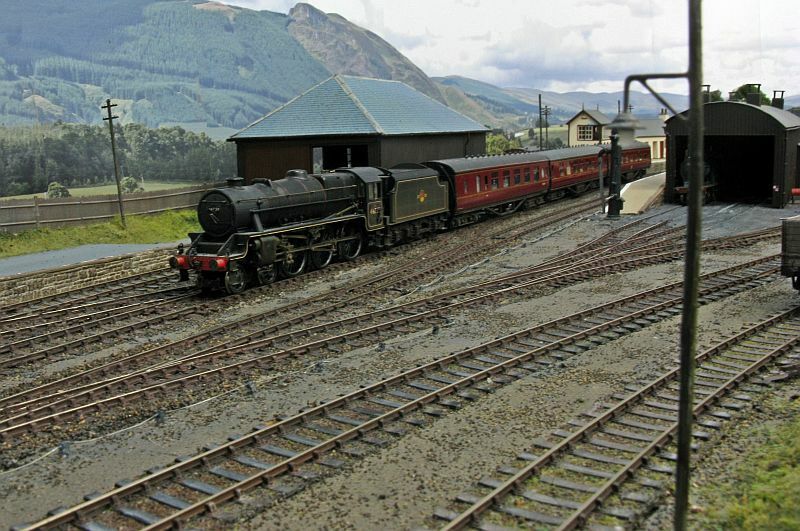 I see a lot of great model railway pictures coming! I have just come across your thread and must say it is looking very good, Now on my watch list! Thanks guys,- the backscenes have been a godsend, esp. for Helmsdale, and are an integral part of the whole set-up. My last build had them as an add-on, and were sloped in parts because of the shape of the attic roof, and never worked as well as I had hoped. Mind you, they were a lot better than nothing, which was what I put up with for years. One of the reasons for rebuilding was to take advantage of the range of scenic products that have come onto the market these last few years, and also to provide photo opportunities, with the digital camera providing a service unheard of with film. 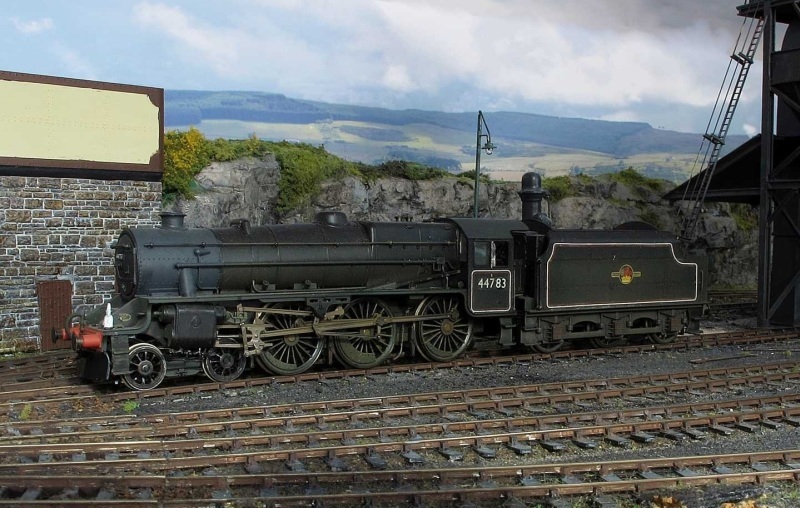 I am sure that there are going to be a lot more pictures where these came from!Also things like fences, signals and more grass- this is just the first covering to get away from cork and Sculptamould. Comments are appreciated, both to spur me on and give food for thought- after all, that's what these forums are for. 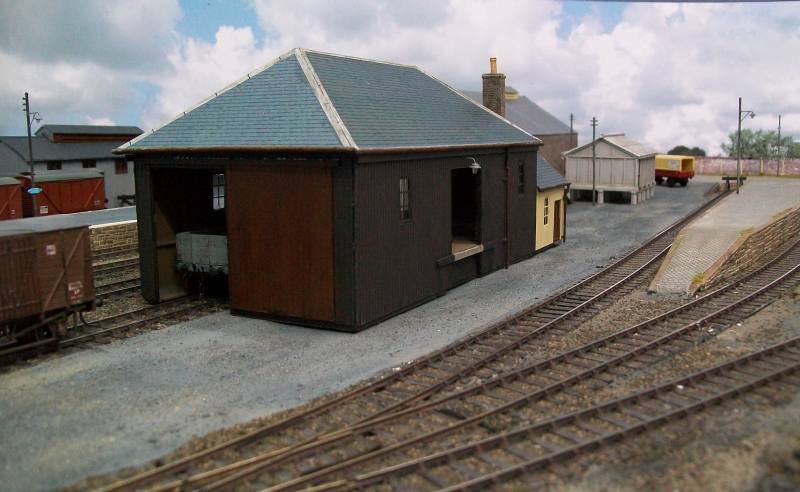 A couple of shots showing the latest work- the engine shed at Thurso has had its first coat of ground cover. That second shot is really very nice, Richard. Like Max, I love that 2nd shot. The turntable looks good - what make is it ? Thanks for the comments- apologies for the terse intro to my last post- I had written my usual one fingered efforts, and had done an extended post about my recent work, previewed it, sent it, only to see nothing but img- appear on screen. This has happened with almost every entry, and is not condusive to me expanding on my modelling efforts. Can someone perhaps explain what I am doing wrong-simply- as my computer knowledge is limited and my tolerance of glitches such as this is low-grumpy old man mode fully engaged-. I have been trying out different exposure settings and some adjusting of backlight, hence the varying visual effects, finding out how the covered surfaces photograph. These are just trial images, of a barely started scenery, so things will improve over time. 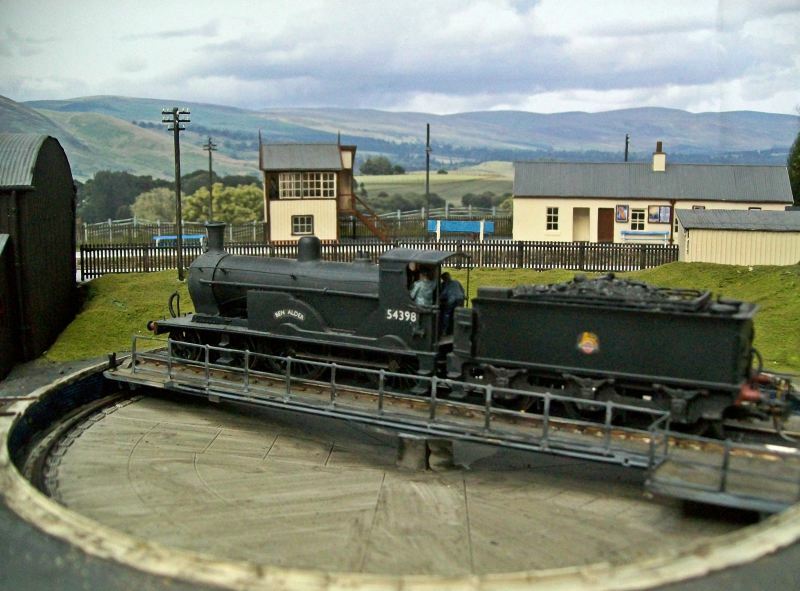 The turntable is a Roco model, and is more or less a 60' diameter, and works beautifully, although is nothing like a British T/T. I am going to see if I can brick the well sides to disguise the segments that are attached to allow indexing, but I can put up with the poor appearance in return for the faultless working. No idea what you are doing wrong - maybe not double spacing between text and inserting a pic? Anyway, I modified a Peco turntable by using some embossed plasticard, needed to remove a little portion of the end of the deck as the extra thickness fouled smooth operation! 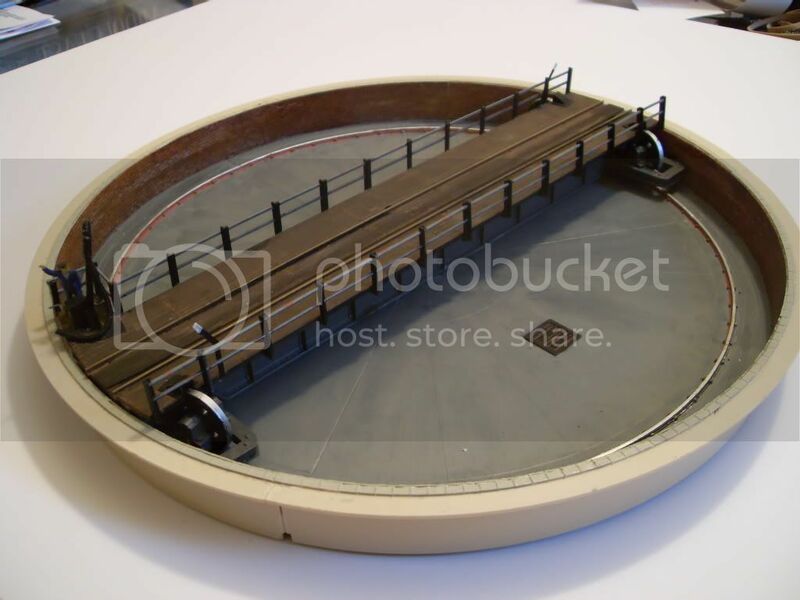 Also added an end platform, winder and vacuum pipe, brake levers and railings. 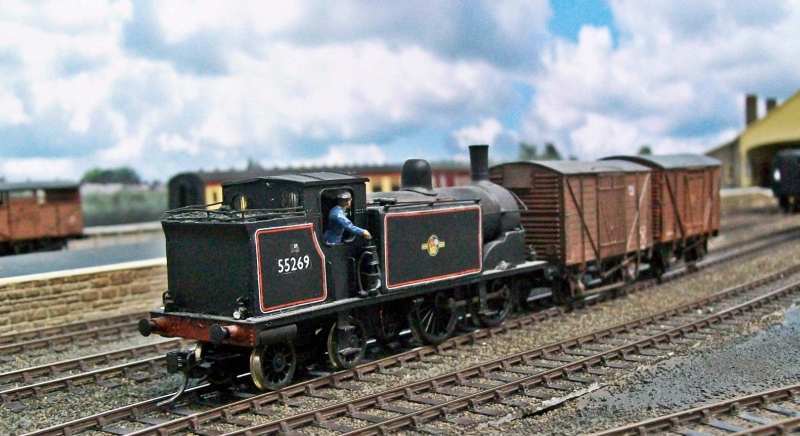 The turntable looks good, certainly an improvement on the rather basic Peco offering- this is a real weak point in 4mm modelling- the lack of a decent R-T-R British type T/T. I have, over the years, attempted to make most of the offerings operable, and usually retired defeated. 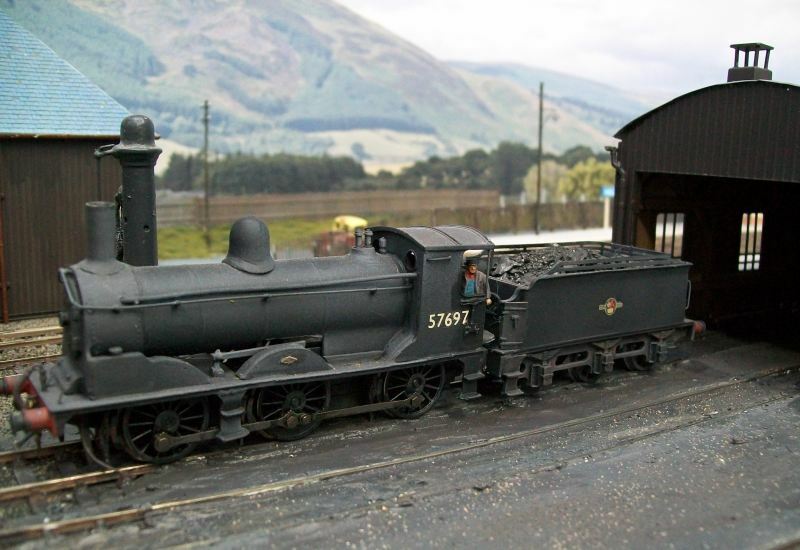 It's the amount of time put in vs. the less than satisfactory running achieved that grates, and today I decided to order another Roco T/T for Helmsdale rather than spend probably two or three modelling weeks on trying to get another poor kit working. Sure it's the price of three engines(big ones! 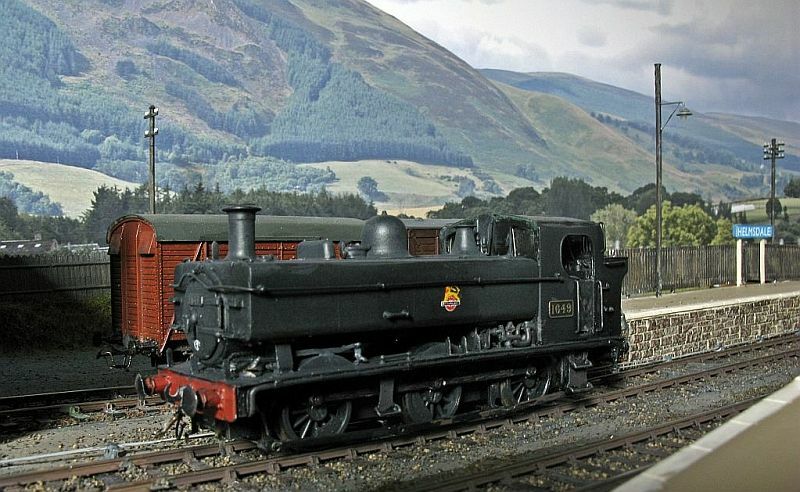 ), but adding another loco is not usually the subject of great soul searching, but I know that this one will work perfectly, and I don't really see the need to do the sort of bodging that we had to put up with until ten or so years ago to get a poor product working badly and think that was railway modelling. 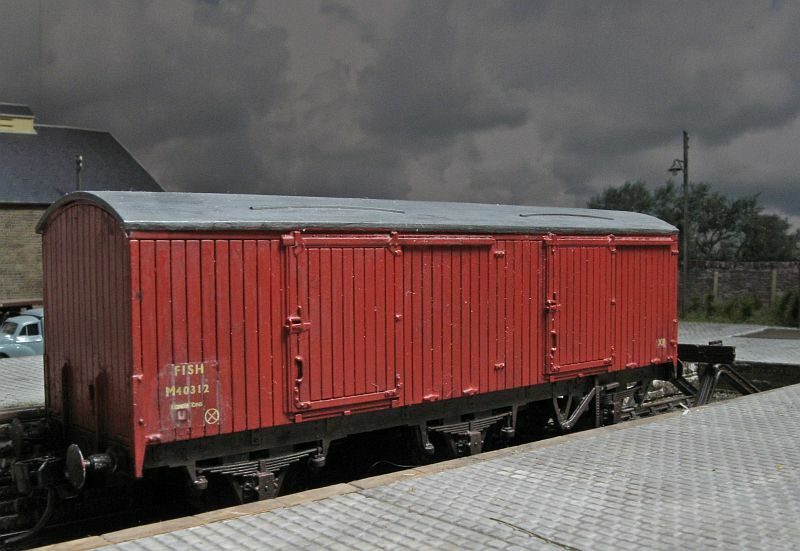 In the case of rolling stock, the market does have a limit - I, for instance, wouldn't buy Southern stock, no matter how good, because it's not my region. 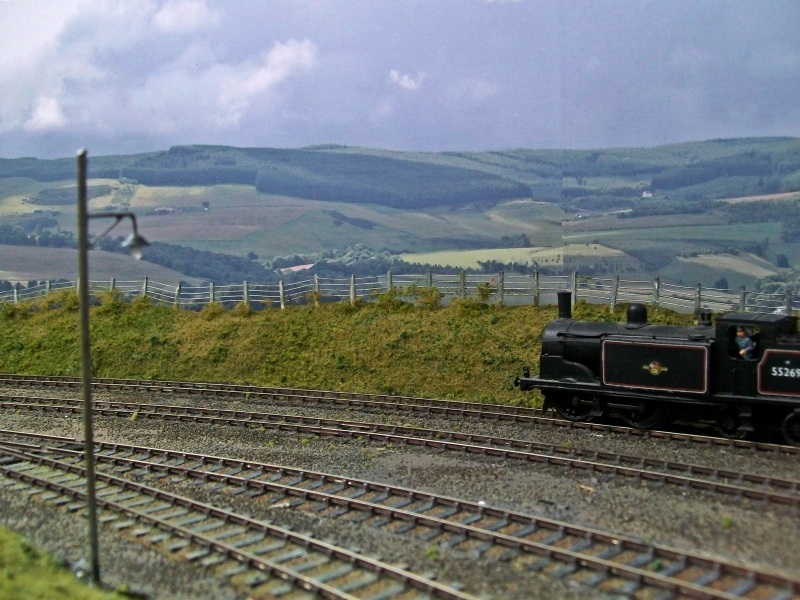 Virtually everyone modelling the steam era could use a turntable. Unfortunately the same argument about Regions also applies to some extent to turntables. Fortunately the differences are not too glaring for most people. Western region in particular did things differently (as usual!). There are metal kits you can buy although I have never tried one. At present I have obtained another, probably Continental, model and and trying to "improve" it but as you say it does take some time. I am not getting very far! 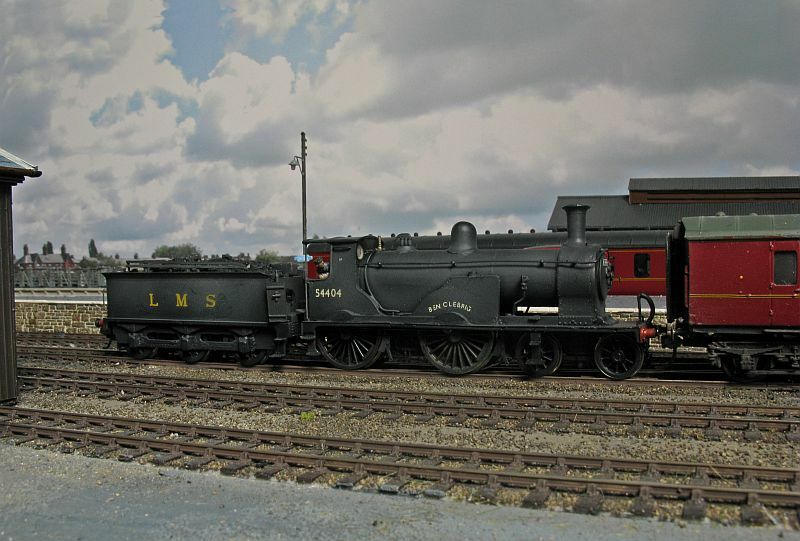 Fortunately, along came LNER and LMS and sorted things out. A byproduct of tonight's work-some more platform facings- and a few WIP shots to check how it looks; a couple of 16 tonners with coal waiting to be unloaded. 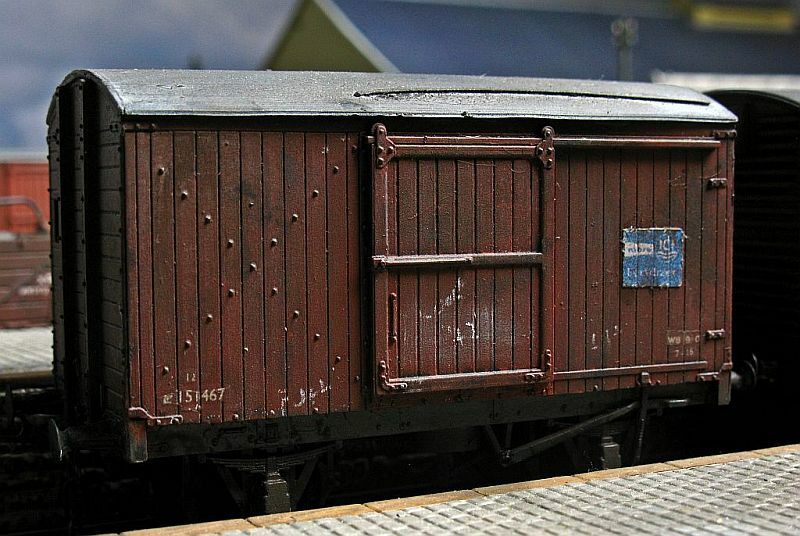 The weathering on those wagons looks good Ben - particularly the grey one. 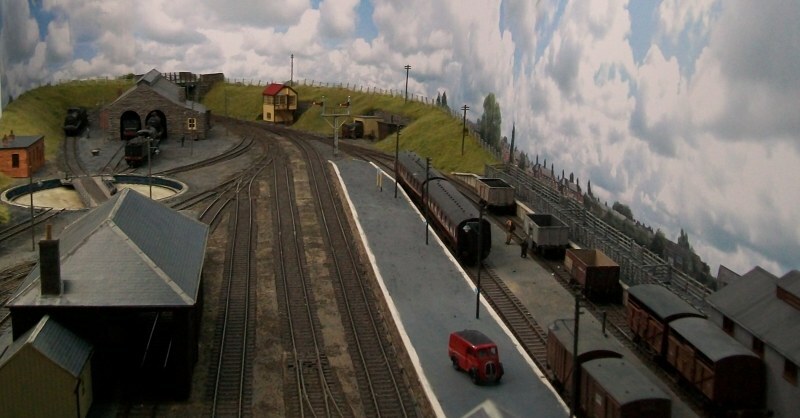 That backscene certainly does make the layout come alive in the pics, especially the one of the sidings! 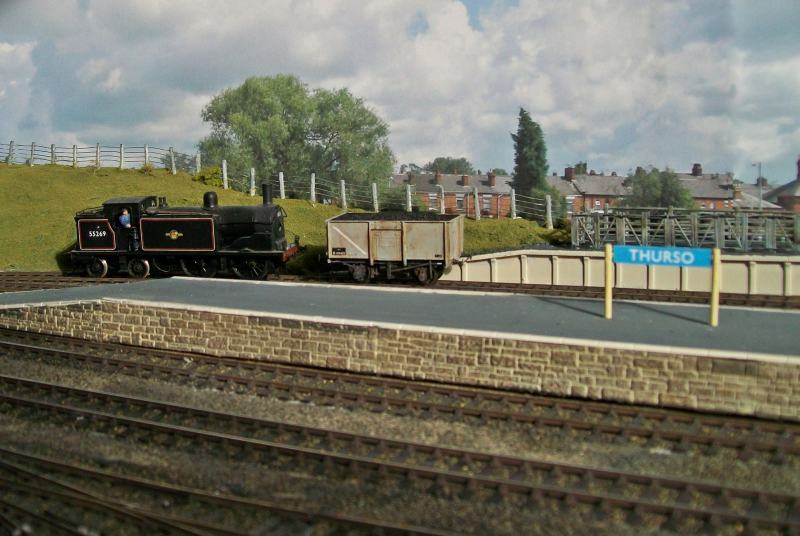 The layout is coming along very, very nicely. 1. 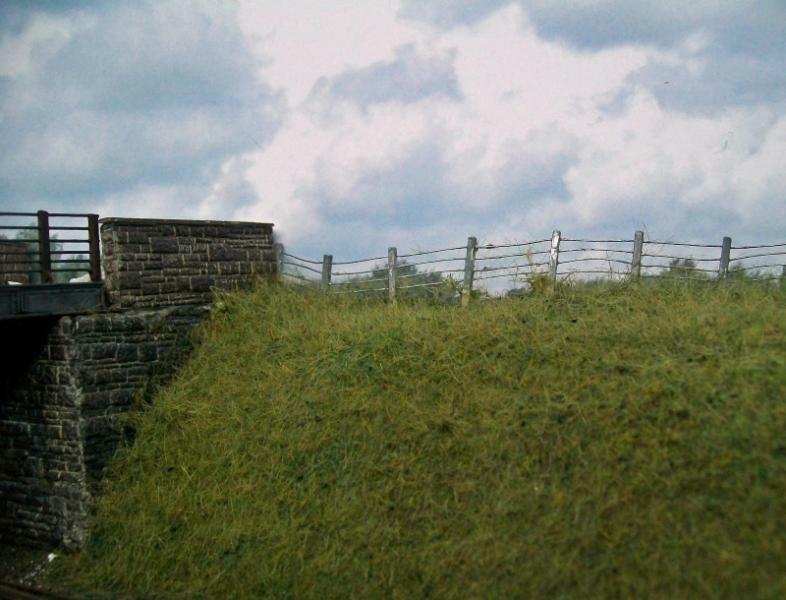 Is the platform surface plasticard, with scribed edge stones ? 2. Is the face of the platforms just printed paper or is it embosed card ? 3. What type/brand of ballast did you use ? Again, great pics and looking foward to more ! Glad you like the photos- more will follow as I get stuff done! 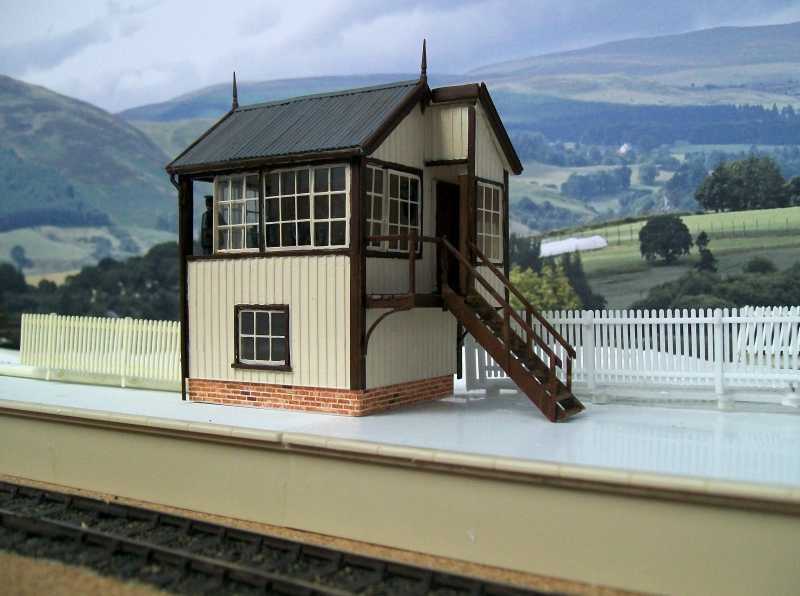 The platform is basically a Peco edge with Wills coarse stone sheet painted and fitted to the Peco edging, packed out with some plasticard strip to take the stone face flush with the platform edging. It is not an accurate representation of the prototype, but is close enough for me. The surface is a layer of plasticard- 60thou- and then covered with some fine flour grade sandpaper, then given a coat of household undercoat. It has to get weathering in the shape of acrylic washes added to it, but that is one of those jobs that can be done at my leisure. PS- I'll check out the ballast type tonight- I tried several types before settling one I could live with. Once again, an entire posting disappeared when trying to upload- I find this beyond frustating, and really can't be bothered with the efforts to get something to appear on-screen, so unless someone can explain what I am doing wrong, I cant see me bothering much more with this, I'm afraid. As, probably a parting shot, here is my alter ego at both stations. Thanks for posting, Martin. PM sent. 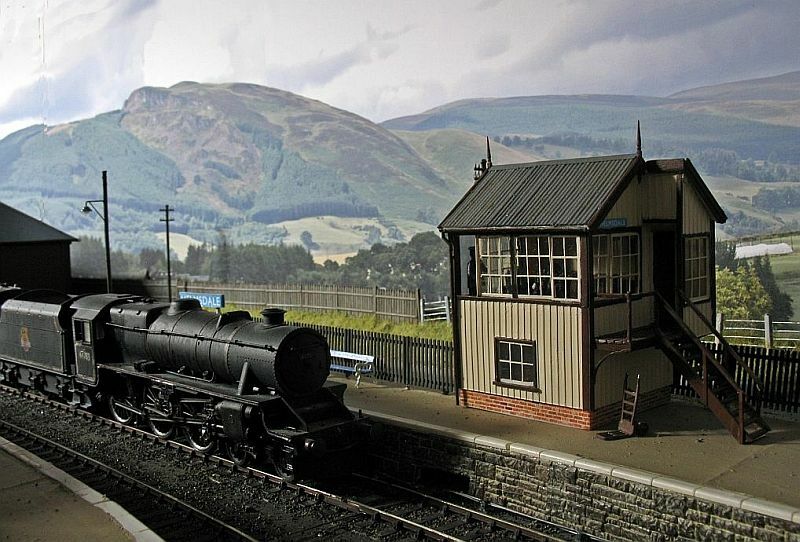 Superb looking loco and great setting. I hope you do continue to post. One option might be to type up on a word document and paste it in to the thread? At least if it goes you still have all your work. OK- nothing is ever gained by walking away from a problem, so I'll give it another go. 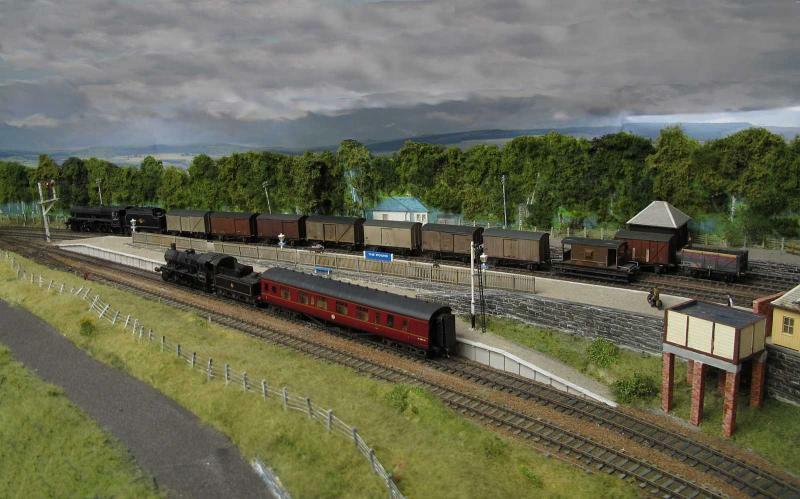 I have been putting some work into the goods yard approach at Thurso this last week, and a shot of some of the work is attached. Too true Ben - great stuff. That looks great ! Your stone facing painting is excellent. I will have to do something similar in the near future. I like the open spacious look in that last picture Ben. Reminds me of some 7mm layouts I have seen. I've said it before but I love that backscene. 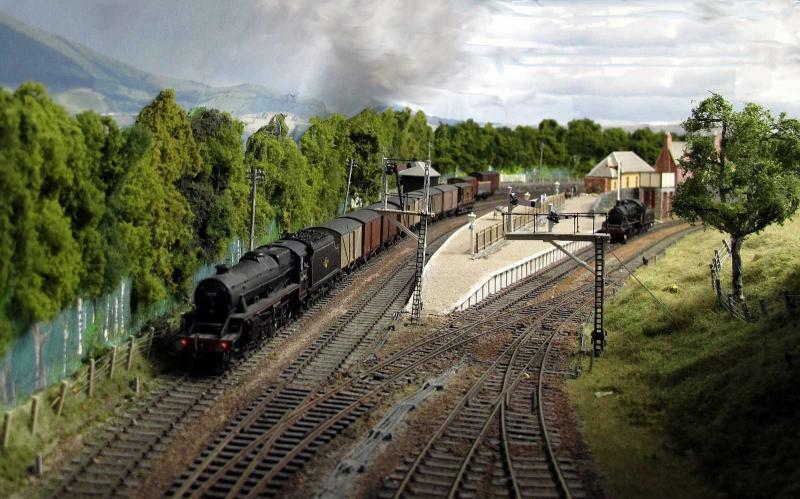 It helps to turn a model railway into a real railway. Posting on Firefox is a b***** nuisance , with text and pictures vanishing, and Opera won't upload at all, but copy and paste and three goes at it can get a message on screen. I am now trying Safari, to see if that is any better. Well, that seemed to work first time with Safari- looks like I'm back in business! The picture above is of my recent build of the Thurso cattle dock, which I'll go into later. 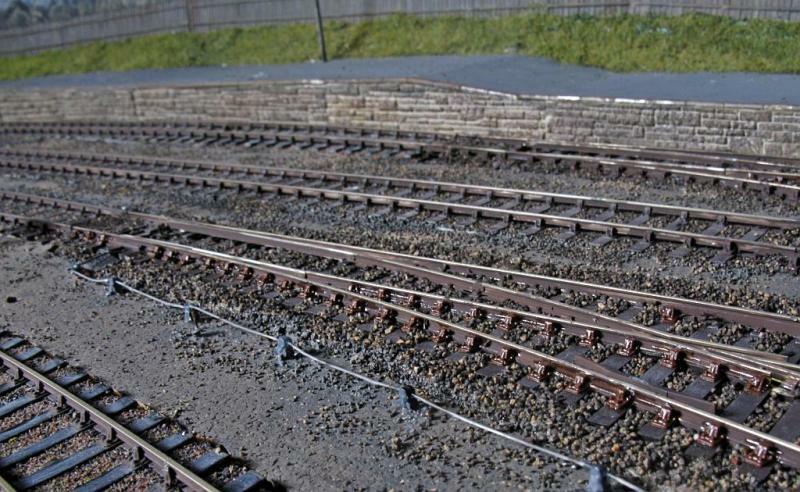 The setts in the goods yard are SE Finecast, and are, to my mind, have a bit too little relief for their own good- I am not happy with the finish, but they actually look better on screen than they do in the flesh- probably a matter of the viewing angle. The platform stonework is Wills and is painted with a base coat and then two or three washes of white and black/sepia- takes no time and gives good results. Very glad you have persevered. I'm enjoying your descriptions and updates. 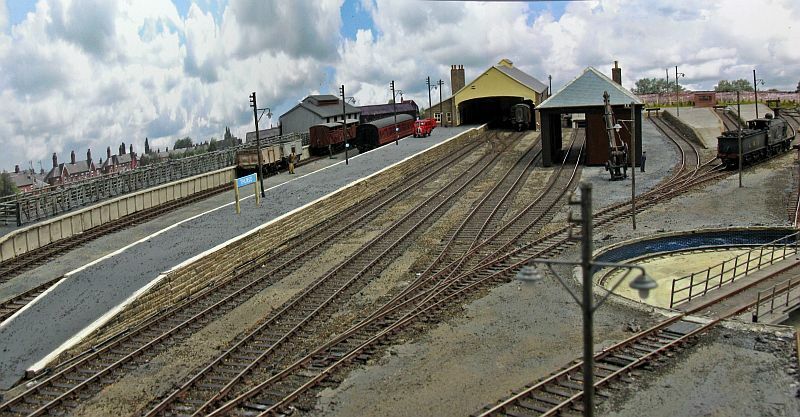 Another view of Thurso, showing the ballast that was asked about earlier. This is by Greenscenes, and is a mixture of their 2mm & 4mm black ash ballast, with a sprinkling of fine sand in the 6' way as well. This is put on top of the wet paint and given a brush-over to tone it in. The paint used is one of Games Workshop's recently upgraded range, and is called Stormvermin Fur , but is a good match for general track bed colouring- its an expensive way of working, but I managed on six jars, and am happy with the finish. I don't understand why you should be having problems with with Firefox, Richard. Neither do I- it works perfectly everywhere else. I have spoken to Martin about it, but it doesn't seem to be fixable. I find Safari works, but when I upload images they appear as attachments- I'll try putting them in as an edit to get round this. Not a problem, Richard - it must just be annoying for you. I hope we can resolve it eventually. I just stumbled onto your thread and read it from start to finish with growing awe. 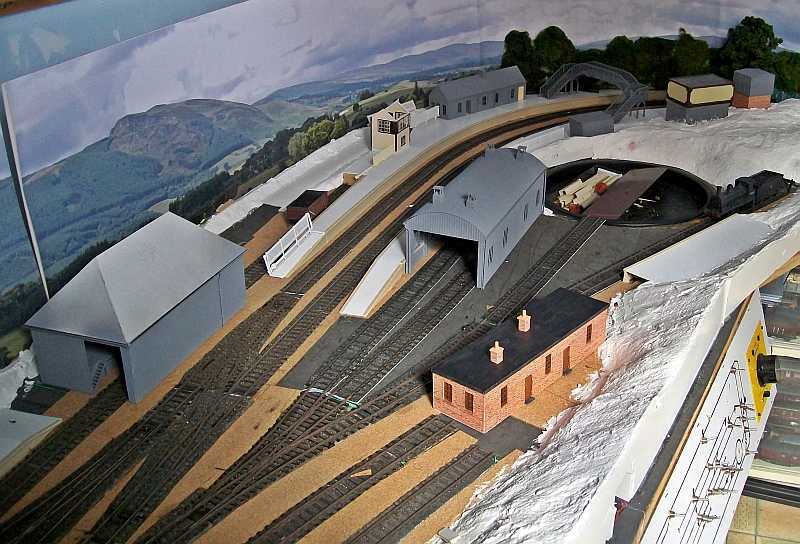 What an absolutely brilliant layout and superb use of the backscenes. 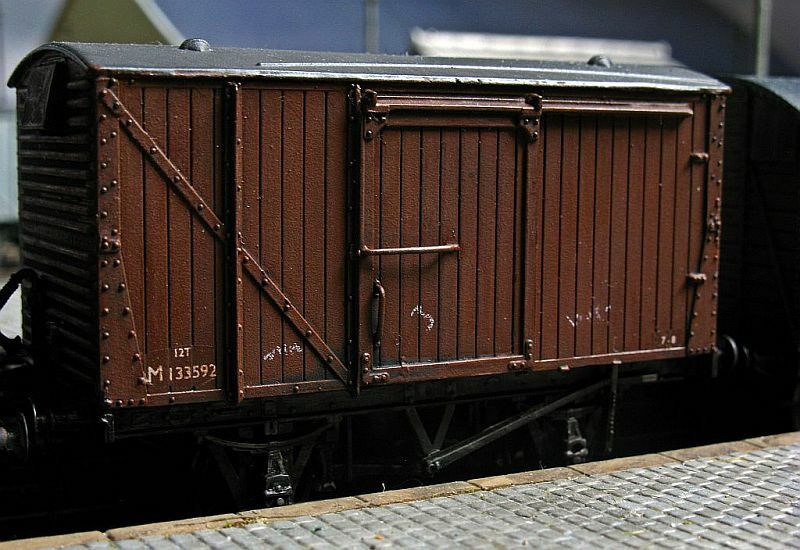 The track bed and weathering are also very realistically coloured. 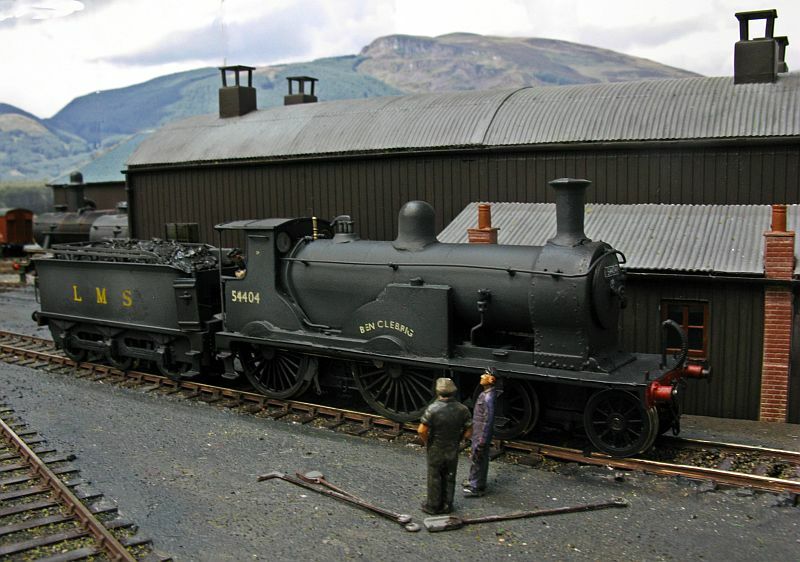 I was very intrigued by the situation of the loco shed and turntable which could trap locos 'on shed' if the turntable fails. I don't know the area but would be interested to know if this is the actual situation or whether a bit of 'modeller's license' has been used. Keep up the excellent work, I shall be following further developments with great interest. Thanks for the interest, and am pleased you like it. 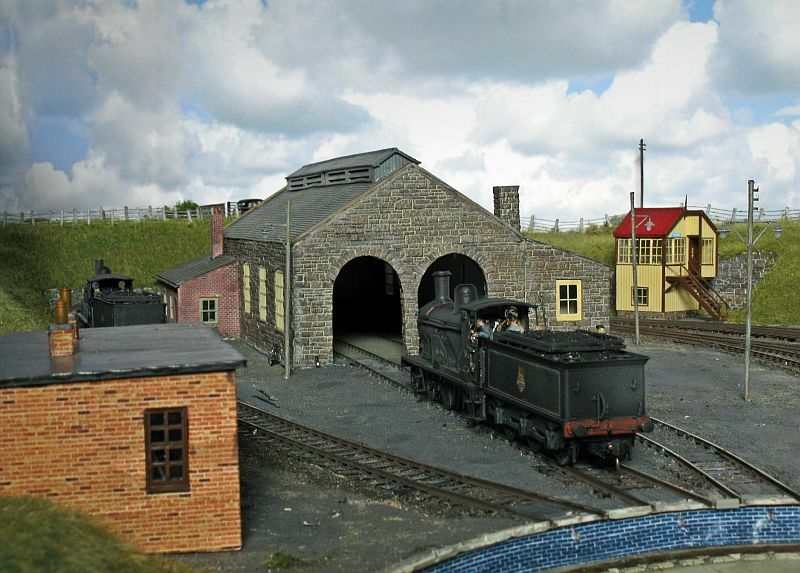 the terminus is more or less a replica of the actual site, allowing for the usual compression, and the engine shed was served via the turntable, although in real life it was a single road shed and situated on the station side of the table. I have turned it 180 degrees because of lack of space and increased its capacity to allow for more play value. There were proposals for various local branches over the years and I intend to work the station as if one or more came to pass. That is in the future though, as there still is much detailing to be done. Whenever someone posts photos of superb modelling like those last three, my eye starts scanning; looking for something not quite right. Thanks for the updates regarding the platforms, platform edging and ballast. As usual, you have provided more great photos and good desriptions of your work. 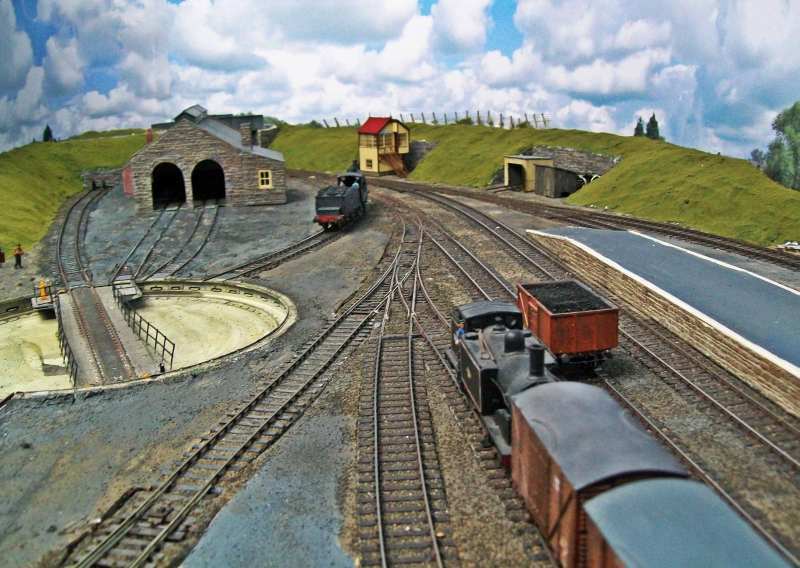 Looking foward to see the 'greening' of the layout. There has been quit a bit of progress in tidying and finishing on the build, but really is not worth showing as it happens- I'll do this when it is starting to look a bit more finished, so for the moment here are some more from my The Mound layout that was dismantled last year. 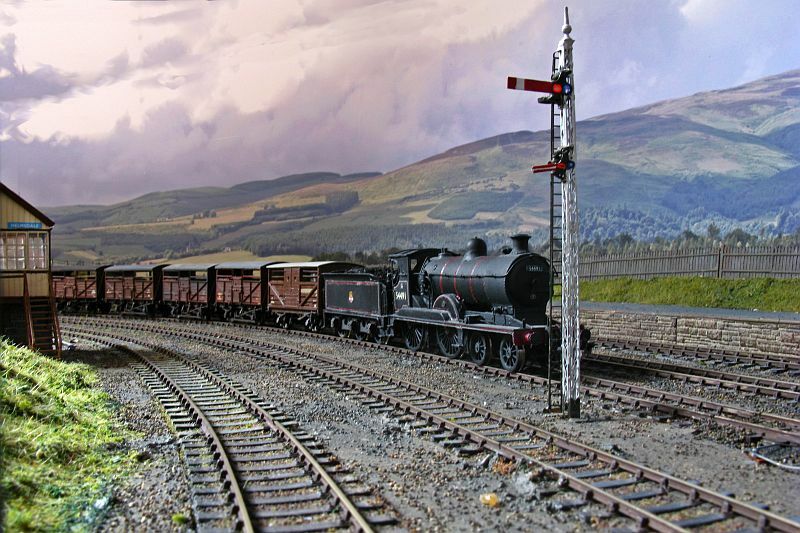 These are mostly of the branch train, that ran to Dornoch, and latterly had an ex-GW pannier tank as the motive power for the line. 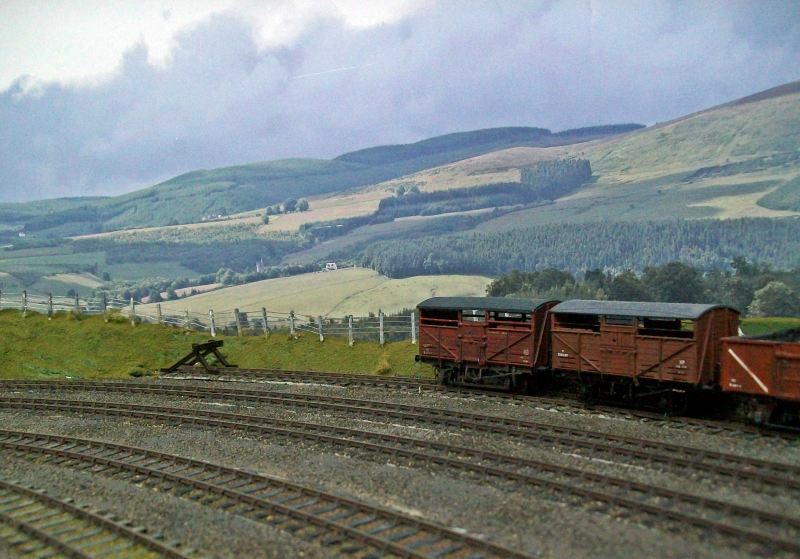 These were serviced at Helmsdale, so will still appear in future photographs. Excellent photographic work there Ben. Plenty of atmosphere to soak up. Some absolutely stunning photos there, really stunning. There's very very little to identify them as models rather than the real thing - and I mean very little !! It really does beg the question - why in heavens name, did you scrap the layout ? Surely you weren't planning to do something better !!! Thanks for the kind words re. photographs. 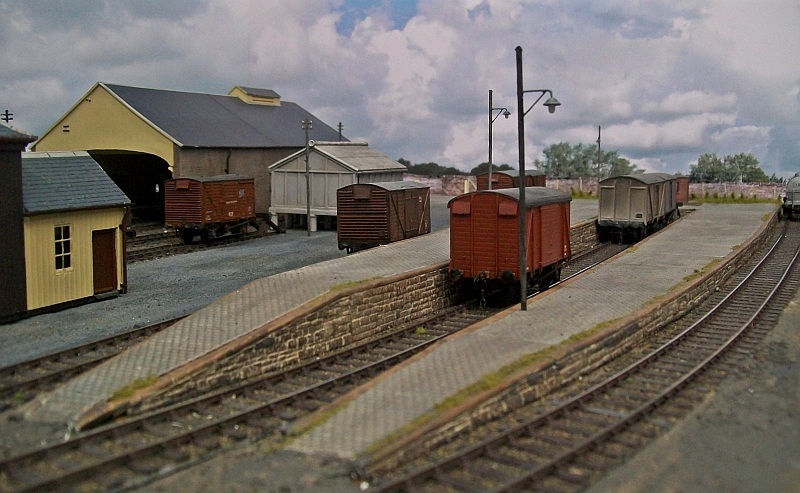 This was an offshoot of my railway modelling- a rekindled interest in photography when I succumbed to the digital age in 2005 and discovered the potential of these little boxes. Very few of my images have had anything done to them beyond straightening and cropping with regard to processing, but the skies are extended by a mixture of lassooing and use of the smudge finger- I got quite artistic at it latterly. I don't like the use of drop in backgrounds to layouts that often feature in magazine shots, as these rarely tie in with the colors of the layout itself, and usually detract from the presentation of the layout. 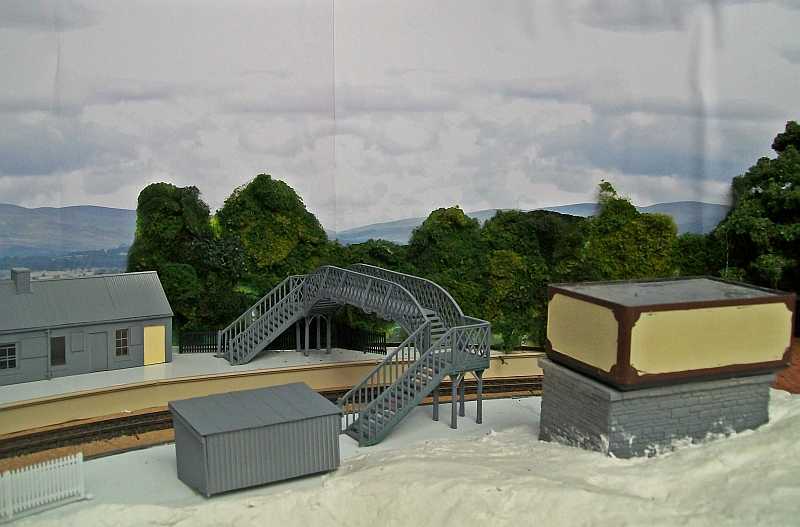 This was one of the reasons for scrapping the last set-up;- it was built into the lean of a sloping roof, which made a decent height of backscene impossible. It also was begun in 1992, so I felt it had had a decent innings. 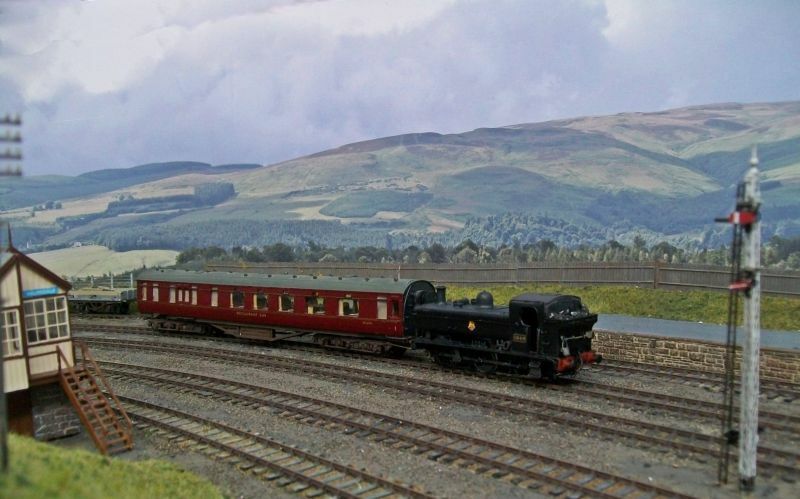 If the room had been bigger and I had placed it against another wall, I might have retained it, but I wanted to have a go at Helmsdale, which has more operating potential- TBH, I was getting a bit bored with The Mound, and I wanted to build something that gave me more movements. "Everything" happens from time to time Ben and, although palm trees grow on the beach as far north as Aberdeenshire, the sea is a few degrees cooler than in the Med !!! That's a stunning photo Ben. 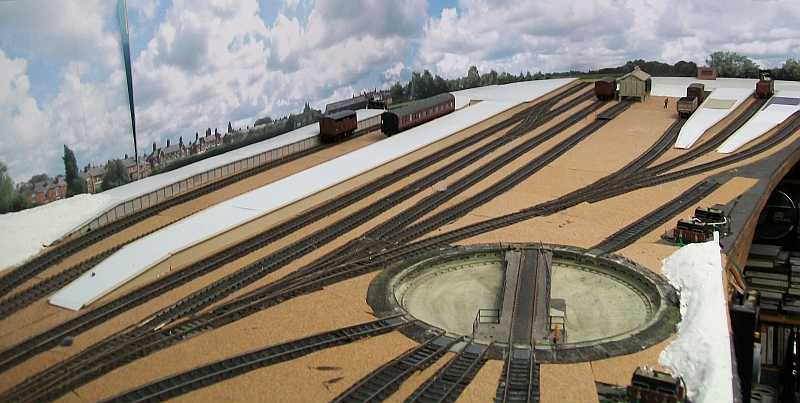 Things are starting to come together on the layout now, and I managed to get some shots in natural light last Sunday that didn't show unfinished groundwork! it's good to start to see where the build is going. 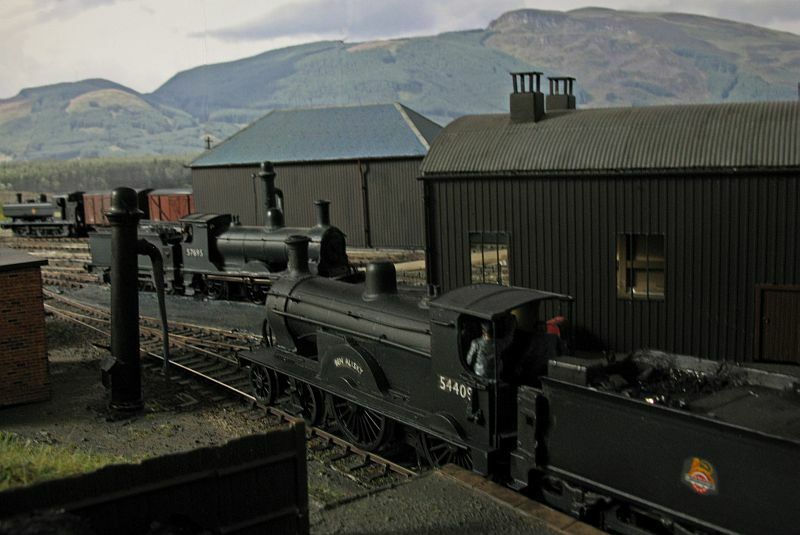 Here are a couple from the session- both types of engine long associated with the area in days gone by. Work is continuing on the layout, and has reached a stage where all the buildings are in place and basic scenic work is all but completed. I am tidying up a few odds and ends and the next stage is top cover of landscaping. For the moment, here area couple of shots taken the other day. 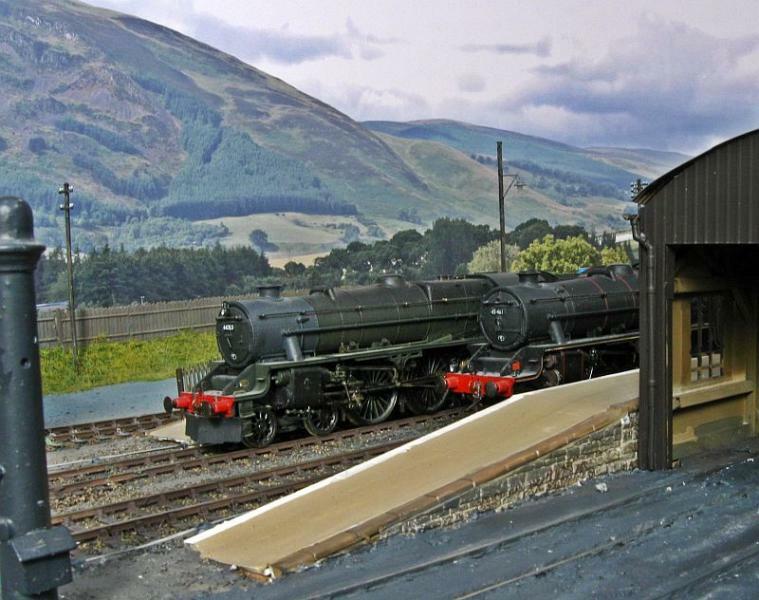 Helmsdale has had a turntable installed and a first coat of paint at the engine sheds, as seen here. 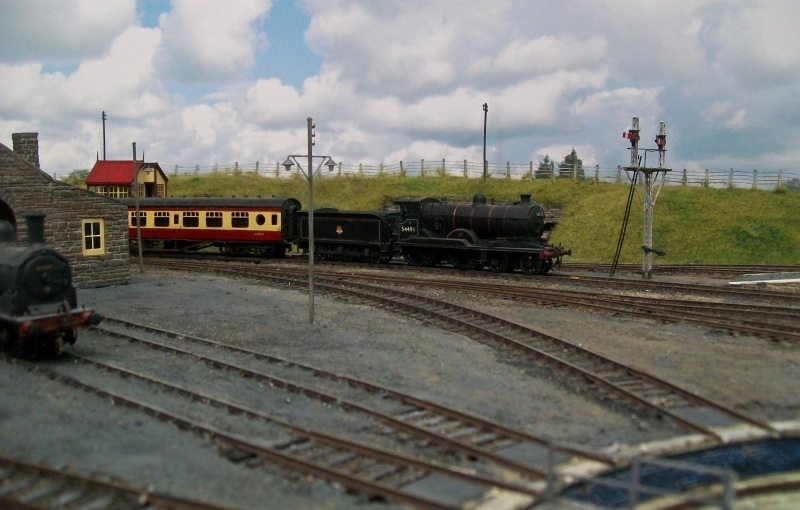 And one at Thurso, showing the goods sidings, taken in natural light. Just read the whole of your thread, really enjoying both layouts! 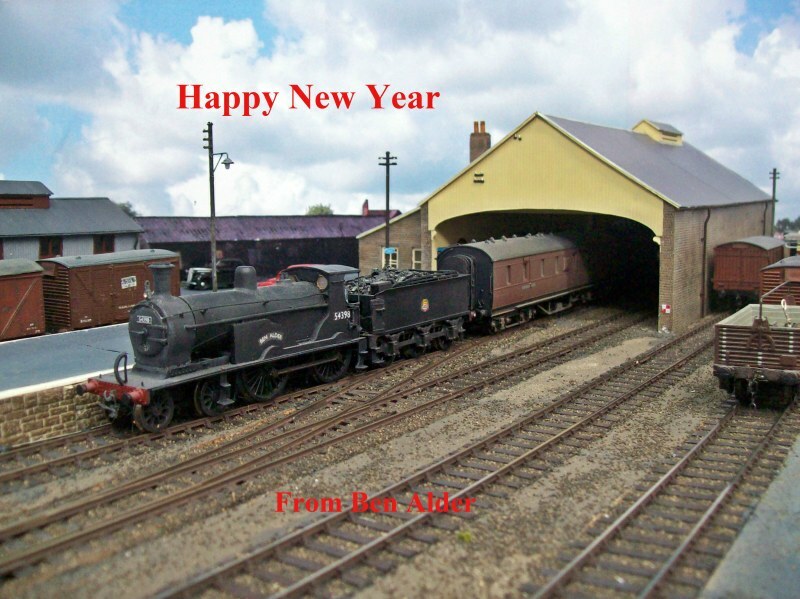 Hi Ben, I echo the comments of others as your layout(s) is just stunning, one of those layouts where it is a real pleasure just sit and view all the detail. You fully deserve the header photo slot. The stormy skies are very striking, and unusual - my layout is mid summer bright sunshine everywhere!! 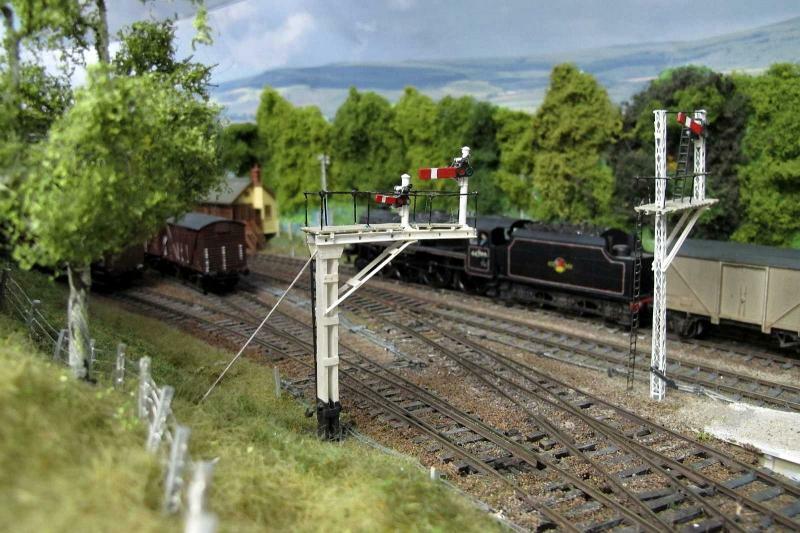 I also like your signals - are they kit built or made from scratch? Cheers, I will add some more photos when I have time. The signals are mostly scratchbuilt, and copies of the one at The Mound, although one or two are basically the Ratio model. I,ve just read this thread from the start and also echo what others have said the backscenes are really strikeing that I have bookmarked the ID site for future purchase . The backscenes are an excellent product, and certainly help set the scene for me. Highly reccomended. 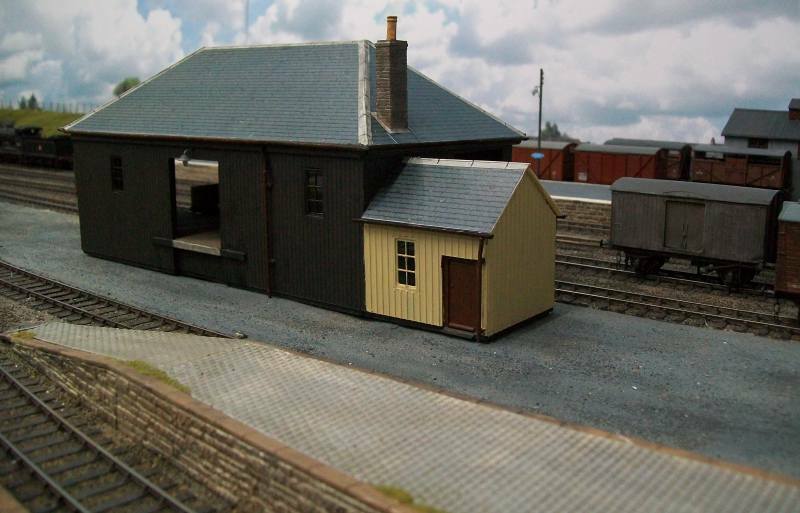 I have been working on the Thurso goods shed, adding an office - found enough traces of its existence to hazard a guess at its appearance- and done the ridge flashing. The roof pitch has been altered as I made a mistake in the original build- working from photos- and it looks more in proportion now. 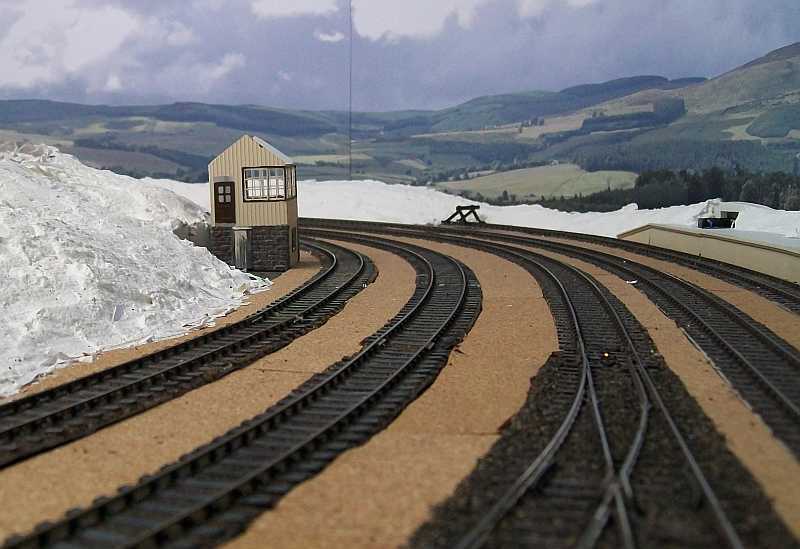 In the below photo that was on a recent post what did you do to create the effect on the trackwork in the yard. Was it plaster painted a grey colour or DAS clay or another substance you have used. It looks excellent, as do your other photos. 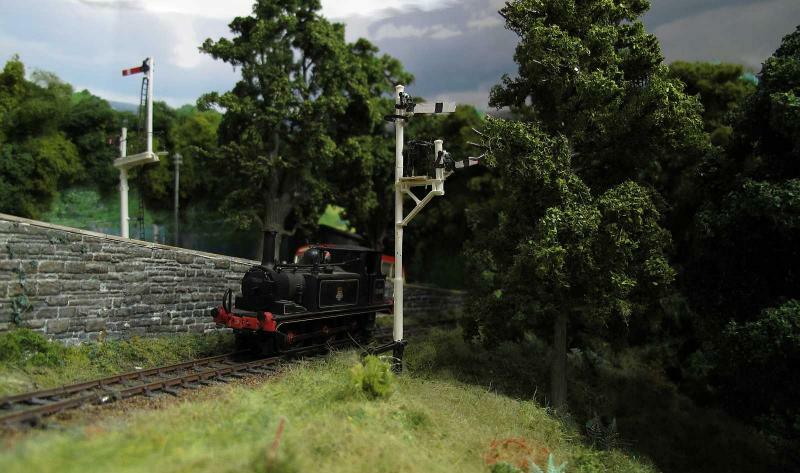 Keep inspiring us with more photos as the layout progresses. Shed ground cover was Fine surface, or whatever it's called- comes in a tub- Polyfilla put on with an artist's palette knife and painted with a mix of acrylic greys, put on wet and blended together. I am going to go back to this bit as the finish has come out a bit glossy, but it is something that can wait till I get further ahead. 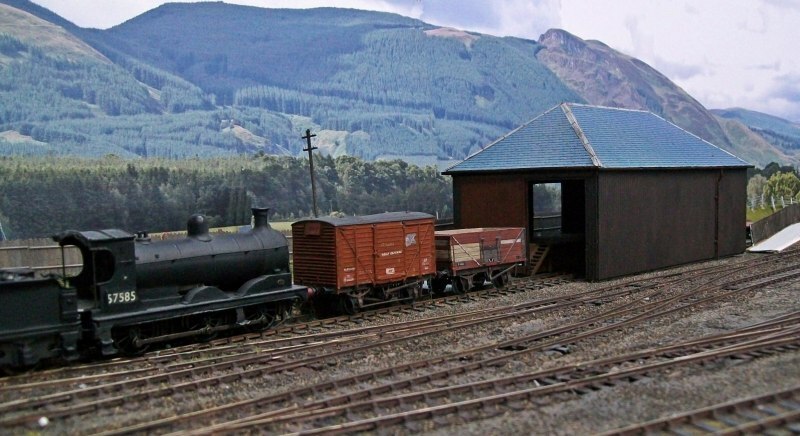 The goods shed at Helmsdale has likewise been given its revised roof, and here are a couple of shots of it. 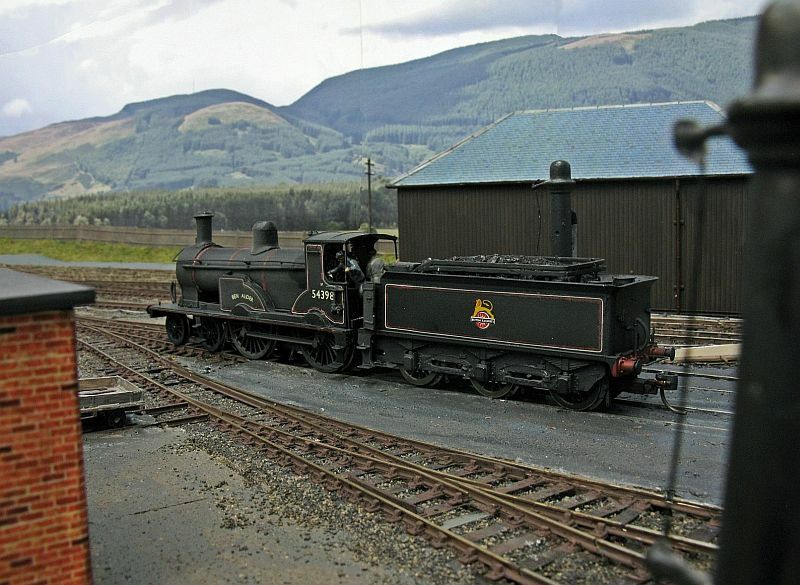 A local passenger, hauled by Ben Alder is seen passing the shed. So that's why these shots are so good - you're a locomotive, not a modeller !!!! Once again, excellent shots Ben. Yes, adopted 54398 as my nom de plume. 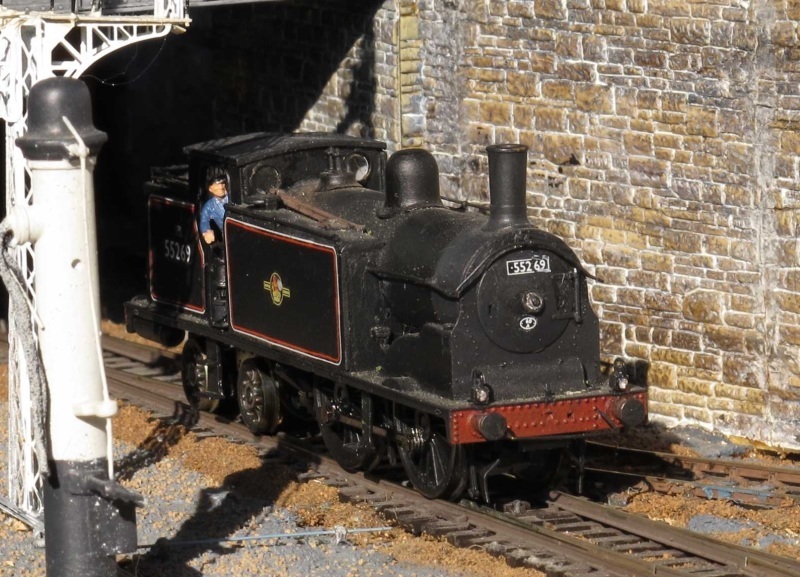 In an attempt to get round to having a running Ben- kit sat in a cupboard for thirty years waiting to be built- you know this scenario- so in the end it was a heavily bashed about T9 with some of the kit fittings that emerged- but it runs beautifully! 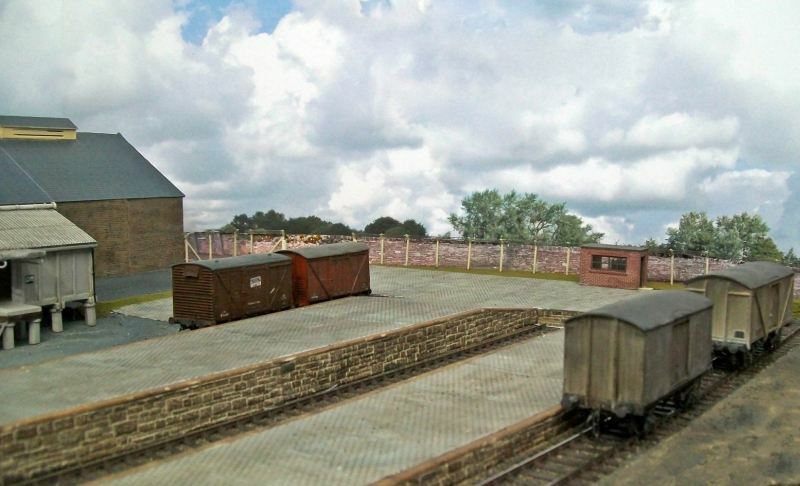 The backscene stops just behind the wooden fence- old sleepers on the real thing- and does blend in well. The availability of this sheet was the tipping factor in modelling Helmsdale, as it gives a fairly good representation of the country around it. I was right about the backscene/layout join but I have to say, it was only a guess based on the fact that I didn't think you'd ever have made all those trees ..................... As I said, virtually invisible. Don't Humbrol make a track colour now or have they just changed the shade ? It's a pity because it's one of the best colours I've ever seen. Do you use builder's sand, beach sand or river sand and do you wash it first ? Beach sand would be difficult here but builder's sand comes by the lorry load. Not sure if it's quarried or river sand but I'm pretty sure they're not allowed to use beach sand because of erosion problems. There is quite a difference in the particle size - river being very fine. p.s. 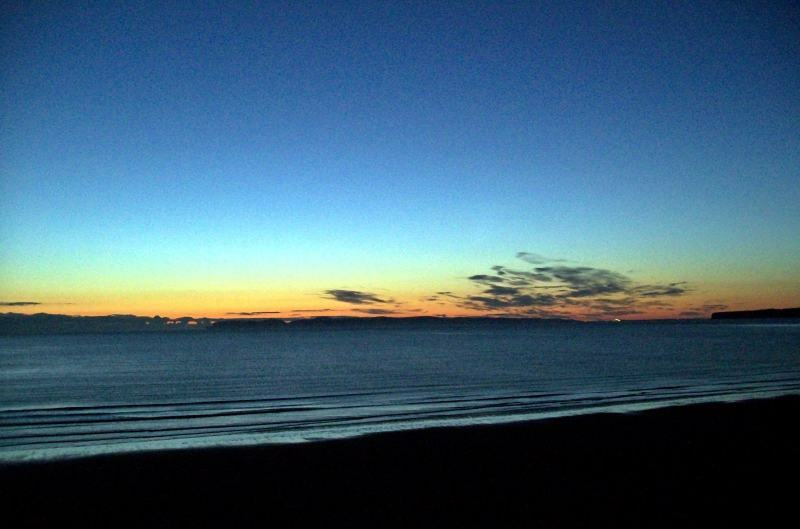 Has the sun set for the winter up there yet ? I'm afraid Humbrol Track Colour has vanished from their range a long time ago, and no adequate replacement is available. I know a lot of people use Precision Paints Sleeper grime as a general coverall but mostly it doesn't work, IMO. 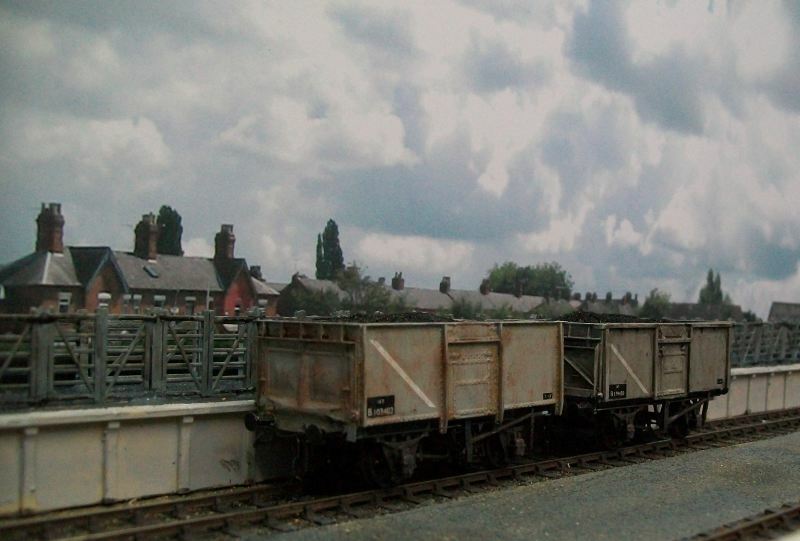 Track, ballast and sleepers tend to be seperate colours, and benefit from being represented as such. 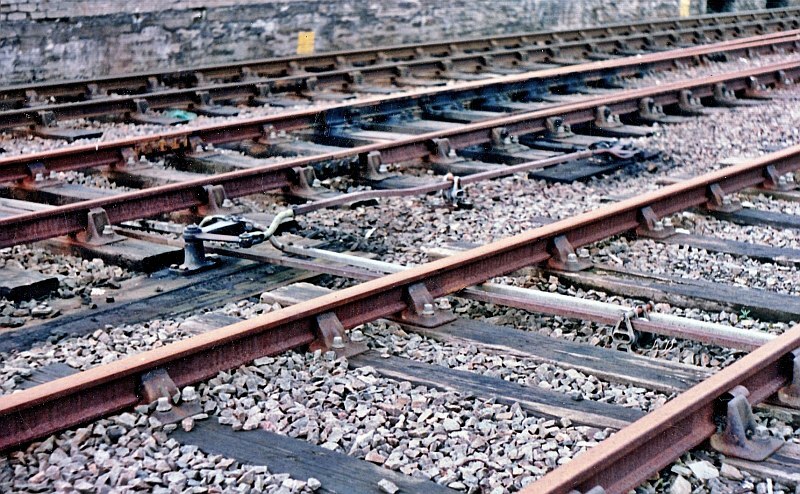 as an example, here is some track at the local station- not entirely typical as it is rarely used nowadays, but shows the differences in colours. The sand I use is a fine builder's sand, taken during a house up grade years ago, but where it came from I do not know. The tub I have will last me decades though! The dark is drawing in here now- we ate at seven looking out at gloom- time to start pulling down the blinds! 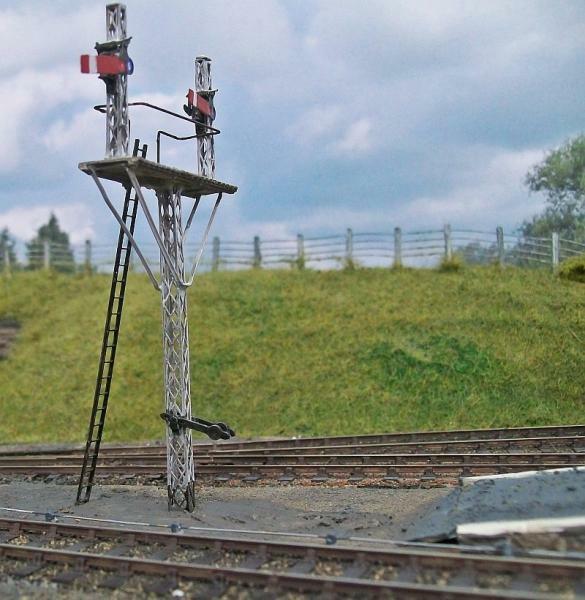 Work has been continuing on the layout, and all the telegraph poles and signals- all two of them!- are in place. The next job is to add more ground cover, to hopefully give a more finished look to it all, and I'll post some update pics when I have something suitable to show. 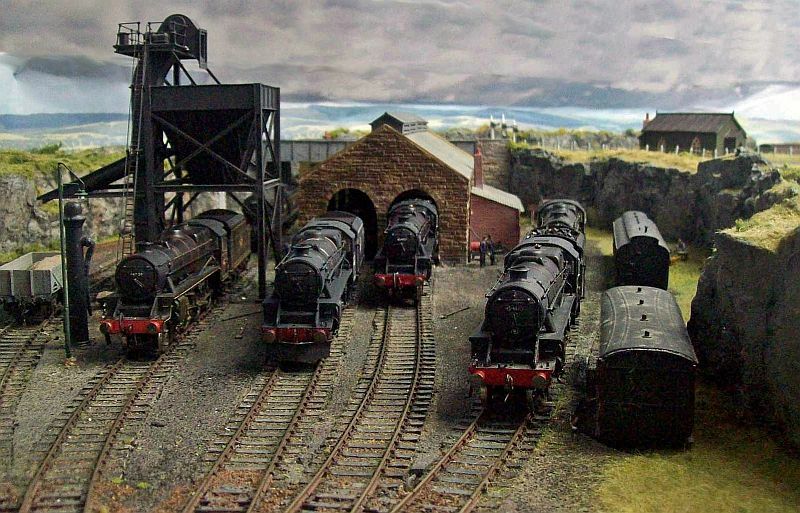 Meanwhile, a shot of Helmsdale yard as of last night. 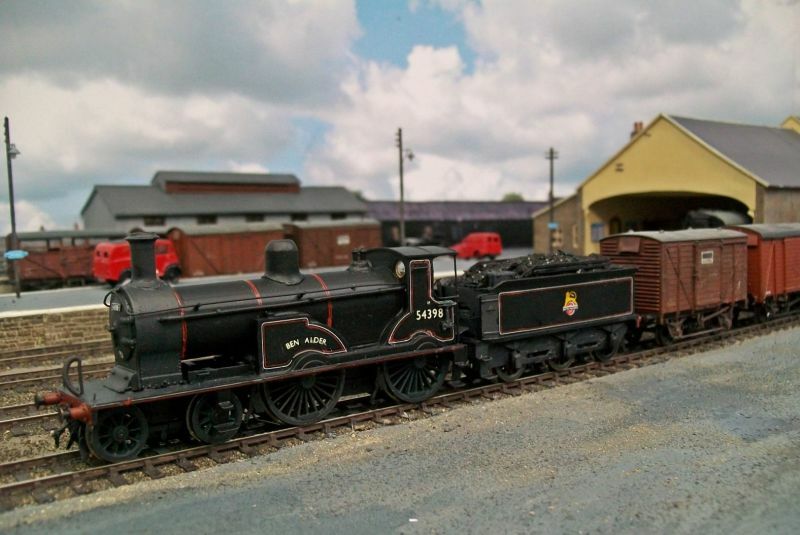 You have to do a double take to see that it is a model. Excellent scenic work! 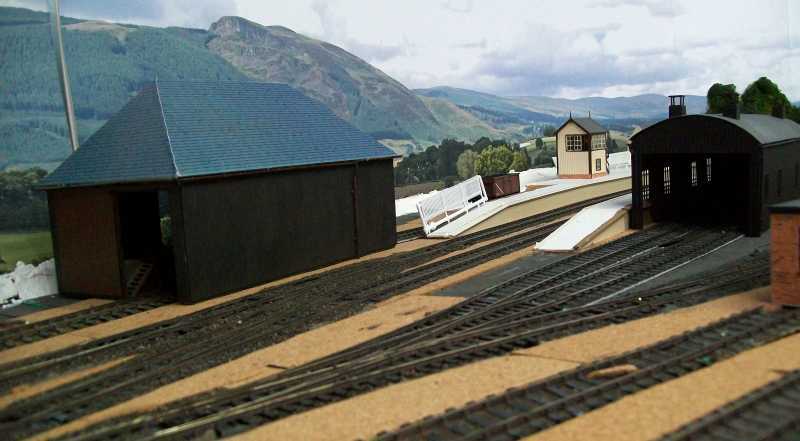 That track and ballast weathering is absolutely brilliant and, as Ray has said, it is so realistic it could so easily be taken for an actual station approach. I have started applying some more layers of scenic fibres, and this is the approach to Helmsdale. The ground cover here was scrubby and tufty, with gorse bushes and not much in the way of longer grasses, and this is the first extra layer as applied. 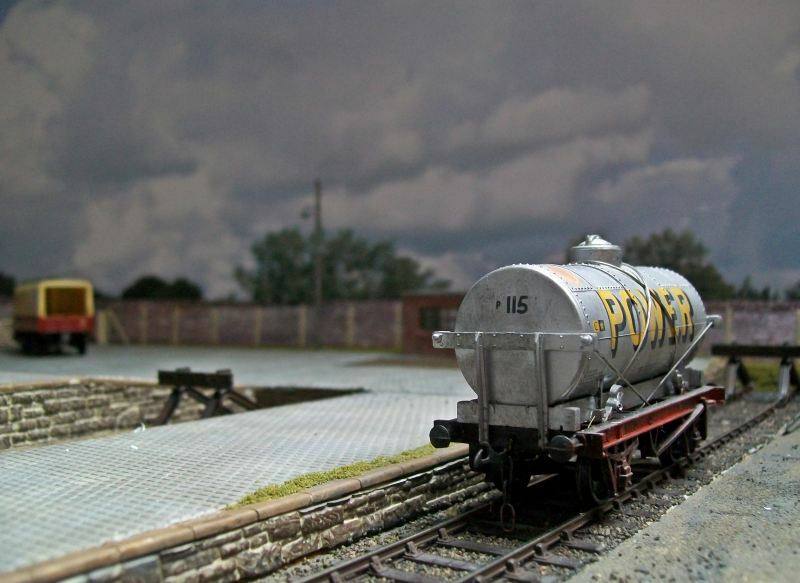 It is a scattering of Woodland Scenics coarse turf- various shades- onto a layer of PVA, and again a mixture of static grass shades from WS and Noch- all short- put into a puffer bottle and shaken over the coarse turf. I hoovered it after an overnight dry, and was pleased to find that most of it has stayed in place, so think that this will just about do for this section apart from some gorse bushes. The longer grasses that sheltered beside the sleepering fencing will be a longer mix, and put down with the Grassmaster, which works these lengths better. More to follow once I have more to show! Looks like you've got it just right, Richard. A very realistic blend of colours and textures. I guess I have to join the chorus of "what a brilliant thread"...... just dicovered it and read it fron start to finish. Like the others I am extremely impressed with the effectiveness of the back scene.......there is a tremendous feeling of space and most importantly depth. 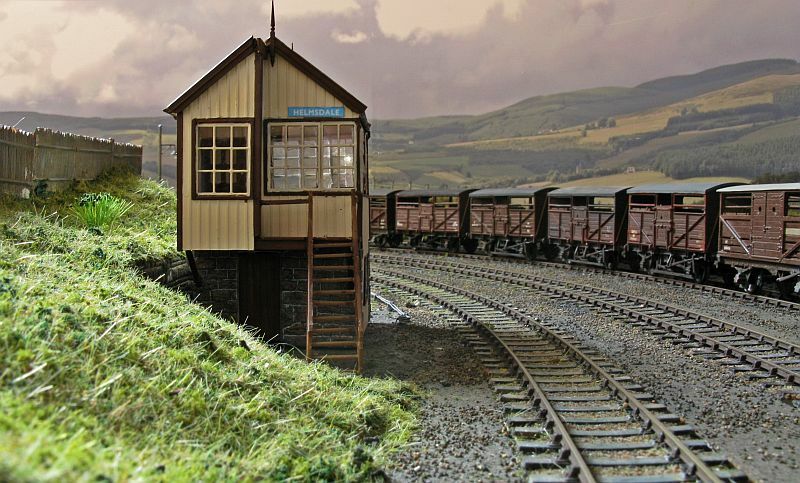 I particularly liked the signal boxes......have you posted a " how I did it" elsewhere........they are superb creations. 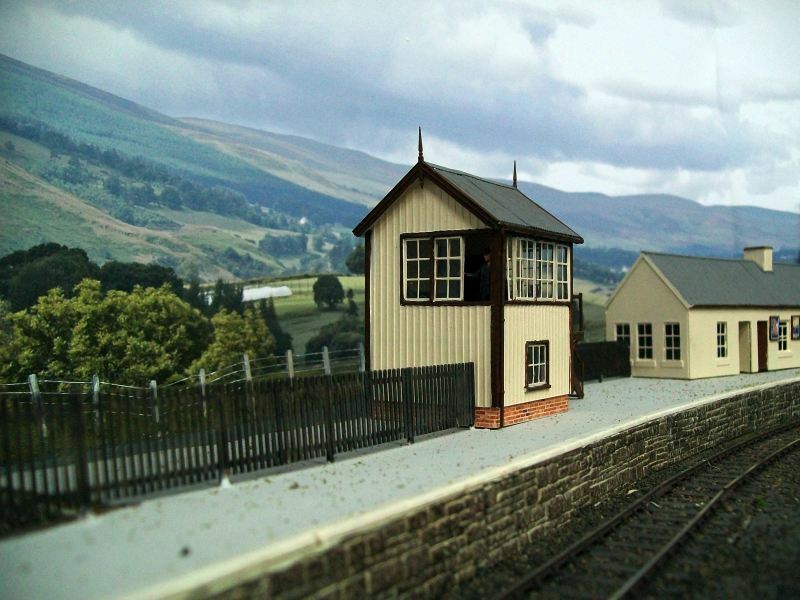 "I particularly liked the signal boxes......have you posted a " how I did it" elsewhere........they are superb creations." 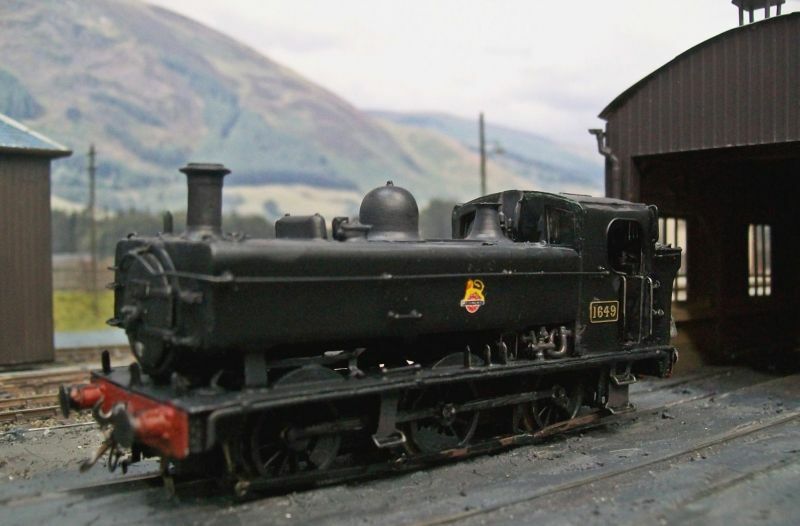 Glad you like them- scratchbuilt with window etches from a firm that does v. useful Highland odds and ends, and Ratio steps from their GW kit - I'll quite happily adapt something ready made if it saves time and looks the part. 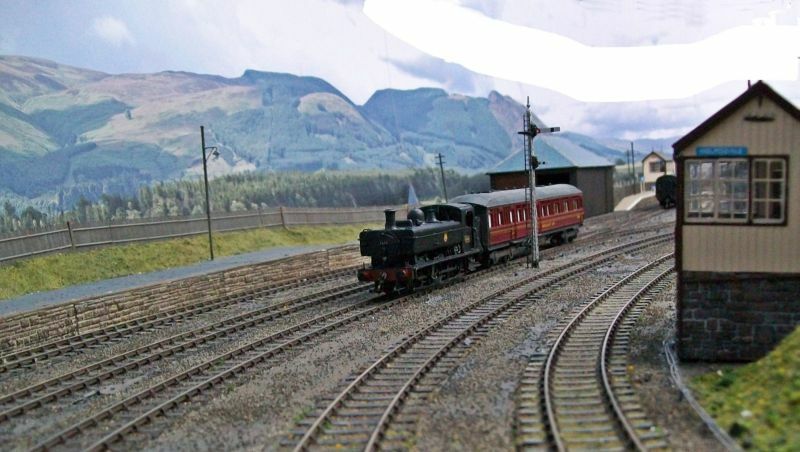 The build is part of a layout thread that I have on RMweb - north-line/" TARGET="_blank">http://www.rmweb.co.uk/community/index.php?/topic/49767-the-construction-of-the-far-north-line/ - that takes the build from start to current state. 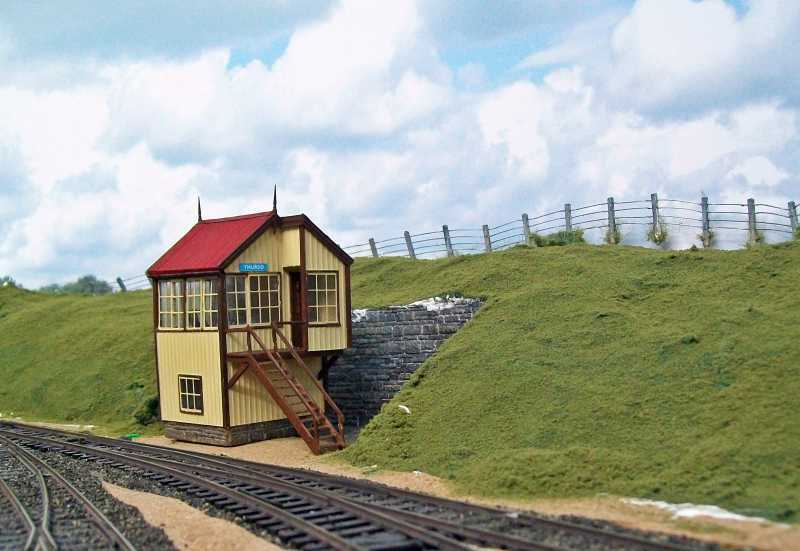 There are some shots of the signal box build on page 4. Grasslaying has been underway at the terminus, and a couple of photos to show where I have got to. They are hardly the most inspiring images, but give an idea of the 3D effects that can be achieved with the Grassmaster. A random selection of lengths and colours was prepared and applied. This is just one coating, but I think I'll stop at this while I am ahead! I'll have some more general shots ready in a few days- tidying up gaps and missing bits of paint ATM, but the construction phase is just about complete. Just thought that I would re-show this one to illustrate the effects of static grass! 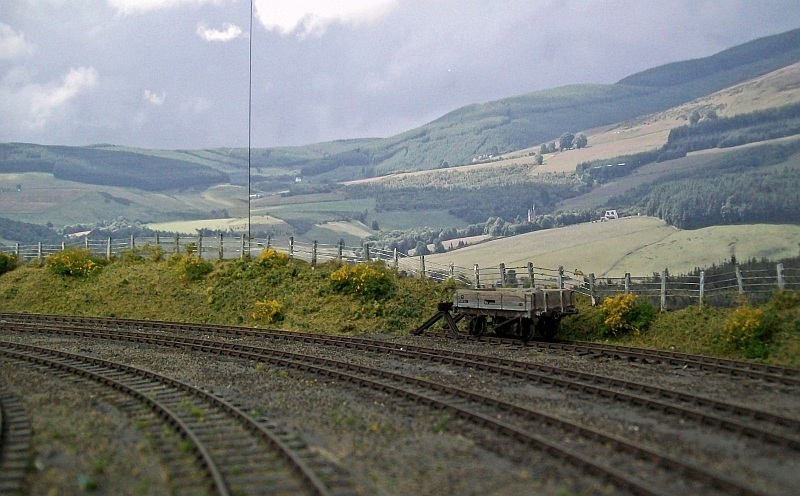 The approach to Thurso is heavily vegetated, not at all like most Highland boxes, and what I have applied is subdued compared to the real thing. 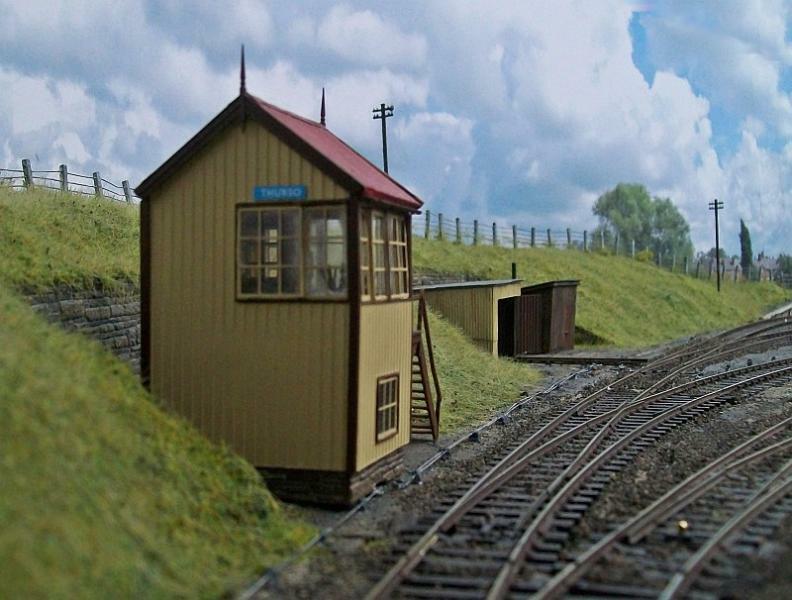 Lovely shots Richard........I do like those signal boxes!!! Very convincing, Richard. The grassy bank looks excellent. I'm not sure I understand the fence posts being suspended in the air, though. 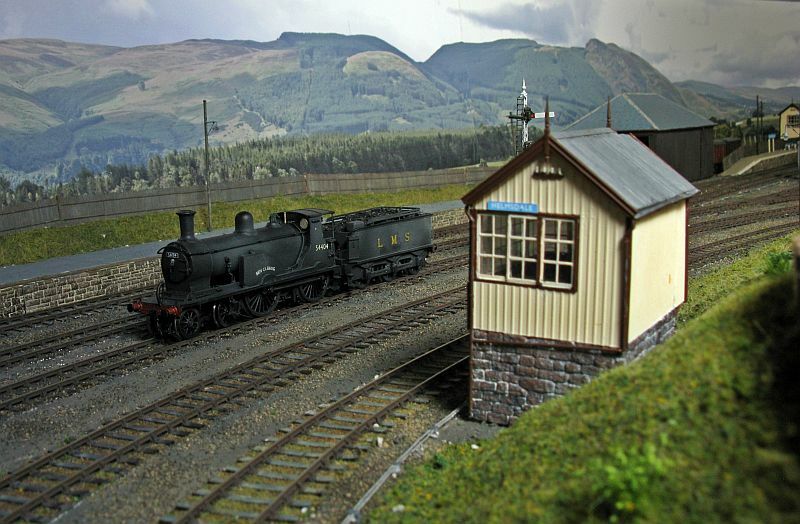 John Dew wrote: Lovely shots Richard........I do like those signal boxes!!! Backscenes are spray mounted onto to mounting board and are removeable for emergency access to the hidden running tracks- I held them in place with 1/2" square strips of wood and some vertical stiffeners of the same material. MaxSouthOz wrote: Very convincing, Richard. The grassy bank looks excellent. 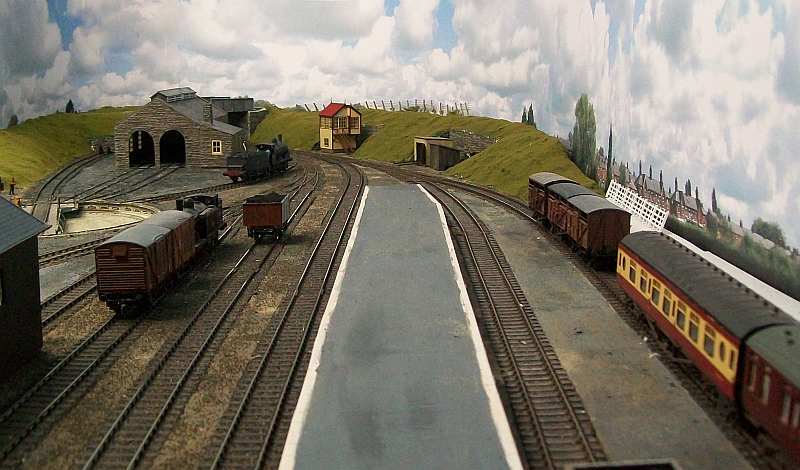 - A temporary trial to see if they would transplant from the old layout- all now fixed in place and ground bound! 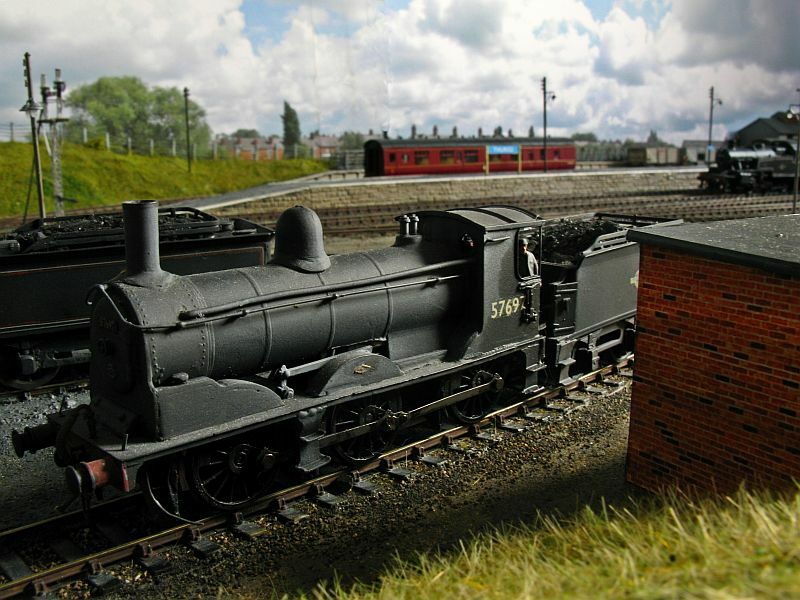 What a layout, what a modeller. I too have just come across this thread and hope I can come up to a quarter of your standard, when I get started again. Thanks for taking the time to put up the pic's and keep 'em coming.... ID backscenes eh, mmm, I'll have a look and see if I can afford some. The layout is looking fantastic. Just read through the link to RMweb and have to say it is one of the best 'start to current time' threads I have read, very comprehensive. I don't know where you find the time to model with two threads running (YMR & RM) and all the questions to be answered...! Regardless, can't wait to see more. Keep it coming. I've only had a very cursory scan through looking at the pictures but I like what I see very much and will be having a thorough read through as soon as I can find a bit more time to give it my full attention. 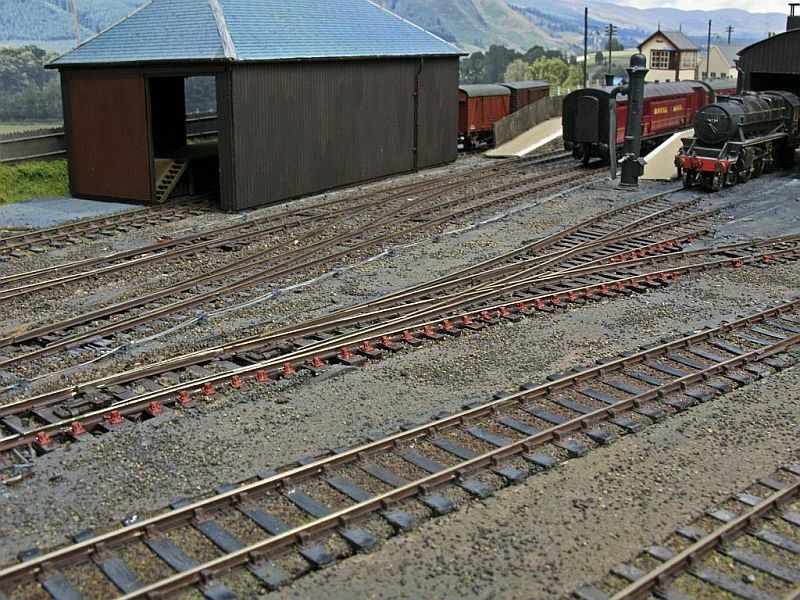 I have now reached a stage where all the basic work has been done on the layout, and soon a start can be made od adding those extras that should make it come to life- a balance will have to be struck between activity and the relative quietness of the place, although they were far busier in steam days than they are now, esp. on the goods side of things. Some more images I took tonight. 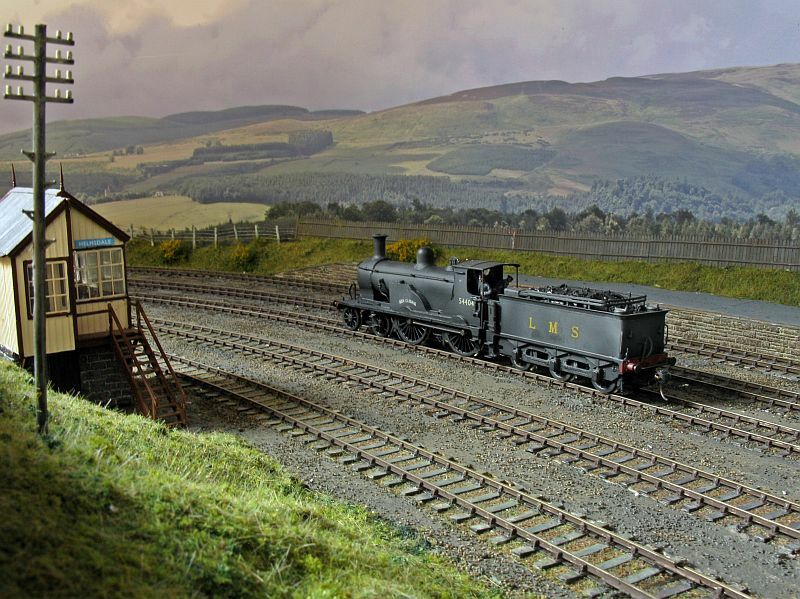 This really is a superbly realistic layout with some first rate photography to boot and the standards you have set give us all something to aim for. You have my total admiration Ben. 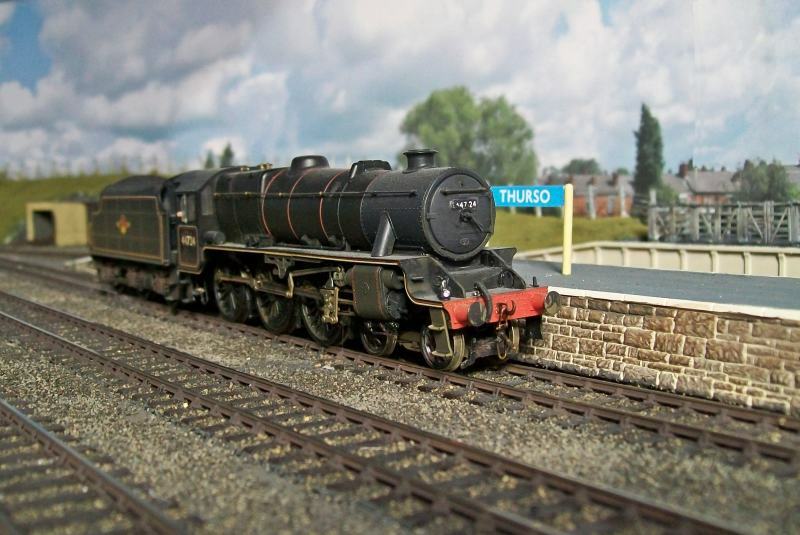 Hi RichardLovely pics and very realistic modelling. Cheers, all- kind comments much appreciated. 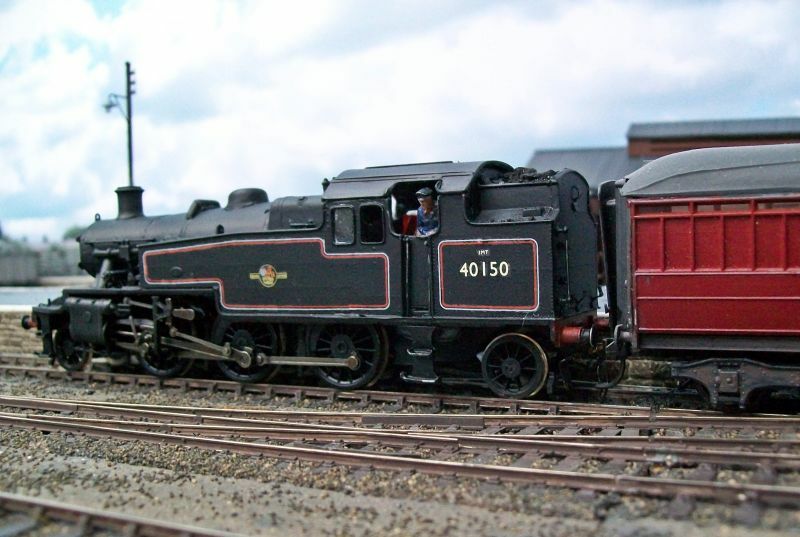 Backscenes are the 15" ID ones, and I can't praise them highly enough.Having worked the old layout without a backscene for years, I found this range when it first appeared a godsend, and the larger ones even better. Joins are tolerated in real life, but are magicced away for photos by a run of the cloning stamp. I don't do much to photographs as a rule- straighten them up and some cropping is usually enough apart from join-hiding, but some I tweak the backlighting and sometimes gamma brightness- whatever that is- to tone things down a bit, but take the approach that digital pics are free, so if one doesn't work then ditch it and try another. All these are taken with a small Kodak Easyshare pocket camera, that is more than adequate for this type of thing, and I usually underexpose by half a stop, which seems to work for me. Having said that, I treated myself to a Canon G12 a year or so ago, and was using it on the last days of the old layout, and it was producing some cracking shots, though I say it myself! I will be starting to try this out soon, now that things are coming together. Any editing is done on a mixture of PhotoScape and PhotoFiltre programmes- both free, and simple to use, and reduced to size with Irfanview. It's a strange set-up, but I found that some bits of each programme were easier for me to get my head round than others, and now I can flit between them at a good speed. A couple of pics, showing the join! And some taken recently. The Helmsdale one doesn't have its top coat yet, but most else is in place. Thanks once again for the interest. 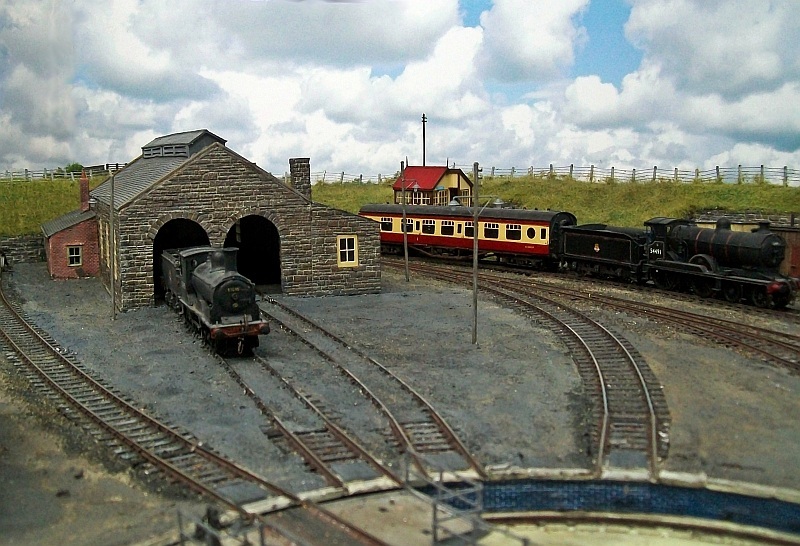 Oh well, another modelling evening gone!- While I was in the mood, I have found three images taken with the Canon from the old layout, which hopefully show the better capacity of this camera. Many thanks for taking the time to explain the back scenes and for the additional pics. Will have to buy a similar one then place some card-mounted buildings in front for a 3D effect. Only just caught up with this thread. What an amazing amount you have achieved in such a short time frame! 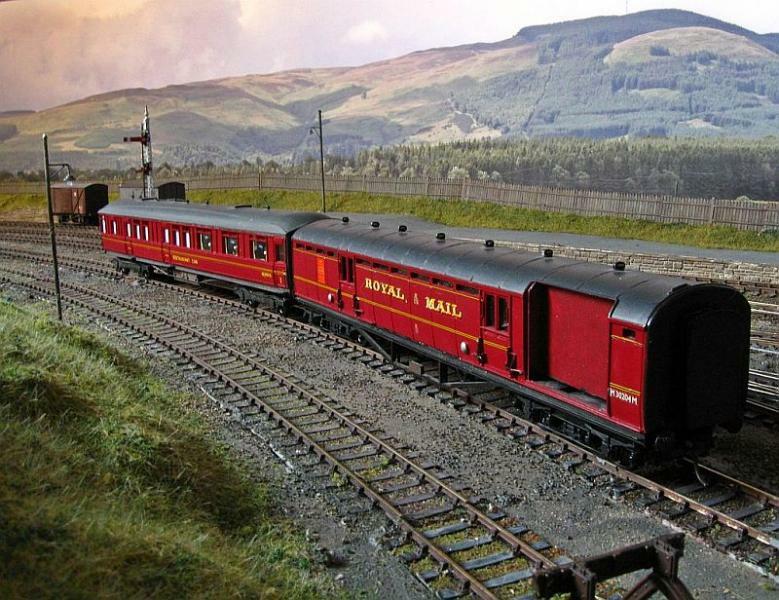 Not only the amount of work,but the extremely high quality of modelling is very,very inspirational.I have read all through nursing a glass of RLW and I now have another modelling hero,and fully intend to check out all your old posts on RMWeb to discover your other layouts. Nothing dramatic to report I'm afraid, but I have been putting in point rodding, a tedious job, but one that helps create the overall picture. It is a bit rough and ready, esp. where it meets the points, and would not please any track expert, but passes muster for me. 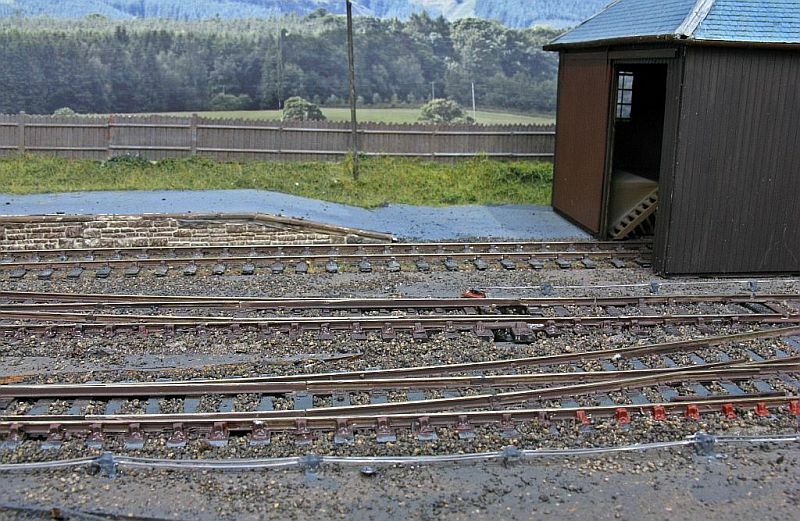 Some of it can be seen here- it is still being weathered and finished, but is another step along the way.The solitary terminus signal can also be seen. 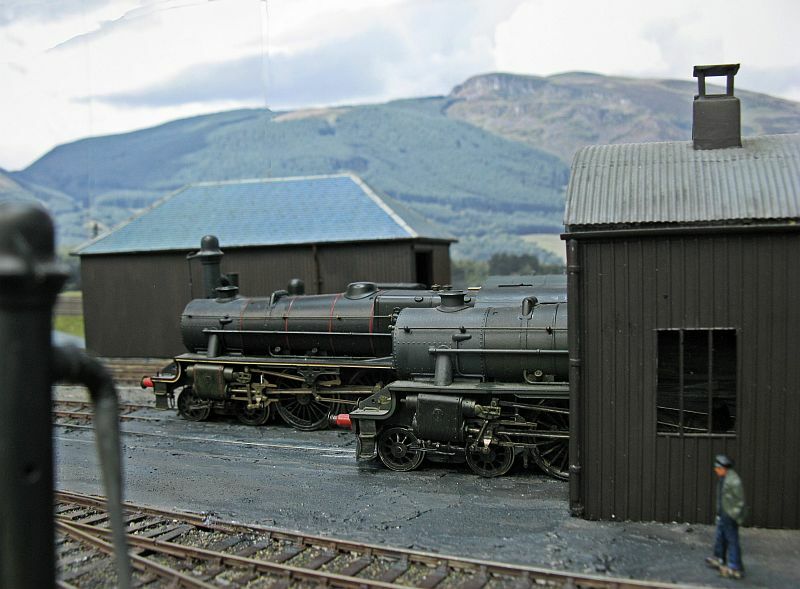 Gremlins struck again at the last posting, and I lost some of it- again- so here are a couple of Helmsdale- a quiet shed scene and one of the resident 0-6-0's waiting its next duty. Great stuff Ben. 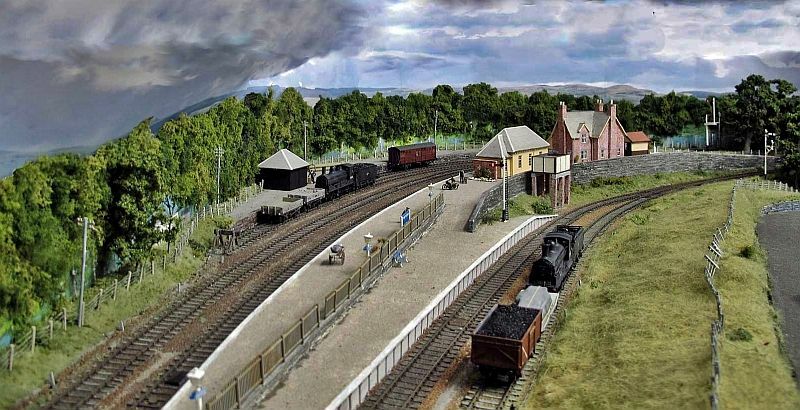 This layout gives a real feel of a railway. Keep the pic's coming, and next time you're in Brisbane you can come and help me. Hi Richard.May I enquire whether the point rodding is made or bought and, if made, - from what, if bought - from where? 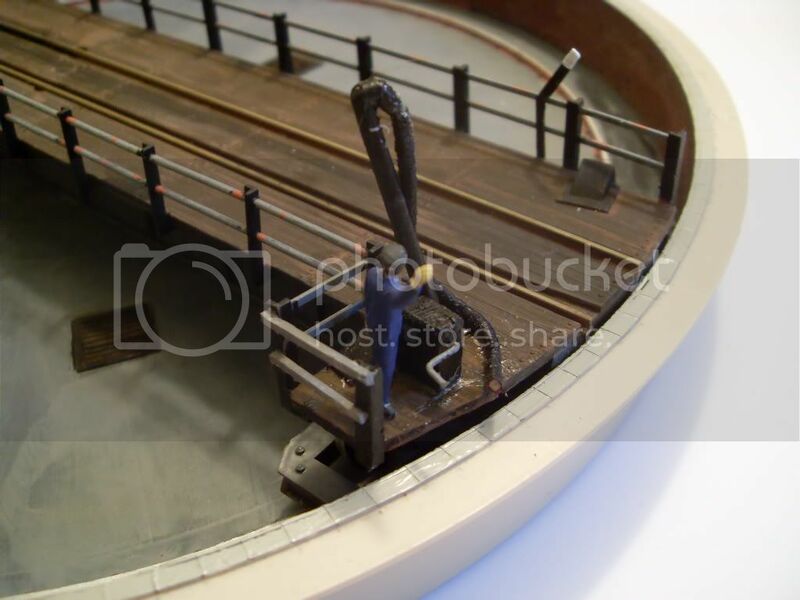 The point rodding consists of cast metal stools from MSE - http://www.modelsignals.com/4mm_scale_frame.htm -, items LS005 & 6- and etched cranks, and the rodding itself is 0.4mm brass wire from Eileens Emporium- https://www.eileensemporium.com/index.php?option=com_virtuemart&page=shop.browse&category_id=131&Itemid=9 - and a lot of tedious handwork! The finished effect is worth it though, but there is no ready made for this, I'm afraid. 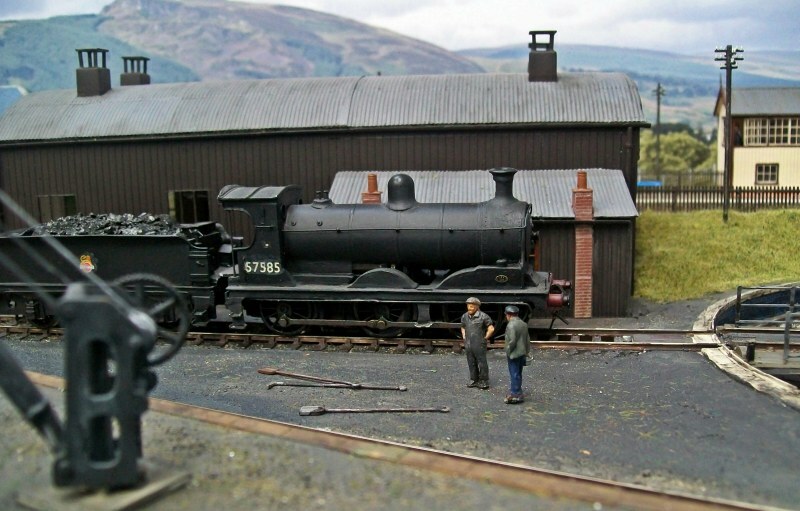 The Caley 0-6-0 is the subject of discussion between a fitter and its driver- obviously there is something needing adjusting on the engine. Meanwhile, it is tea break at the small PW dept. at Thurso. 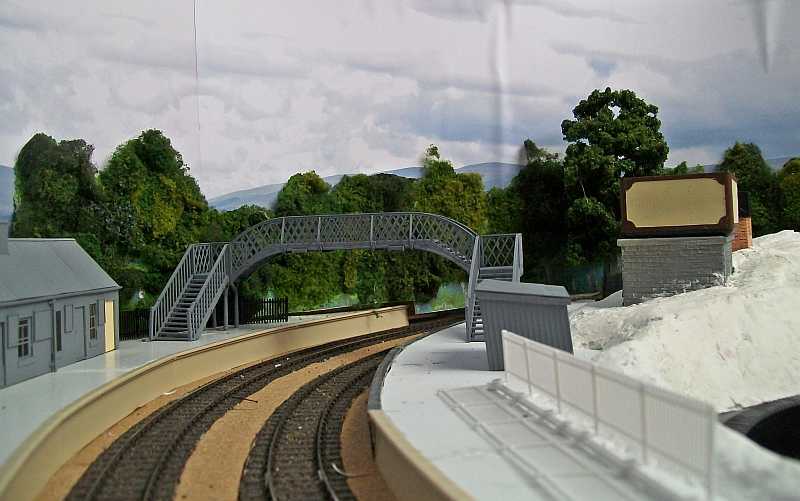 Work has more or less been completed to a finished state at the two stations, and next job is a through track cleaning session and test of the hidden loops and scenic sections, which have hardly run together yet- no doubt some glitches will show up, hopefully nothing too much. There is still a good deal of wiring to be done- good old 12v DC- to join up the controllers to allow a full cab control working, but I have managed to pull a back muscle again, so there will be no stretching and bending underneath a panel for a week or two. It won't be lost time though, as I have moved to the workbench and am deciding what to tackle next in the way of unbuilt loco kits- might be an idea to wait a week to see what Hornby have planned, perhaps. One year they are going to surprise me! Very nice Richard. I would think these smaller places would be kept quite tidy, but there would probably be piles of useful materials such as rails, sleepers, chairs and sand and ballast kept somewhere. Plus the odd oil drum or two, barrows, etc. I may have missed it, but may I ask what make is the turntable? Is it a modified Peco? Cheers all, - most photos of these smaller sheds do appear to be fairly tidy except for ash piles, that were transitory things, so an uncluttered approach is called for, I think. The turntables are both Roco metric 60' models. 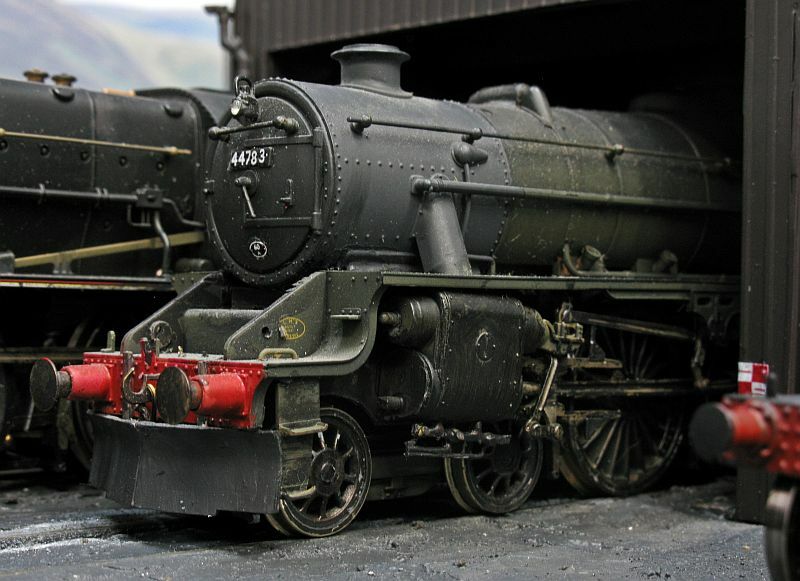 if you know what I mean- forget the length in metres, but it manages 4-6-0's and can just hold an A4 or Clan if I'm feeling frisky! The cost is eye watering but it is fully indexed and with a bit of tidying up can just about pass for a British type. I looked at the alternatives, but there is nothing nearly approaching this type of quality around. 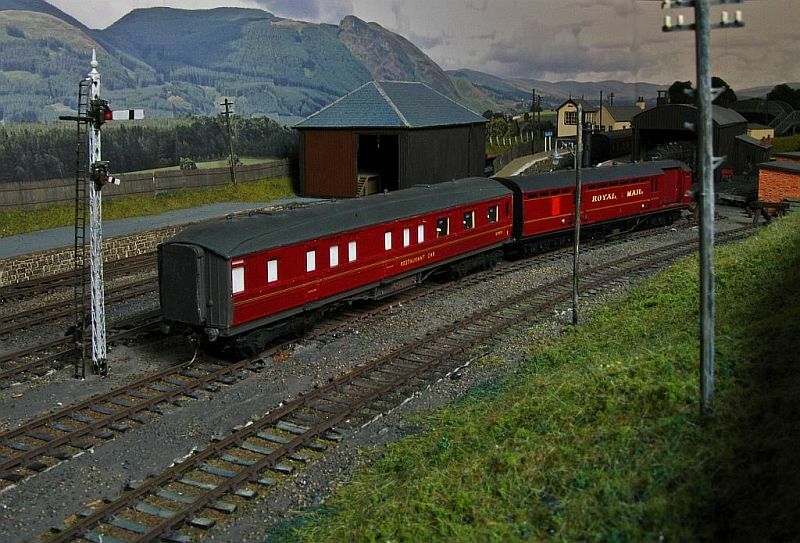 Metalsmiths do a 70' equivalent of the prototype Helmsdale model, but have yet to get around to doing a 60' version, and I wanted to get the model finished so opted for this one- very pleased with it as well. Hi RichardI agree with you about the price! 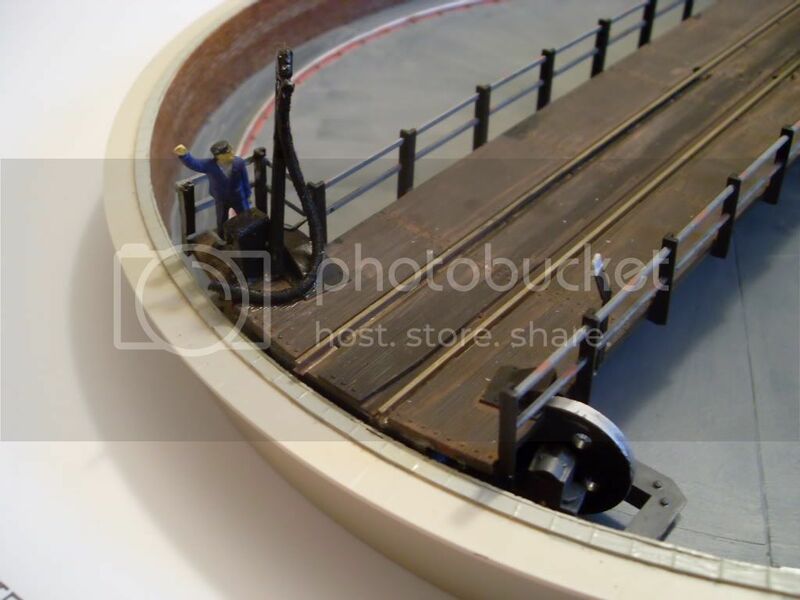 However, yours does look the part.I have made do with a modified and motorised Peco turntable.Keep up the good work! I loved to see photos of your late layout but the new one is better still. You really have built a layout that is great for taking photos with beautiful integration of background. Thanks, this layout has been built with the natural light firmly in mind, and I should have some good daylight shots to show next year- no light at all here just now, I'm afraid. The last layout was rebuilt in its room before I entered the digital age, and was crammed in with no thought to light and camera angles. 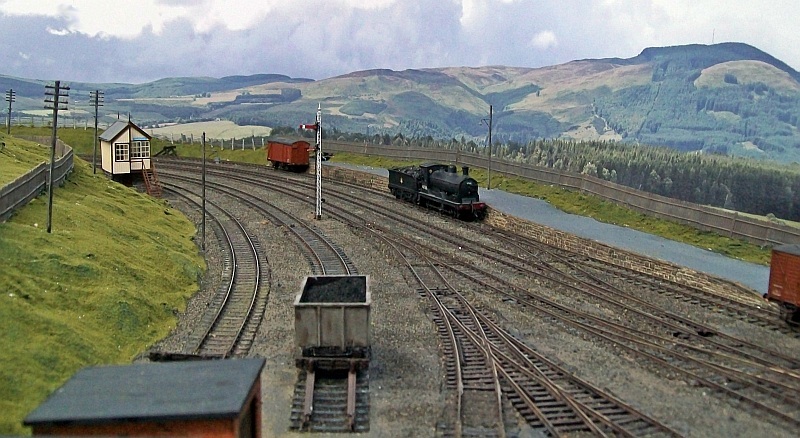 Looking back, I should have positioned The Mound better, as I regret taking it apart, but the two new stations use the space far better, and apart from the branch train, much of its workings can be transferred to Helmsdale, so all is not lost as far as that is concerned. Edit- a shot of one of the fishing vessels from the old layout. it's the attention to detail that's so impressive Ben. 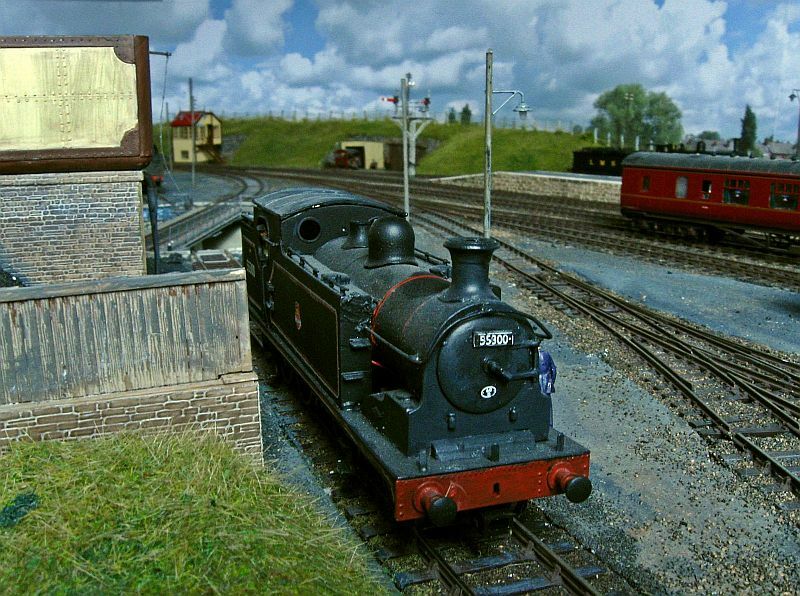 Apart from lovely modelling, this careful detailing does indeed move it up from a model railway to a miniature of the real thing. Most imprssive. 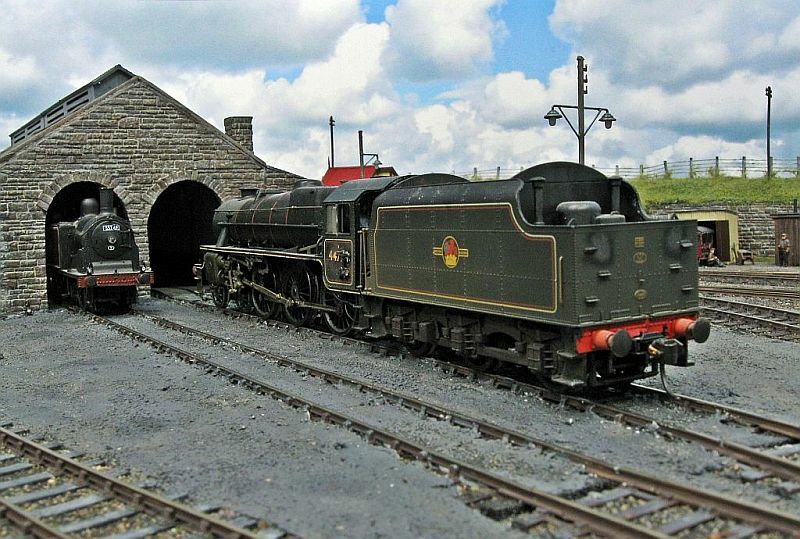 That shot you posted of the loco exiting the tunnel taken with your Canon has wonderful depth of field. Can you remember if you took it on a manual setting or is that camera capable of such things on auto ? ,- thanks .... The photo was most likely taken on AV - I tried out various settings on the Canon, and in fact don't even think I've used the automatic one. One of the main reasons for upgrading, apart from a hopeful increase in picture quality was to get back to having to think when taking a picture, and I found that AV tended to give the best results. I'm still finding my way around this camera, and it has been neglected during the build, but will get back to it now I am not so focused on the layout construction. 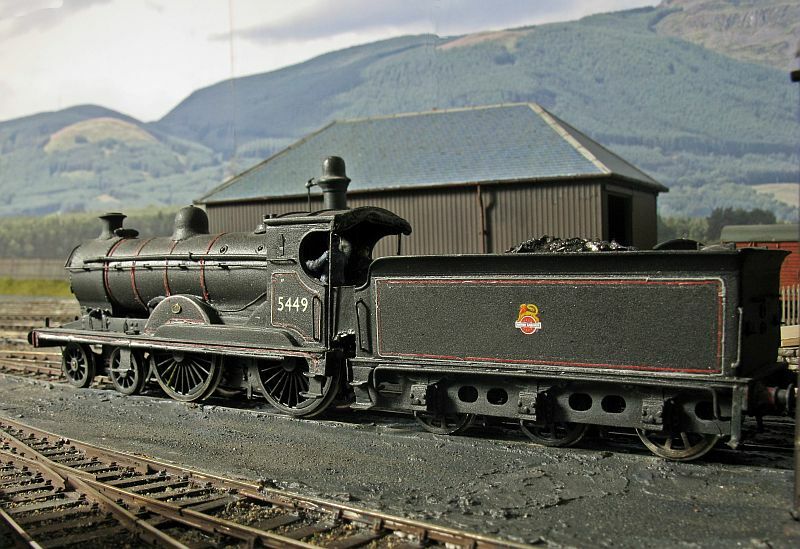 Another one from the archives- Black Five's aplenty on shed at Kylesku. The end of a busy year for me- created a new layout at a pace previously thought impossible- and hope next year to have some more "finished" pics to show. Anyway, thanks for all the interest shown- greatly appreciated- and wishing All The Best for the coming Year. Happy New Year to you too Richard. Thanks for providing us with much inspiration. Nice touch, and a very nice layout. Happy New Year one and all. A super shot once again Richard. My best wishes for 2013 to you and yours too. Despite my silence of late, I have been busy- at the bench ,adding to the loco roster, a task that I find takes far longer than putting together buildings, but progress has been made, and some area specific engines are now on the layout. They will probably mean little to those who are unfamiliar with the place and time modelled, but they do set the scene, and some have been in the pipeline for far too long....., but at last are running. 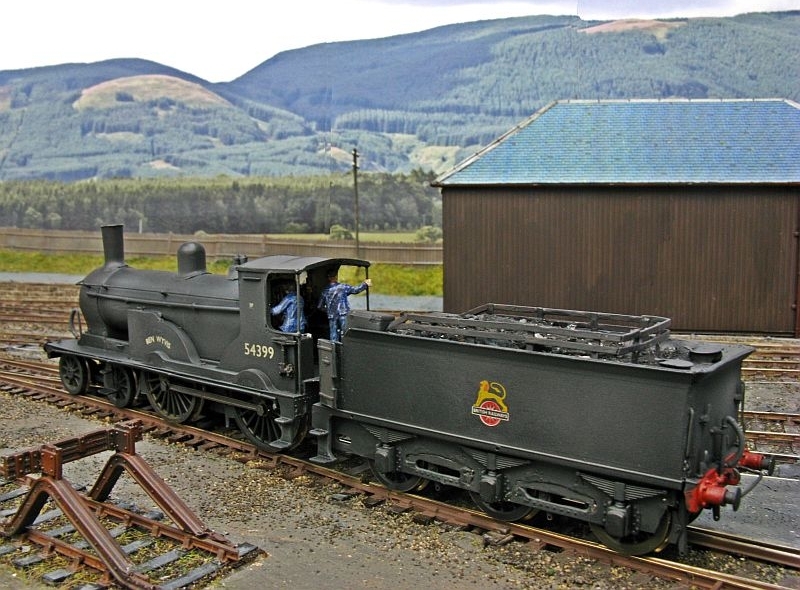 This is a Stanier 2-6-2T that worked the Thurso branch till the end of steam. The Small Bens have been breeding- Ben Wyvis here, with another two to follow. Contd, due to usual techie problem. 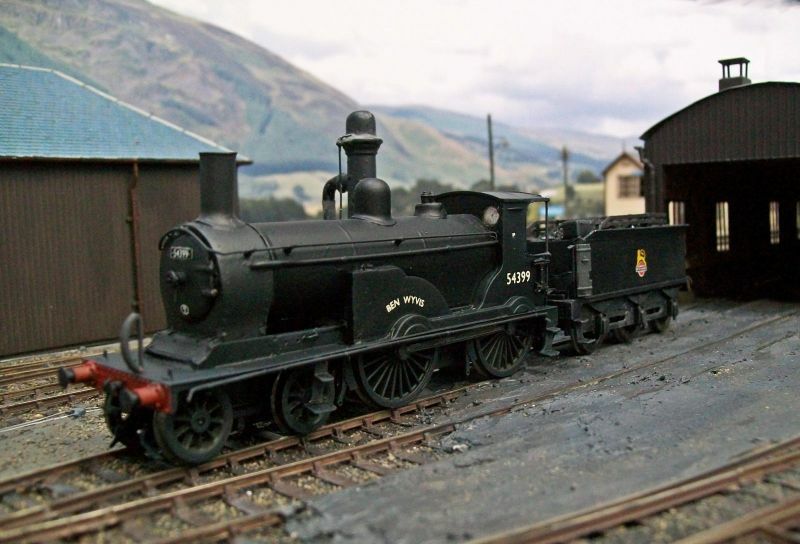 Ben Alder in its lined black mixed traffic livery -it never actually received this, but whatho, - it looks good! Quite outstanding, sir! I find your photos inspiring. May I ask did you scratch build them or modify ready to run? 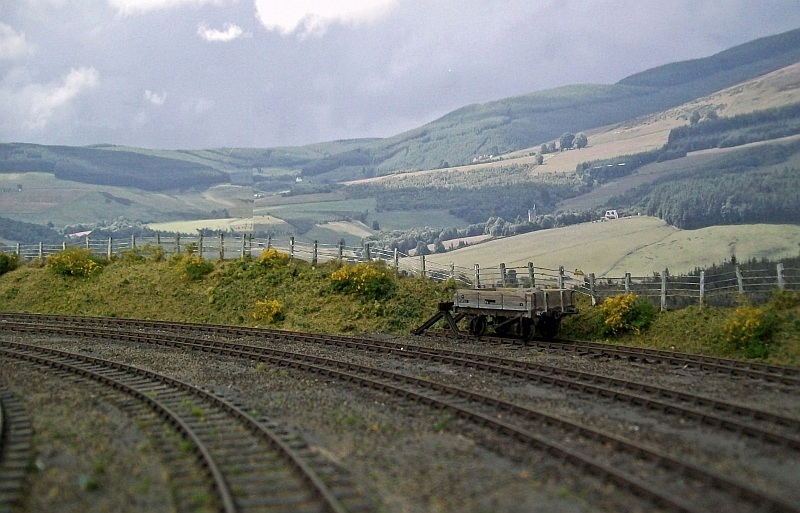 Thanks both- they are basically Hornby T9's cut about to give a more Highland shape. 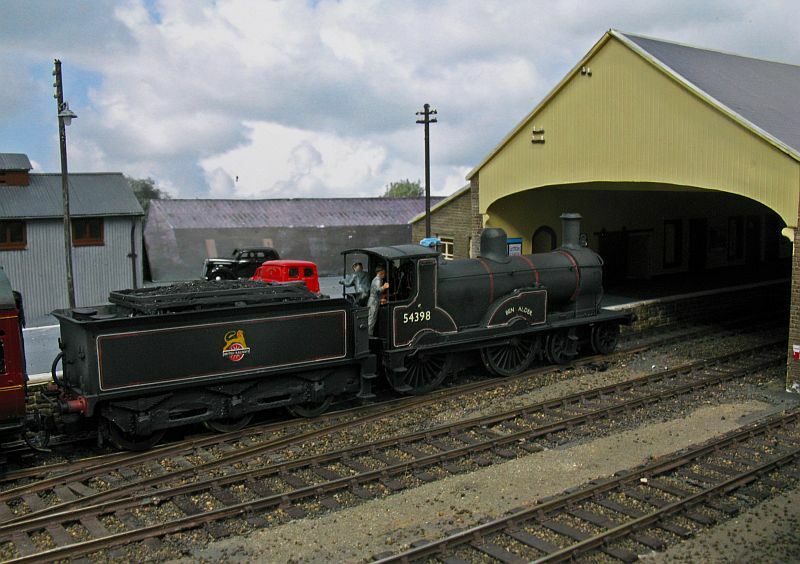 Both engines were designed by the Drummond brothers, who swapped and shared ideas, giving a distinct "family " appearance to their locos. 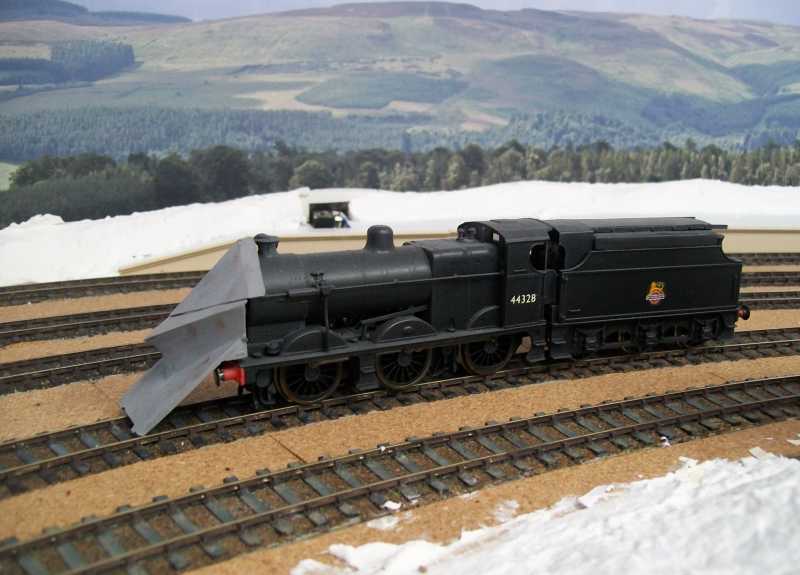 They are actually a bit too beefy to be a scale model, but the superb running of the Hornby engines made the original idea of an old white metal kit a no-no. Parts from the kit were incorporated in Ben Alisky and Wyvis, but my improved Ben Alder had to be improvised. 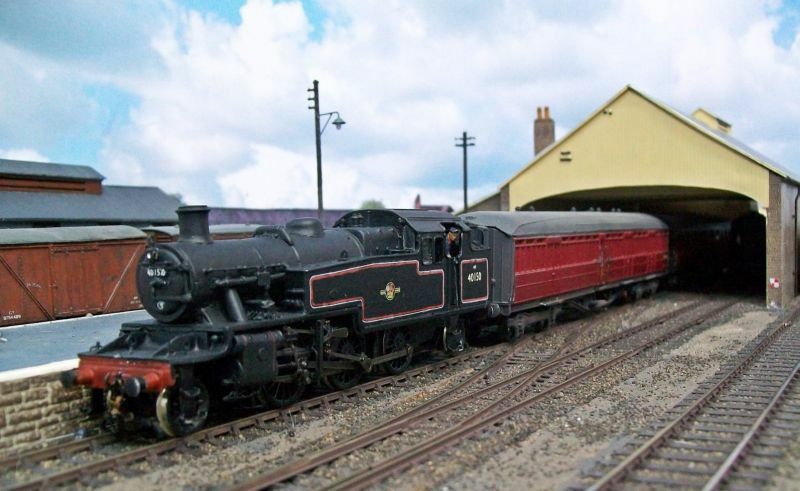 TBH, I've got beyond worrying about a mm or two here or there if I'm ever going to get pre-group locos running to current standards, and it is only really in broadside views that the compromises can be seen- a slightly excessive wheelbase and a boiler that is too long by some mm. The drivers should be smaller as well, and I did try adjusting some of the errors, but all that did was accentuate the others, so decided to leave well alone and live with it. 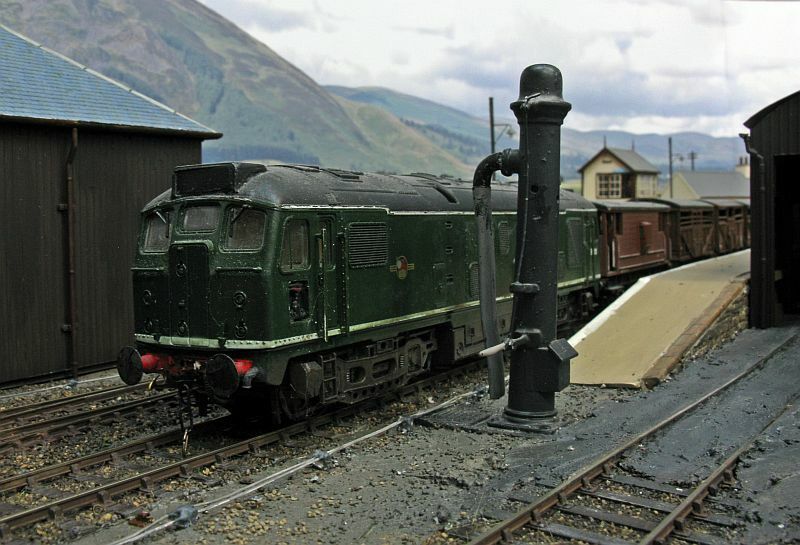 The reason others are appearing is the availability of spare drivers to get rid of the traction tyre, which released some donor engines for further duties, hence some extra Bens- they will be put to good use! 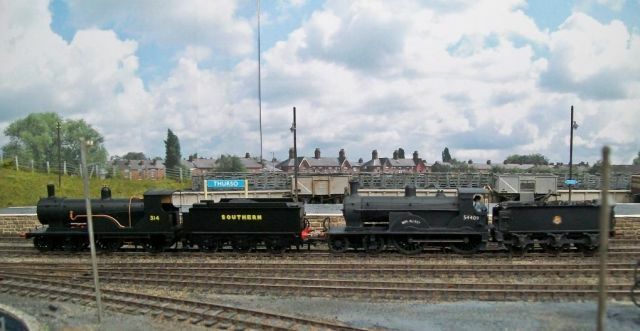 A photo showing the original Southern loco and its distant cousin- new smokebox boiler fittings , altered cab and cut down tender change its appearance quite a bit. 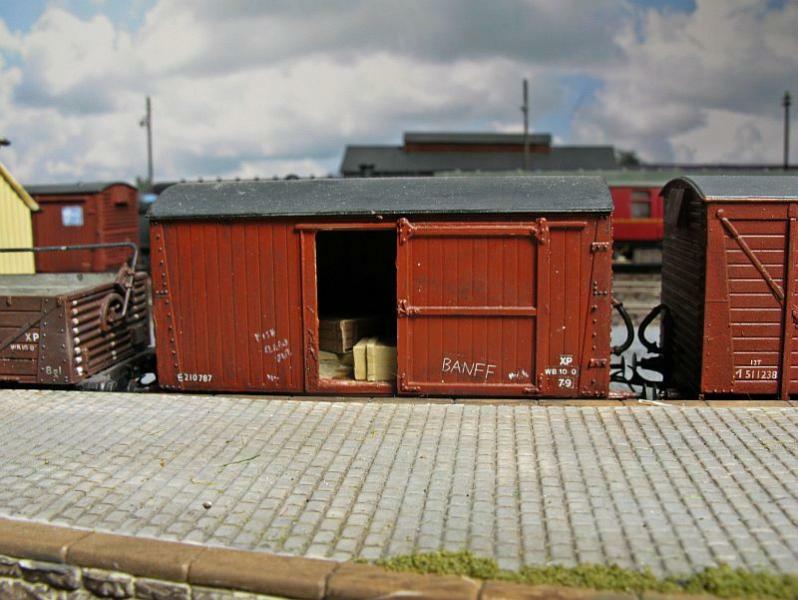 Details of the work involved can be found here -http://www.rmweb.co.uk/community/index.php?/topic/69241-ben-alders-workbench/ - to save me going over it again! Great work, they look the business! 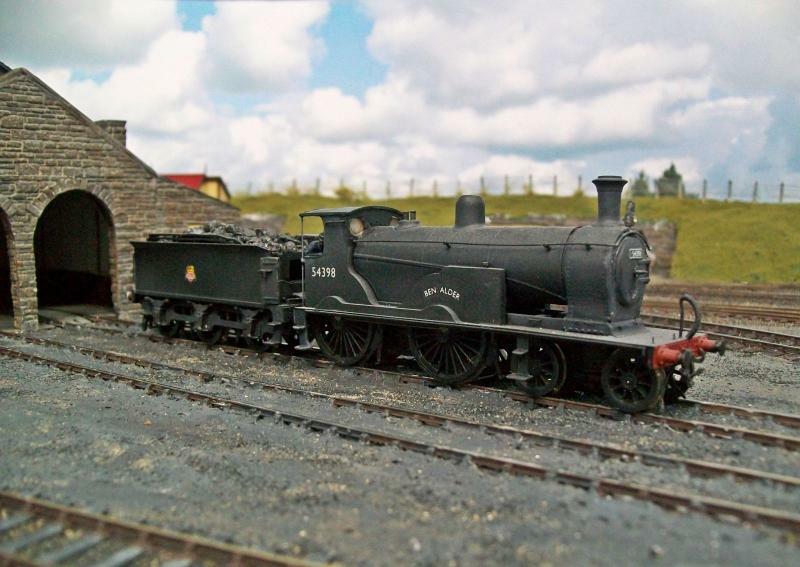 I am sure some rivet counters will disagree but our hobby has to be full of compromises anyway so a mm or two doesn't matter if the loco looks right and gives the right impression of the original. 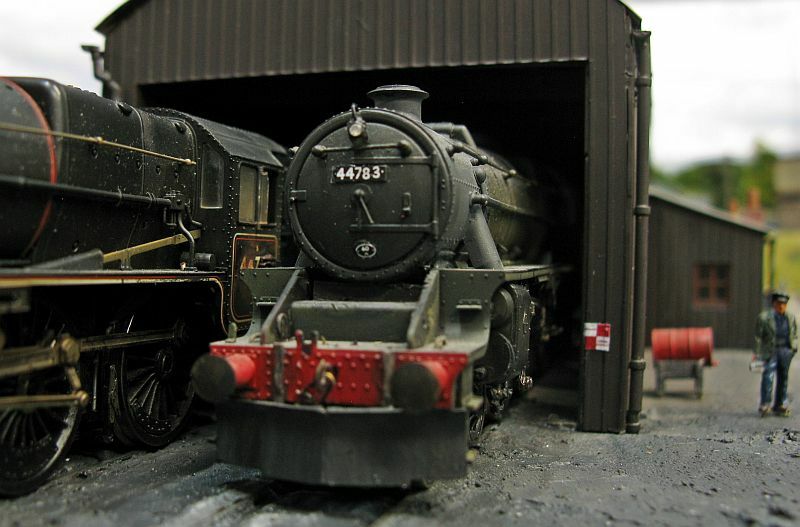 Unfortunately all my modelling has stopped until I get a 12x12 shed installed this spring ( whenever that is). Love your posts, so many thanks for them. 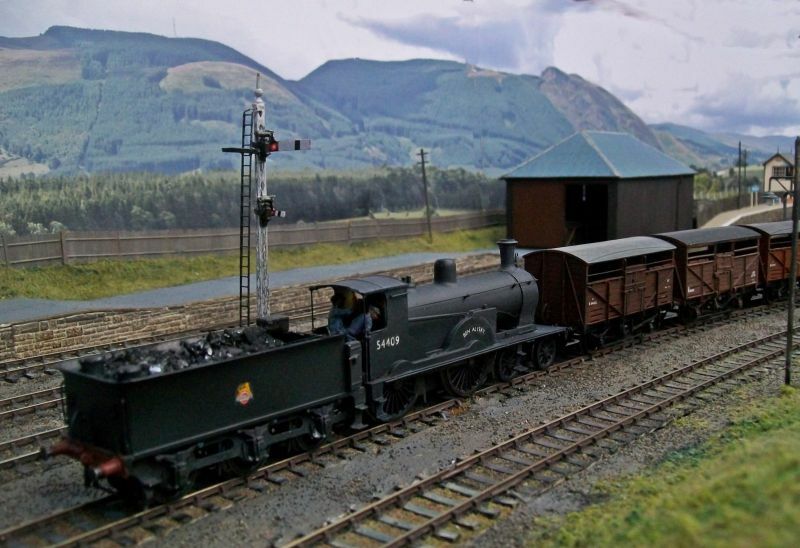 Another build has been one half of the pair of 16XX GW panniers that lived at Helmsdale to work the Dornoch branch- for years I had a Bachmann one renumbered but the 16XX's were noticeablly smaller, so a couple of Nucast kits emerged from the pile and were put together. Unfortunately one's progress strayed behind the other, so it has been packed away for a bit while I turned my attention to other things, but here is the one busy shunting a restaurant car during its rest spell from branch duties. Edit- notice the two different restuarant cars- this was because I was trying a different coupling system and there would have been some unsightly omissions from some of the views- no corridor connections for example-no doubt I'll explain later! Well, the things you learn on this forum!I never knew that ex-GWR locos traveled that far north. 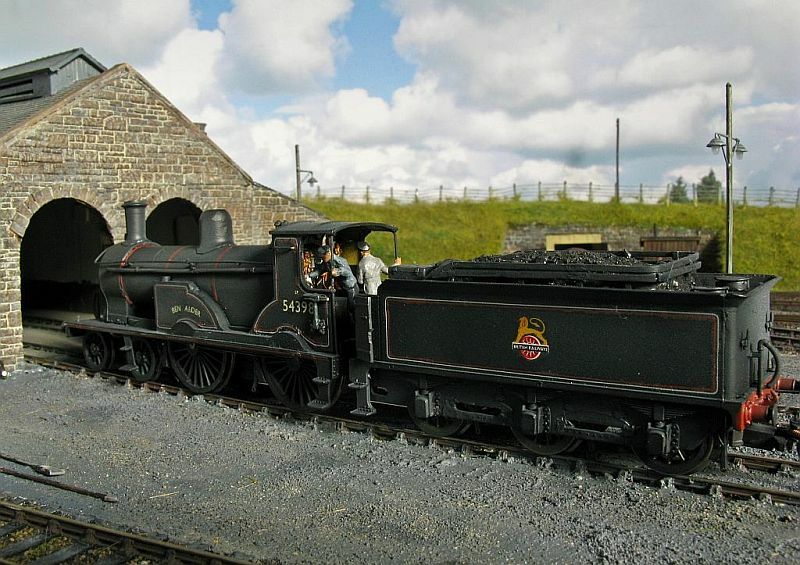 However, I am not surprised, some ex-LNER B1's found their way onto the North Wales Coast line. Such a lovely layout, keep up the good work! 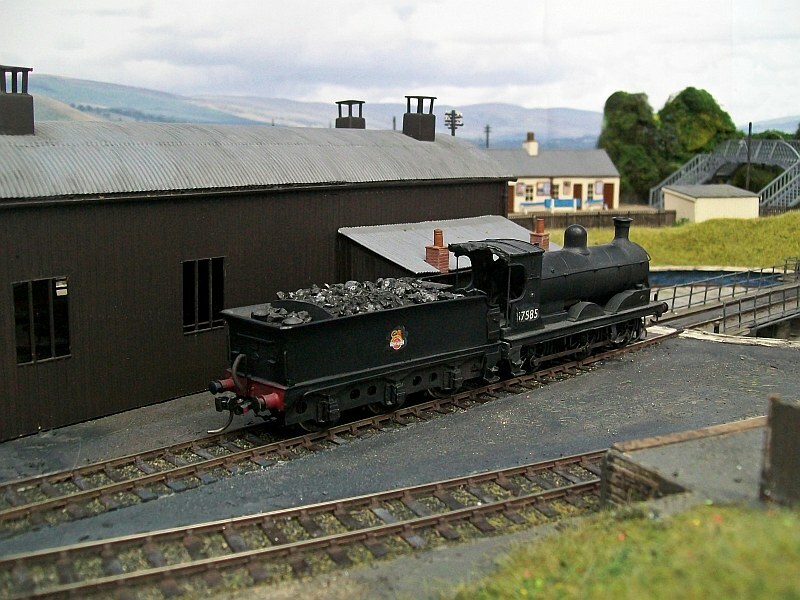 A Pickersgill 4-4-0 backing on to the coaling stage. Great photographs as usual Ben. Always a pleasure to look at. Thanks. 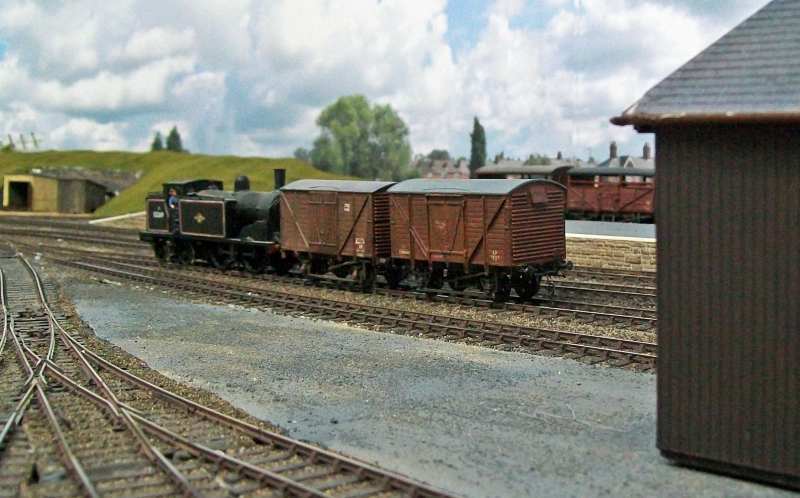 A couple of Black fives on the layout- I have been busy with wagon building as of late, and also some fettling of trackwork to get everything working without faults- nothing major, but building the layout on top of the laid track did cause some knocks that needed tweaking. The second shot is a cracker Ben, a typical spotters shot from the platform. Marty wrote: The second shot is a cracker Ben, a typical spotters shot from the platform. My thoughts exactly ! 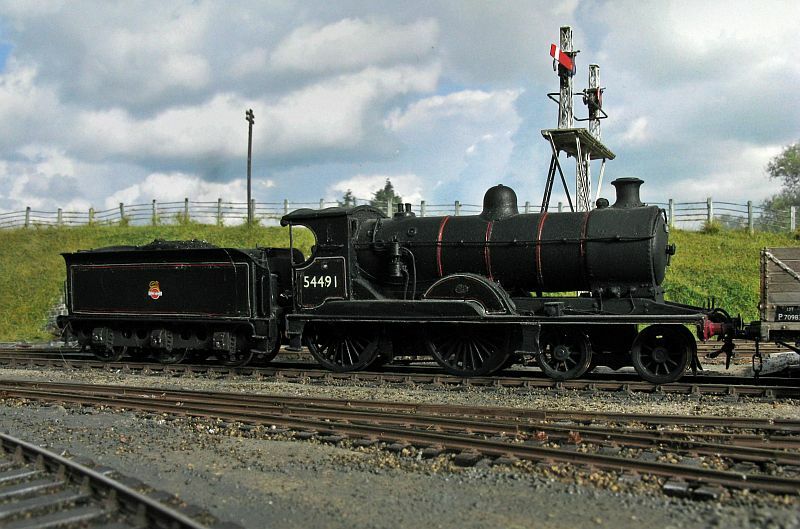 Something special about the Black 5. What is that mounted on the side of the cab, below the number ? I think the second shot is a photo of a real train! I'll go along with that - those last two shots are real stunners. I love your work Ben. Thanks guys,- it was taken with a small Canon I acquired second hand a few years ago and have just gone back to as it has manual control, and takes a better image than the Kodak. The thing on the cabside is a tablet exchanger, as used on single lines to pass tokens from signal man to crew without stopping. The thing I like most about this forum is that even though I've been a member for a few months now, just when I think I've seen all there is to see I discover another gem. I love this layout! It is both inspirational and aspirational. 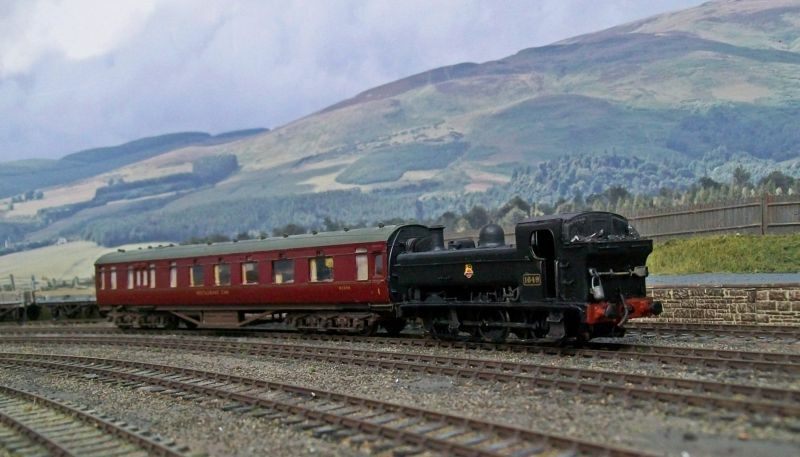 -Thanks for the kind words- funnily enough they are what I often use myself when describing my efforts- trying to encourage more Highland section modelling, and showing that if I can achieve anything then anyone can. Little of what I do can be described as finescale or serious modelling, much being based on what is around R-T-R, but willing to sit at a workbench and adapt where necessary. Modelling a prototype makes things easier, I find, and the plethora of information around on the internet makes things a lot easier than before. Modelling forums are also helpful in picking up tips and help- you are never alone in any modelling project nowadays. 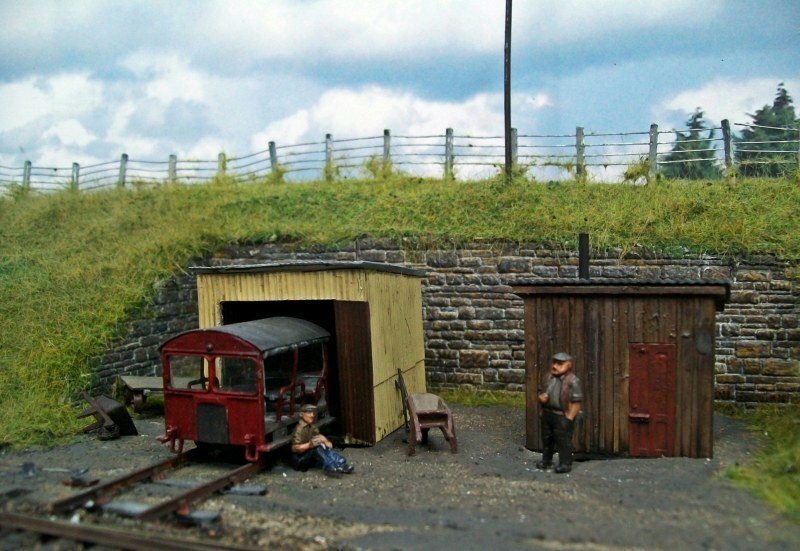 A couple more photos, including an LMS van made recently from a Cambrian kit. As always, I'm all behind like the cow's tail! Love this photo! How was the boat built, Ben? Was it solid or plank on frame? It looks superb! Its virtually impossible to tell these photos are not of the real thing!!! 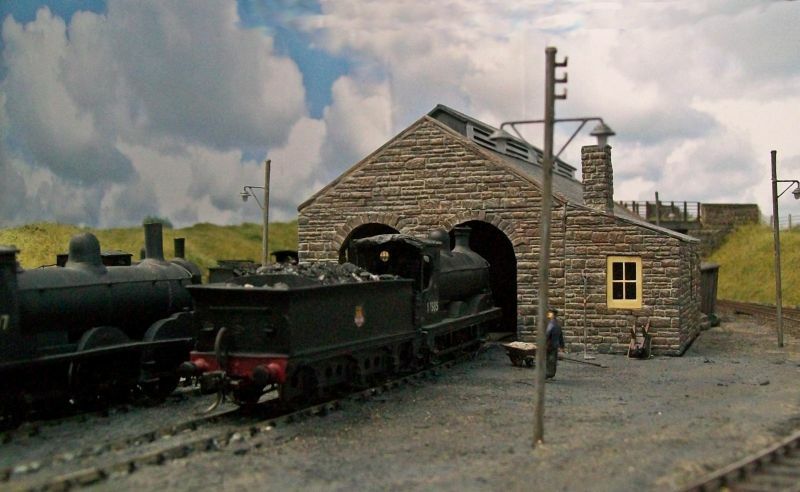 Unbelievable...marvelous modelling AND photography!Love this thread,and I'm going to sit back with a beer or three later today,and go through the lot again from start to finish.What a treat! 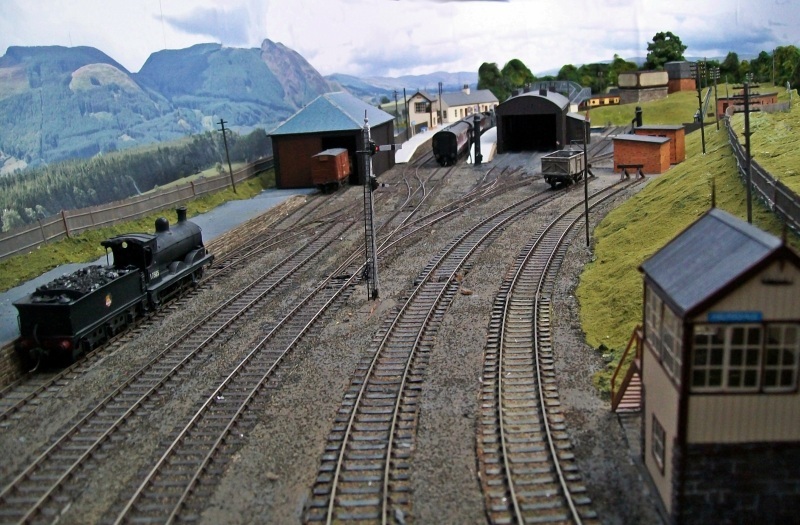 This is an excellent layout, just love the current 'Robert's Choice'. I've done just that, and totally agree with everyone's comments (only two beers though). Haven't been to Scotland for some 40+ years and the nearest I got to this area was Fort William, but brings back memories of the scenery. This has been a much better way of spending a Sunday afternoon than watching tennis. 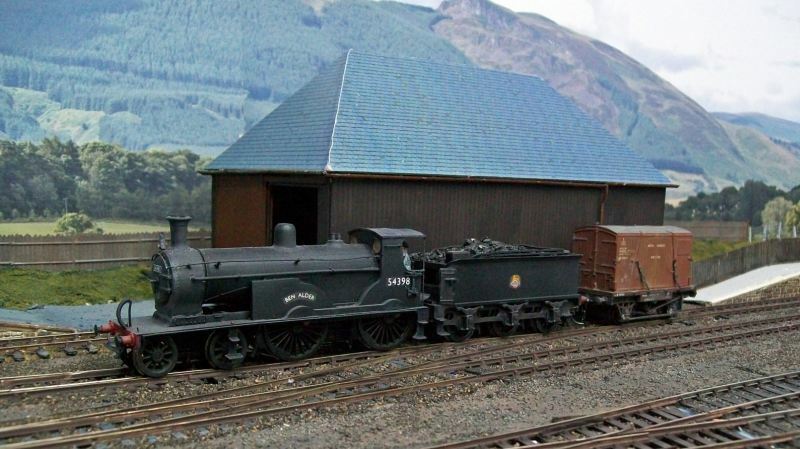 It's been a while since I last looked in Ben and I'm glad to see that you are still maintaining such high standards both in your modelling and your photography. As others have said everything just looks so realistic and I had to do a double take at some of those pictures to be sure they were not the real thing. Thanks for all the kind words, and I am flattered to be chosen pin-up of the week! The boat was a resin and lost wax brass kit made by Anchor Models , and are no longer made AFAIK, which is a pity. 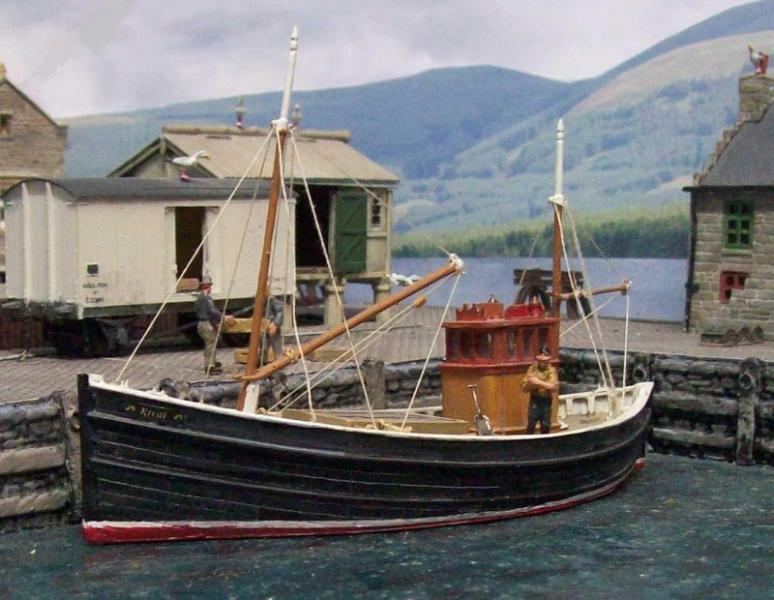 I had three or four on the last layout, and will look out some pics of them- v. nice models of bygone Scottish fishing boats, and sadly missed. Meanwhile, a few more recent shots- these were nearly all taken with the Canon Powershot on AV, and mostly in natural light, which gives far better, if variable results than the electric version. I also like how the back-scene is worked into the layout, very impressive, enough flattery, people will think I'm after summat. As a aside Artitec do some lovely if somewhat expensive boat models. 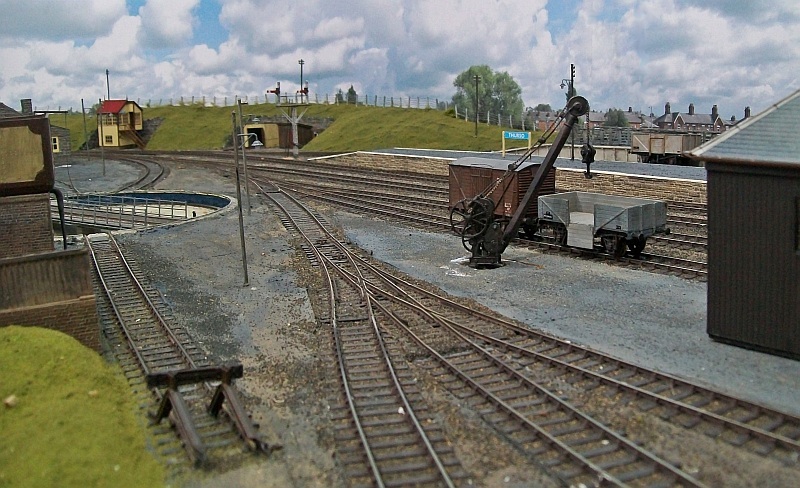 I have used one on my layout and Chris Nevard used one on Cement Quay. Just gone through the whole thread again, the layouts are quite stunning and the backscenes are second to none. 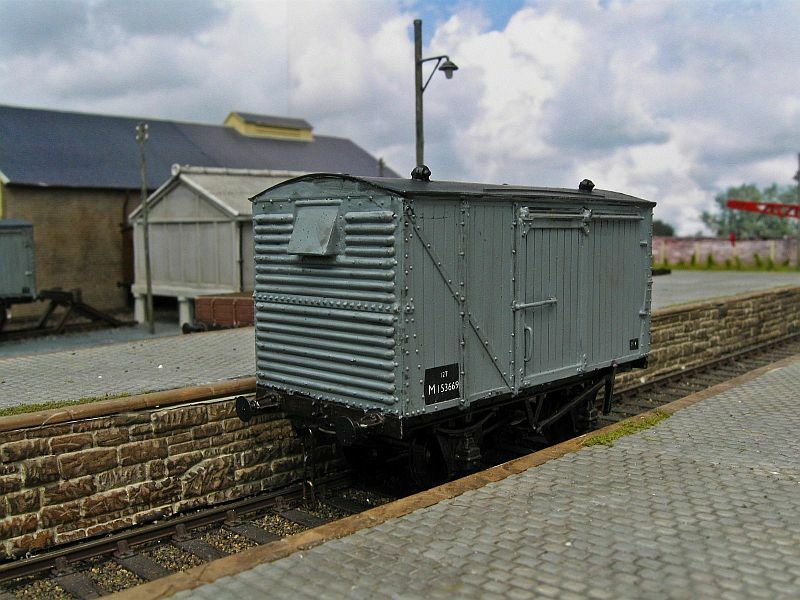 Thanks- one or two more, starting with a weathered van at Thurso, and then a view of the coaling stage and water tank. Then a couple taken at Helmsdale recently. Incredible detail Ben - virtually nothing to suggest they're not "real" locations. You must have spent a long time studying the full size version and your powers of observation must be good to incorporate all the "little things" that take it to the top of the modelling field. I love that displaced edge stone in the first shot - together with the scrape marks that dislodged it. Are they outdoor shots ? If not, your lighting is superb. Thanks,- the lighting is indeed superb- it's natural daylight coming through a Velux, and gives very interesting results at this time of year, if you are around at the time.... that, and the little Powershot with manual controls does the rest. Thanks for the excuse re. the displaced edging stone- it only really shows up in digital, but is one of the many that needs to be attended to. Lots to be done yet, but I'm getting there. Please don't "attend to it" Ben - I honestly thought it was done on purpose and was one of the "details" I referred to. 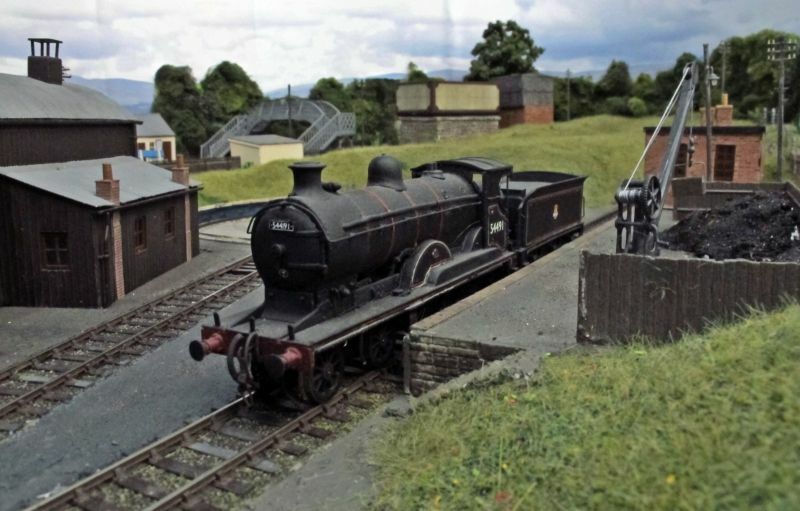 It is perfectly conceivable that it was hit by some passing loco or wagon - even down to the paving having lifted during the event. You can even see what could be scrape marks just before whatever hit it, dug in and lifted the end of the platform. Perhaps some kind of warning barrier to keep people off until repairs have been carried out. I don't think they used that red and white tape in those days but a hastily erected post and wire fence with a "Keep Out" would do the trick. I thought it a really nice touch. I too thought the damage to that part of the platform was intentionally modelled for effect. As I said stunning work. Right, thanks- I'll leave the stone alone! The setts will need a bit of flushing though, although I suspect that it'll hardly be apparent to as it is at a casual glance- another case of the unforgiving digital eye here, I think. 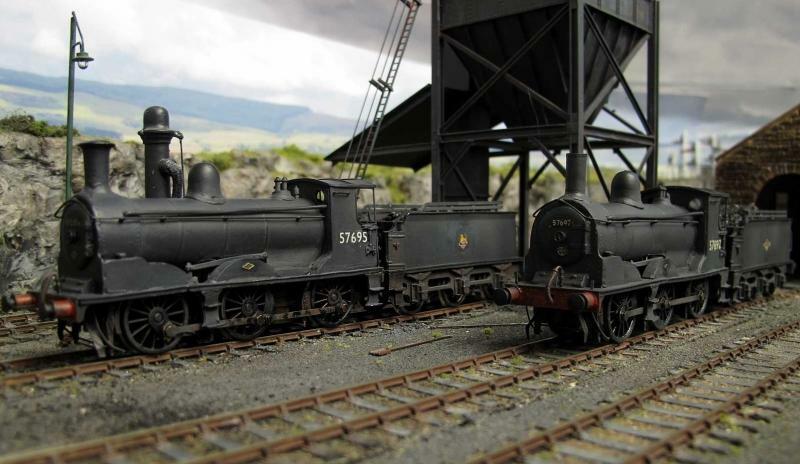 And one of the shed, with the Ratio coaling tower- they have been kind to the HR area modeller, and a view of The Mound, which I might have posted up already, but irs one I'm fond of, so we'll see it again, perhaps! 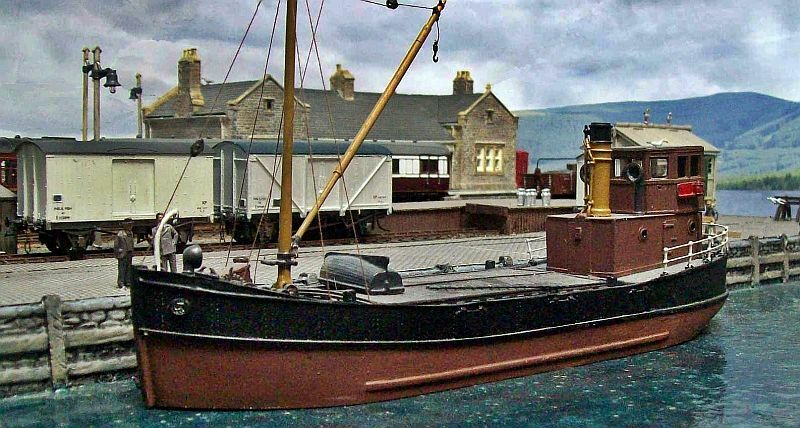 And lastly, another of the fleet- a Langley Clyde Puffer, as immortalized in the Para Handy stories. A bit of a test here- an image uploaded to 1024, as mentioned in the recent photographic upload topic. I always resize mine to 800 wide Ben. Good picture by the way - I note the coach has featured in earlier shots, is it kit built ? I have been taking advantage of the recent good weather to do some airbrush weathering- spray booth being the back door.... thus limiting frequency of usage severely. but the Bens now look their age! Thanks,- most of my weathering is drybrush and washes, but locos do need an airbrush to get a smooth finish. I apply tis with very diluted acrylic coats- Humbrol 79 being the base, and with this lot I used their recently released acrylic thinners, which worked well with the airbrush. I never worked with enamels this way- far too toxic for my liking- but with a compressor set at a low pressure I'm quite happy to spray away; but then I'm only doing thin washes, and some of it is done on the table inside- don't mention this to the wife, BTW, she's off on holiday at the mo. Another distraction recently was trying out macro shots with the camera- I've gone back to manual operation- far more fun- and here are a couple from the last day or two starting with a general shed shot. Now you are really teasing us ! Those close-ups are fantastic and to say your just having a play with macro function, eh ?? 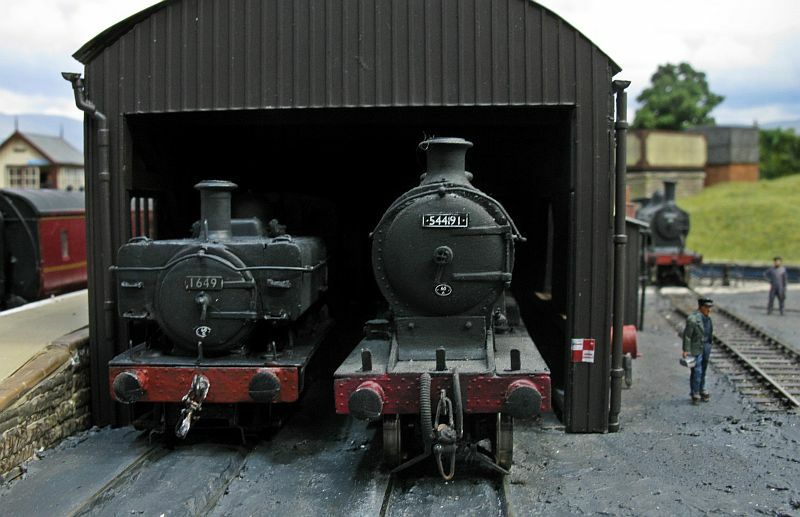 The two Black 5's look awesome on shed. I just feel like giving up !!!!! Thanks all- I'll come back to this later, but here's some more of the close up brigade, and another of a slightly distressed Ben. 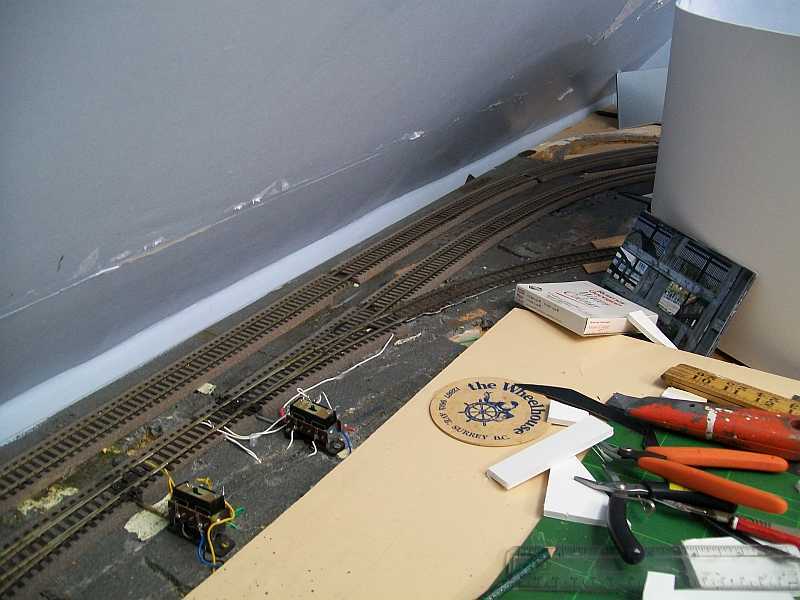 The latest work has been with the Peco points- trying to make them look a bit more like British trackwork- which has involved sticking cosmetic chairs to the outside of the track. A bit tedious, and still ongoing, but makes a difference, I think. And finally, another close up. This shot shows a modified and untouched point, for comparison. The untouched one is behind the worked on one. That certainly makes the connection between the rail and the sleeper Ben. I,ve never noticed before, but now the bought one looks as if the rail has just been laid on the sleeper. Great layout and photos. Just love those backgrounds. Can I ask where the shed personnel came from? 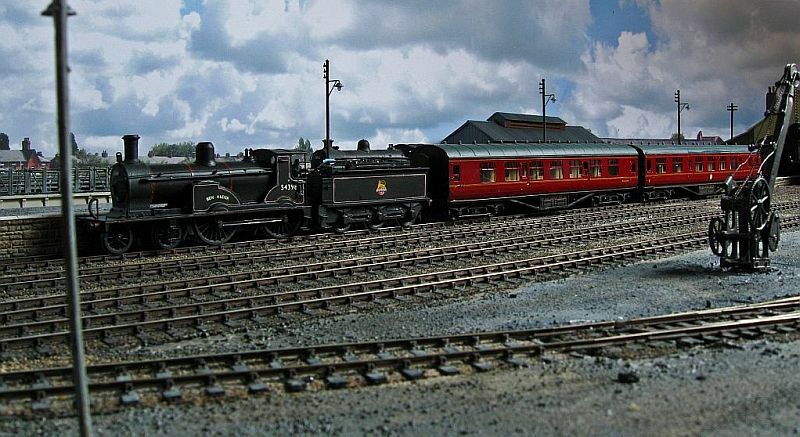 Cheers, the "problem" with Peco points is that they are HO gauge, to no real prototype geometry, but a generic product basically aimed at the worldwide HO market, and use flatbottom rail as opposed to steam era bullhead type that does sit higher on the sleeper. That said, they are reliable and offer a practical quick way forward to those not keen on point building, but can be tweaked into looking a bit more British. Trimming off the various gubbins around the tiebar helps improve matters, including the spring mechanism if your control method incorporates this.The chairs make the biggest impact though. The figures in the yard- the guy with a grey jacket is Airfix- now Dapol,IIR, and the other two are white metal, but am not sure where they came from now- perhaps Dart/ Montys- I know finding good 4mm figures is difficult, hence the current dearth of passengers at the station. The chairs do seem to make a big difference Ben. Firstly, where do you get them from and secondly, are they a "complete" chair that you cut down and just use them externally ? The chairs are from C&L - http://www.finescale.org.uk/index.php?route=product/category&path=346_347_348 -and are some I had lying about from an abortive point building project. They were cut in half and superglued on to the point sleeper after I removed the moulded track fixing. I'll come back to this once I get some more and see what can be done with the inside of the rails. The Peco Ponts look good with the cosmetic chairs added. 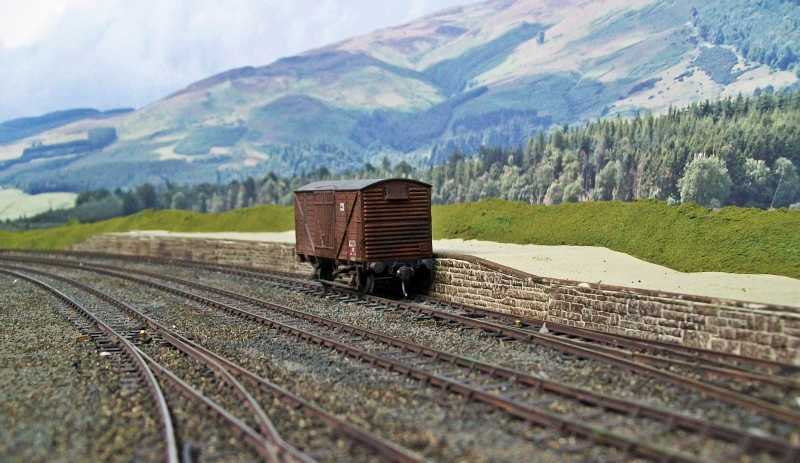 What do you use for the plain track? Is it C&L or SMP? 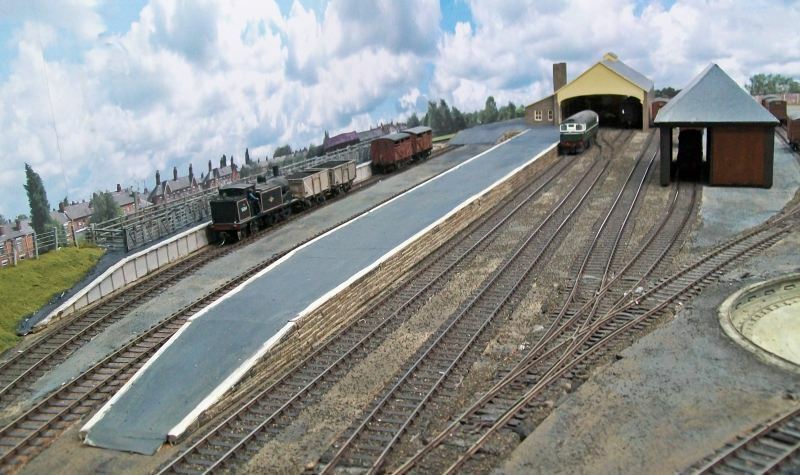 Thanks, it does make a big difference to the whole layout, with the track now having an integrity that was lacking when the point rails were so obviously different. I use C&L track- I think it looks better than SMP- and it looks British in a way that Peco code 75 or 100 never can. 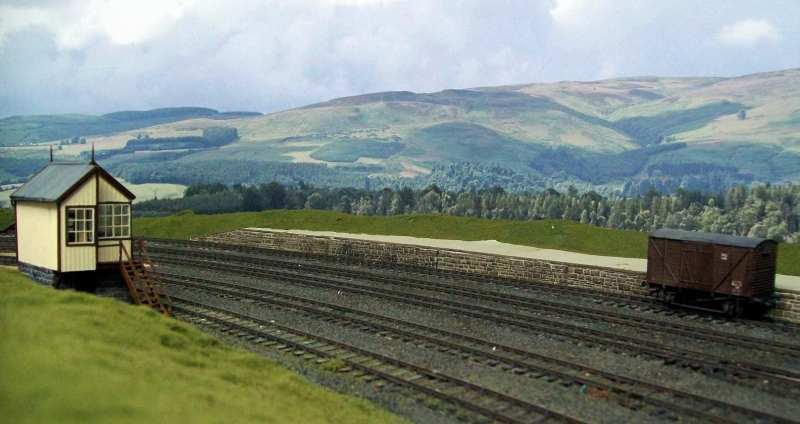 The points are tolerable- often sleeper spacing is tighter than plain track anyway- once ballasted. As an aside from the point work, I spent some time today in the attic playing with the light coming through the Velux. Here are some of the results. We know it's a superb layout Ben but the lighting is wonderful. It brings out such a lot of relief whilst adding loads of atmosphere. As Ted says, you could be there. 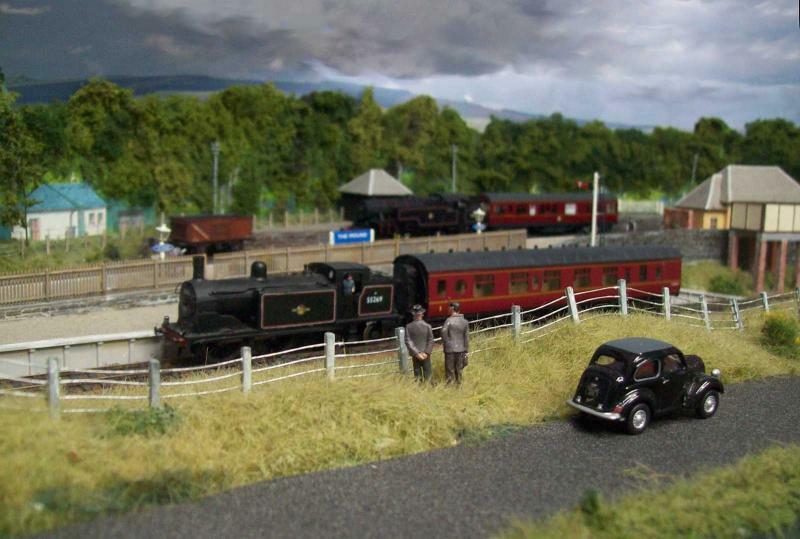 Lovely models, lovely scenery and lovely lighting. Lovely work as usual Ben. Thanks guys- it really a case of the camera and suitable light, but it is producing interesting results.I hope to catch more over the next couple of months before the light fades too much. Almost out of images FTM, but here are a couple more- then its a question of trying to find some more. Ben, those pictures are absolutely fantastic. Wonderful modelling and the bit of natural lighting adds a special something to what is already great. I really enjoy watching the pictures of this thread, great work! Ben Alder wrote: Thanks guys- it really a case of the camera and suitable light, but it is producing interesting results.I hope to catch more over the next couple of months before the light fades too much. Almost out of images FTM, but here are a couple more- then its a question of trying to find some more. 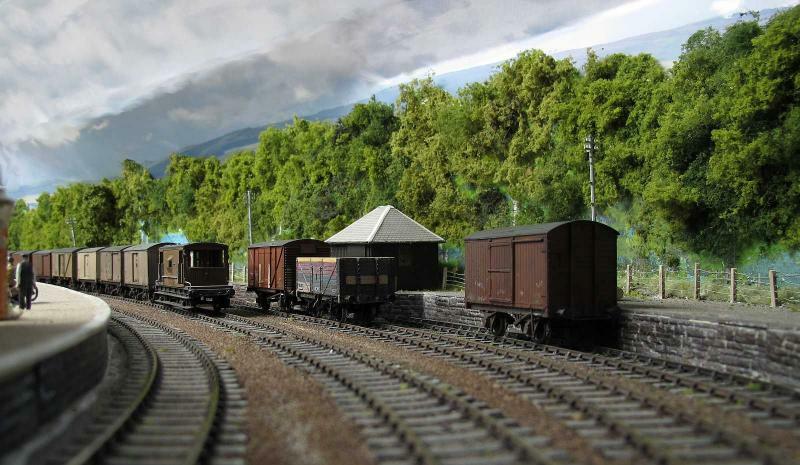 Great pictures Ben, as for finding some more.....it's amazing how many scenes can be created by just moving loco's and wagons etc about and it's not until the camera gets right down on the track that things start to look real. Those "cruel close ups" of the vans are amazing Ben. Not a thing out of place. Great modelling and great camera work Ben. Keep 'em coming. 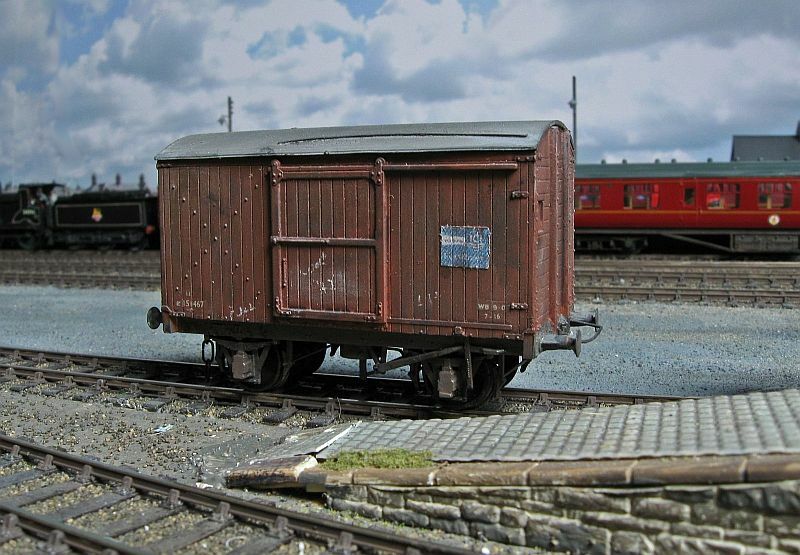 Like the photo's Ben, what's the secret with the close up of the wagons with the chalk marks on. Has to be a combination of very good eye sight/magnifying glass and a small thin piece of chalk. Very though what ever method you use, well done indeed. J**z, what a response- much appreciated, thank you. I'll talk more tomorrow, but spent some different hours in the attic today, and have a further selection prepared. A couple to begin with. I have found that getting as low a shooting position as practical helps with creating that illusion of semi-reality, and the use of natural light and shadows helps suggest that what we are seeing actually is there The C&L "00" track with its British sleeper spacings also helps this in a way Peco can never do. Various combinations of manual settings and light positions are fired away, with most of the shots discarded, and those that are left are cropped and slight adjustments are made, usually tweaking the backlight function, which brings out a lot of detail more or less hidden in the original. I don't bother with altering colours or anything like that- just see what the camera can find on its settings. All good fun! Anyway, that's it for now- sleeper chairs have arrived, so that's me going to be busy for a while. Thanks again for the interest. How could I have missed all this for so long???? Thanks, Bob, for front-paging Ben's work, thank you, Ben, for a very enjoyable mornings read about some quality work and the info about True Textures even if you do get a cosmetics company on first just Googling 'true textures'! Cheers, plenty more where the last lot came from! 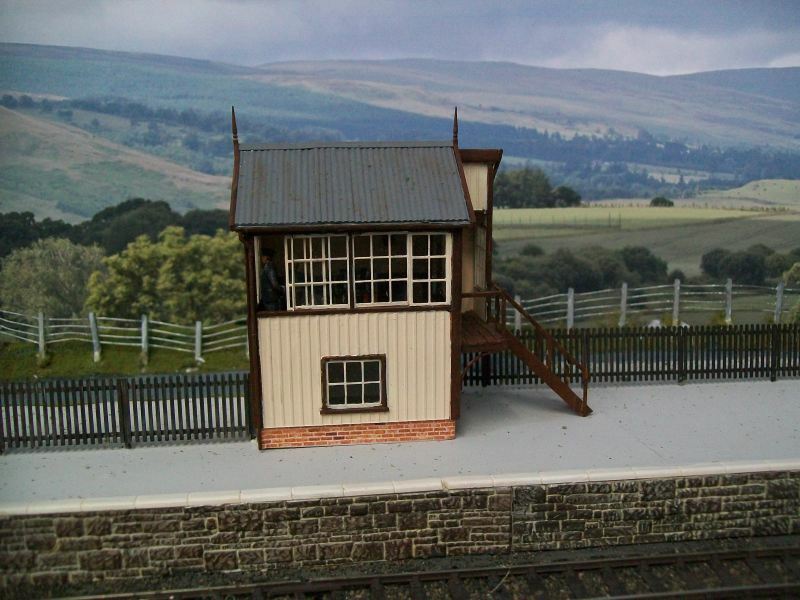 Firstly, a WIP on the Peco point alterations- most of them fitted on one but unpainted as of yet. I am unsure about the inside chairs- experiments suggest that anything that looks promising tends to foul flanges, so this side may be left alone. It does look much better to the eye though- the track flows smoothly without the intrusion of unchaired flat bottom rail . One or two more daylight pics now. A cracker for a highland moor and I see what you mean about the C&L sleeper spacings (and depth) making the track look so much better than Peco. 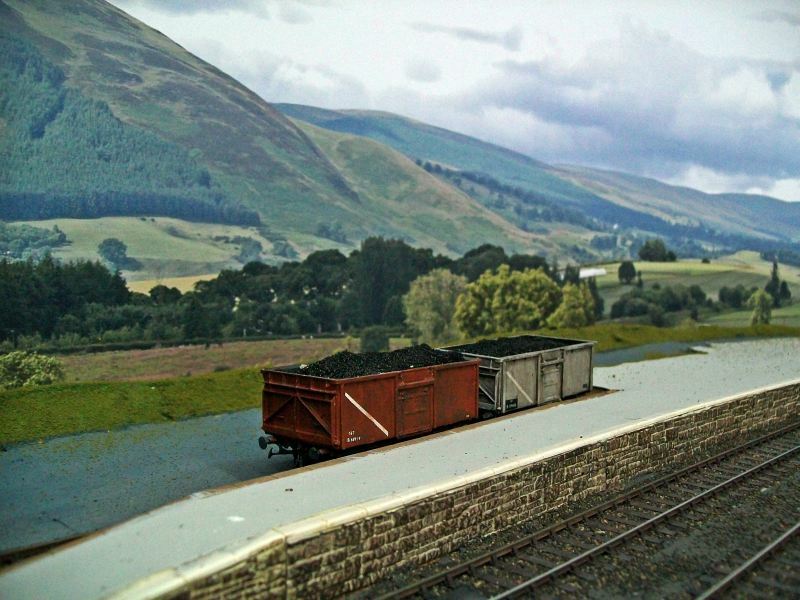 It's a combination of many things that makes your shots look so realistic but the track certainly plays it's part. Good to see a pannier this far north ! 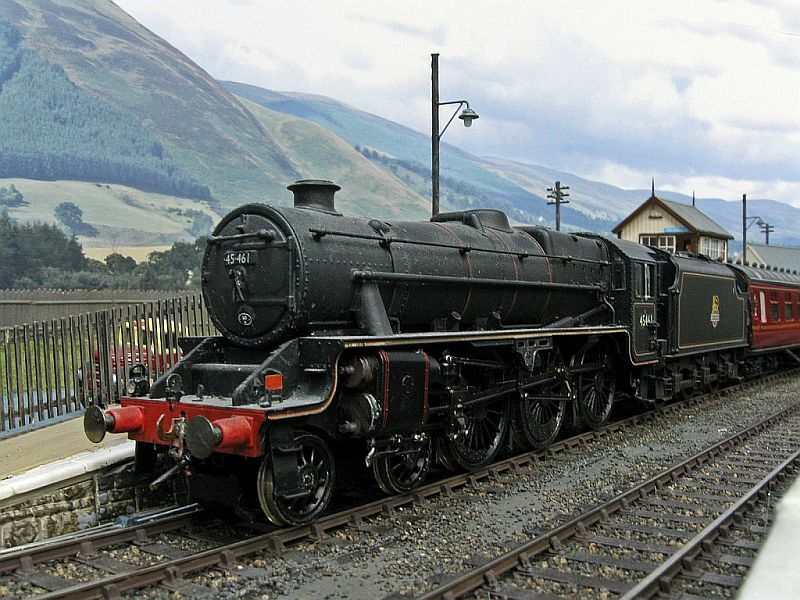 Yes, one of two sent to work the Dornoch branch and looked after at Helmsdale. This really did happen! I could walk out across the track and up into the hills, book me a ticket, I'm coming on holiday! 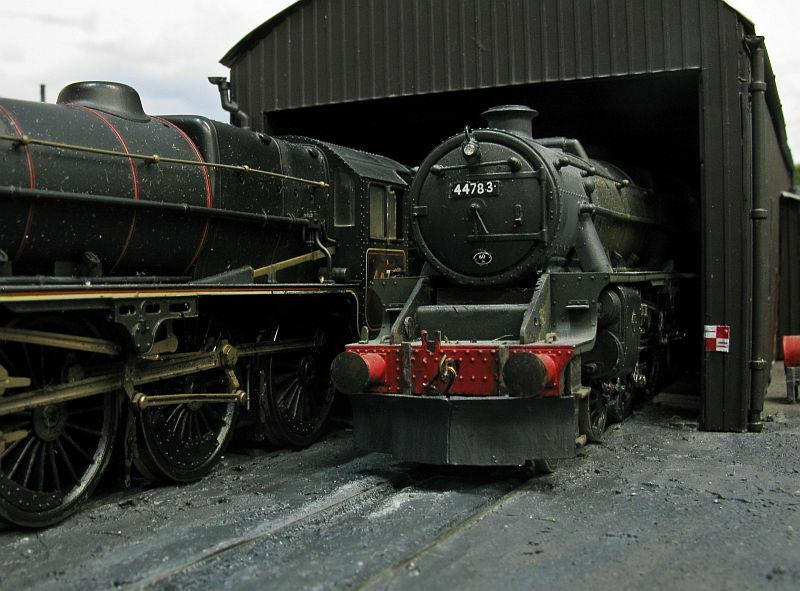 Yes, if only....I'd turn round and see what was on shed, and wait for a Black Five to pull up for water and shunt off some coaches.... Dreams..
Ben, do ever get problems with the added chairs as those two in the last picture look a little proud? I just love those shots, so atmospheric! Phil.c wrote: Ben, do ever get problems with the added chairs as those two in the last picture look a little proud? Still haven't trimmed them down- it's easier to fit them roughly and run a scalpel over them later.This isn't scale modelling, but the visual impact is much improved-...... watch this space! Ted_ wrote: I just love those shots, so atmospheric! 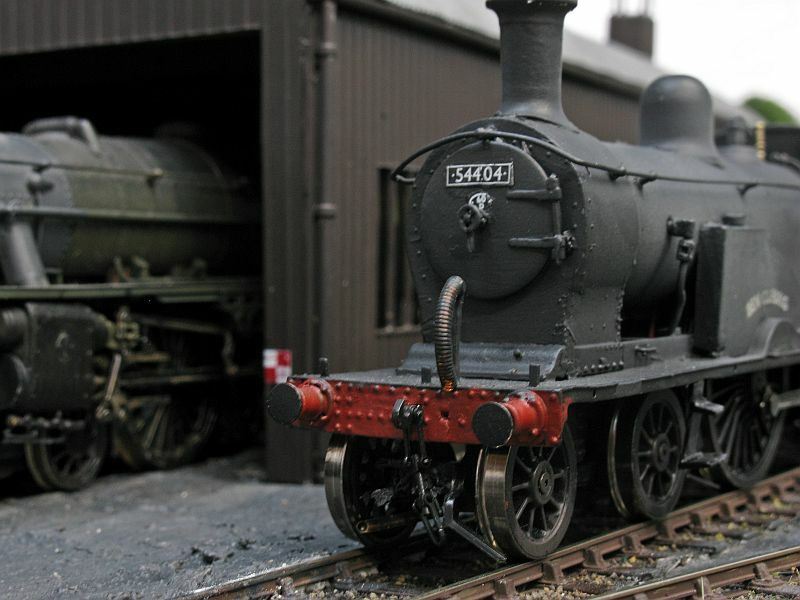 Thanks, a mixture of good backscenes and natural daylight are the main ingredients, plus me getting my finger out and tackling a thirty plus year old white metal loco kit stash. 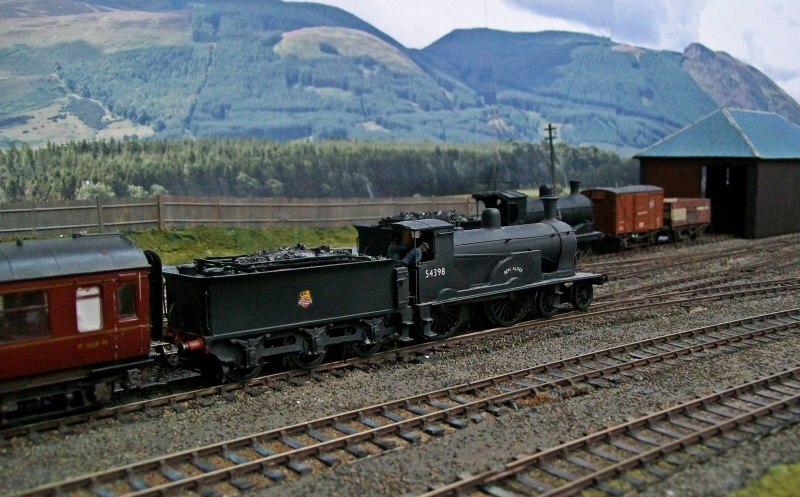 Realising that it was most unlikely that I was going to live long enough to see some/any Scottish R-T-R locos has given me a creative burst, aided by judicious use of Bachmann and Hornby chassis to provide a meld of pre -group locos with the superb running qualities of current releases. I'm actually glad I put off building these over the years, as the chassis and motors of these kits are mostly fit only for the bin. Brilliant Ben,absolutely brilliant.Your efforts are much appreciated. 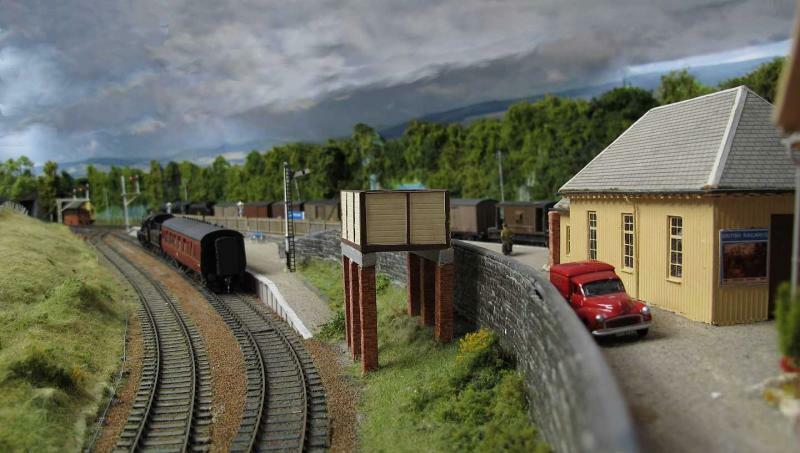 Many thanks for the kind words- there's still a lot to be done with the layout, but I do think I have managed to capture some sense of time and place,even if the timescale is a bit elastic, and to that end am pleased with the way it is turning out. 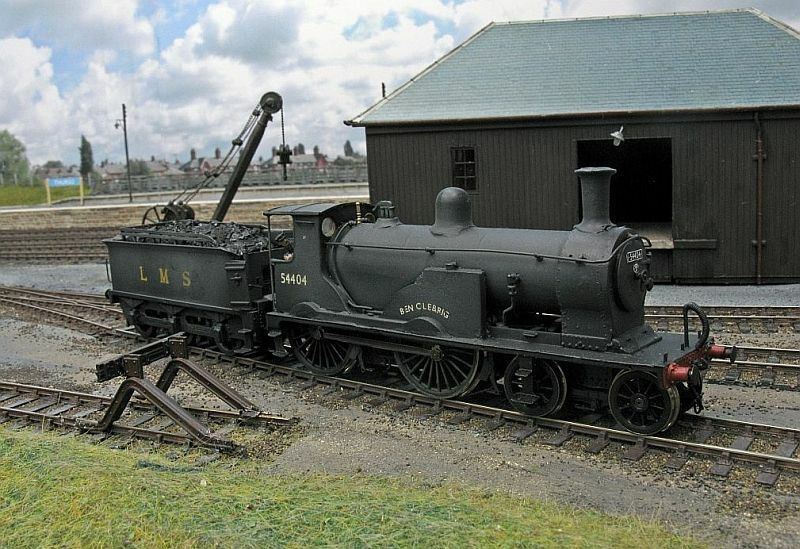 It probably helps that there is very little out there to compare it against; there being hardly any late steam era HR models around, it seems, and modelling a prototype is fairly straightforward- you just copy what was there! And as Bruce Forsyth would say " and that's all there is to it ". If only.....some fantastic work there, as said previously, you can feel that Scottish chill and could just walk out and touch the scenery. I can only aspire......but I'll tell you something, it's fantastic that every now and again, you get treated to something like this that gives you a lift and shows you what is possible. Sir Chris Hoy.........Andy Murray...........Ben Alder...... The set is complete. Ben Alder wrote: .....................................................................- you just copy what was there! And therein lies the rub !!!! Chair laying has reached a just about there stage, with them in place and trimmed and painted, now undergoing running trials to spot any protrusions that cause bumping. Still not a total solution, not that you'll ever get that while using Peco points- or 16.5m for that matter, some may say- but hopefully an improvement on what was before. It certainly is to my eyes Ben. Outstanding stuff, Ben, dirty enough, clean enough, never mind the 'point' remark Post 229 is one of those 'Is it real or a model' pictures if ever there was one. Thanks, I'm quite pleased with #229- it was a snapshot in sunshine just as a filler, but the camera captured it well. Pity about the point in the foreground- a year ago I wouldn't have fussed about it but now it grates! all changed now, and I just have to try and catch the moment again . This new (second hand) Canon is producing some cracking images, and I'm v. pleased with it. A couple more from last night to show some more of the modified trackwork- next job is some HR and LMS bufferstops- more of these little things that help set the scene. And one of Ben Clebrig pottering around at Thurso. dooferdog wrote: Outstanding stuff, Ben, dirty enough, clean enough, never mind the 'point' remark Post 229 is one of those 'Is it real or a model' pictures if ever there was one. 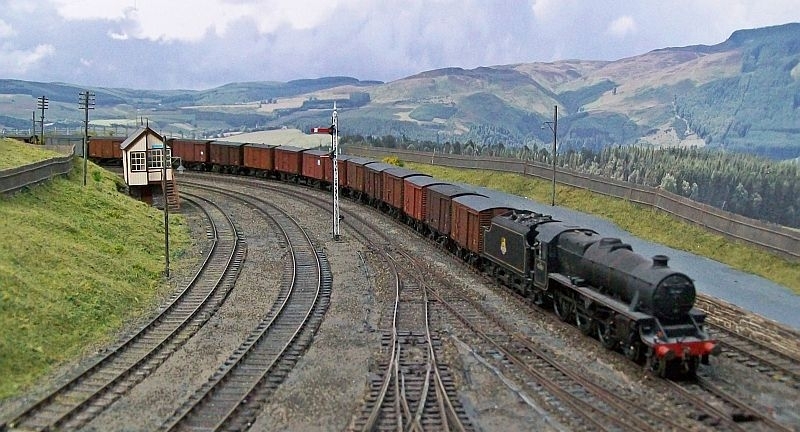 I'm convinced that if you showed some of these pictures to people in the street (who knew nothing about railway companies) they would ask if it was somewhere in Scotland or Wales and how long ago it was taken. Thanks- atmosphere is what I am trying to achieve- it's an elusive beast!. Just for a change, here is one of the Sulzers that put an end to steam in this part of the world.